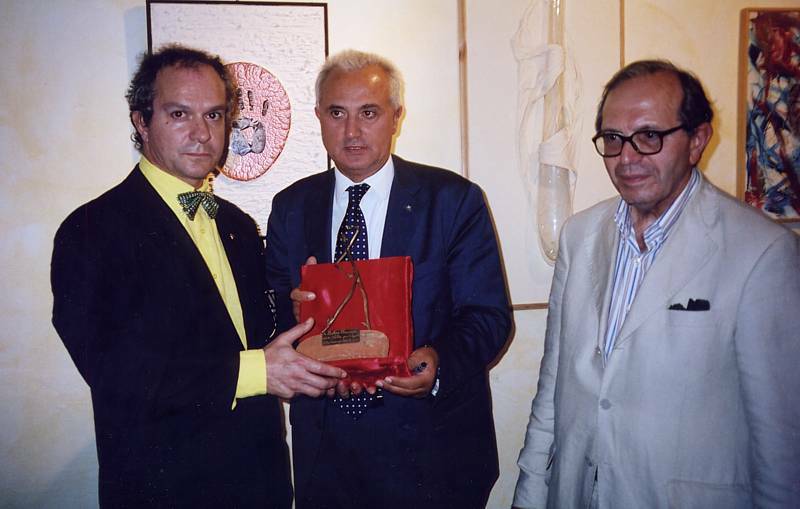 "Giorgio Bortoli - Premio letterario sulla poesia Lettera d'Argento e Festival di musica leggera Gondola d'Oro"
From left to right: The sculptor Giorgio Bortoli, Marino Bartoletti (RAI journalist, commentator), Domenico Stanziani (owner Restaurant Al Colombo), Pino Donaggio (musician and composer). 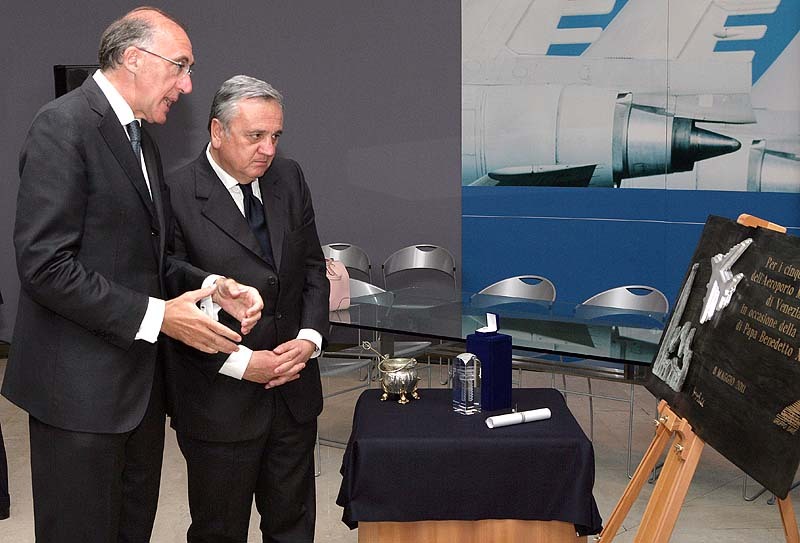 Delivery of the model of the monument to the Mayor of Venice Luigi Brugnaro pictured right. 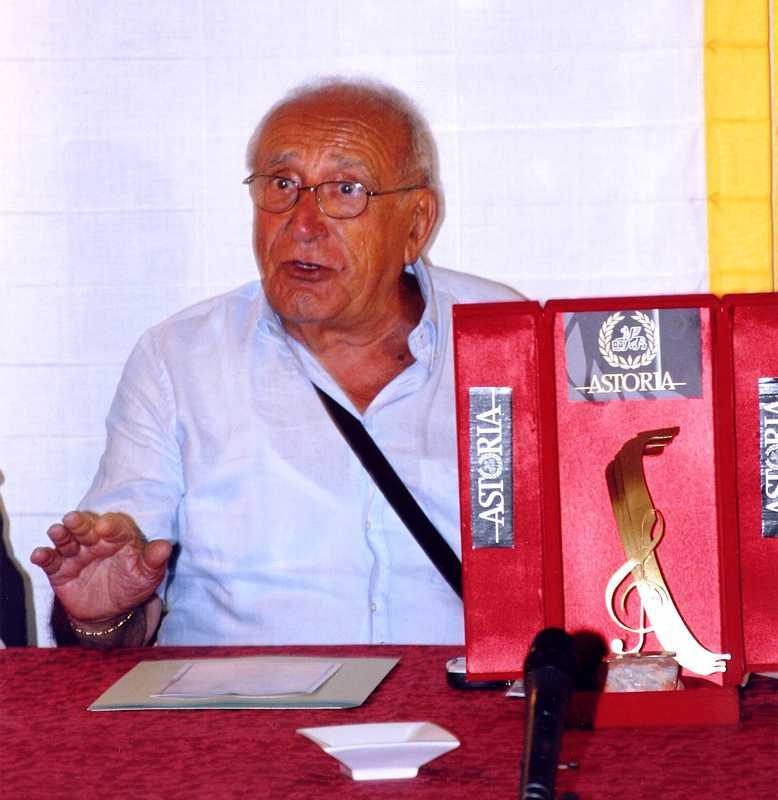 At the center of the master Giorgio Bortoli. 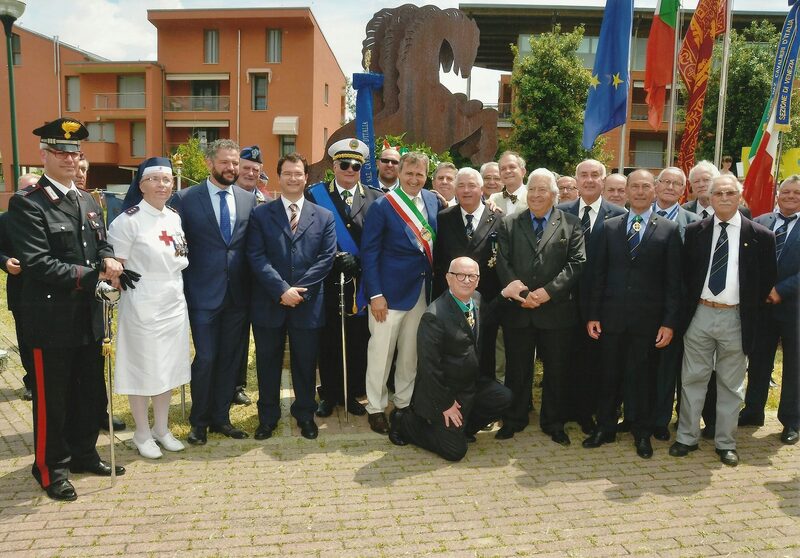 Group photo with various municipal authorities and the monument to the Knights of Italy, made by Giorgio Bortoli, clearly visible behind the group. 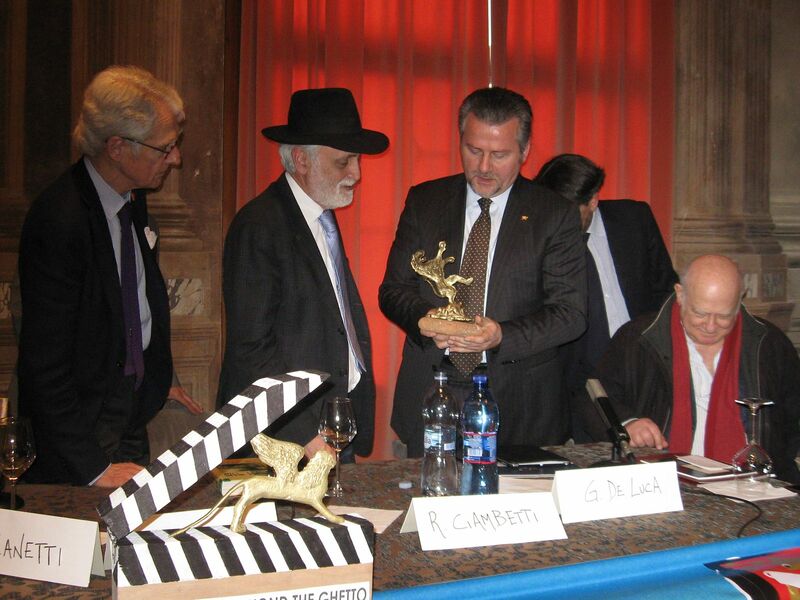 "... Davide Federici, a local journalist, and the Venetian sculptor Giorgio Bortoli were present, and Rabbi Bahbout, who is highly regarded after two years in the community, seemed entirely in his element as the talk rambled around art, politics, history, cinema and food ...."
where this year a long, rich history is commemorated. Though you can still see the recesses in the walls where the hinges of the portals once hung, the Venice ghetto has not been a prison since Napoleon seized the city and tore down the gates in 1797. Today, no barrier or signpost marks where Venice ends and its ghetto begins. Cross a canal on an arched bridge, duck through a sottoportego (an alley tunneling through a building), disappear down a vent in the urban fabric  you come and go just like everywhere else in the maze of this island city. But linger long enough in the Campo di Ghetto Nuovo, the generous, frayed, tree-flecked plaza that anchors this corner of Cannaregio (the quiet northwest quadrant of the city) and youll feel the wall of the past closing in. Half a millennium of history does not transpire without stamping the soul of a place. Established by decree of Doge Leonardo Loredan on March 29, 1516, the Venice ghetto was one of the first places where people were forcibly segregated and surveilled because of religious difference. 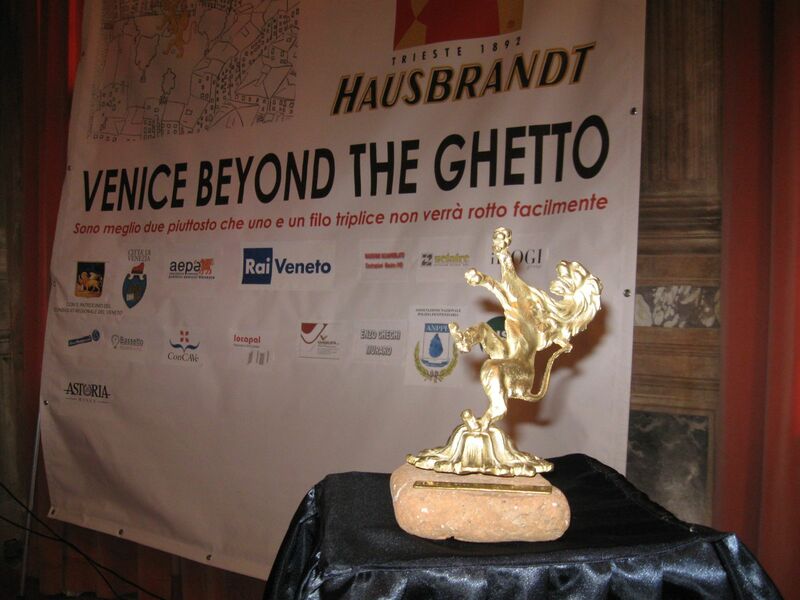 The term itself originated here; the area had been used as a foundry (geto in Venice dialect) and over time the neighborhoods polyglot residents corrupted the word to ghetto. 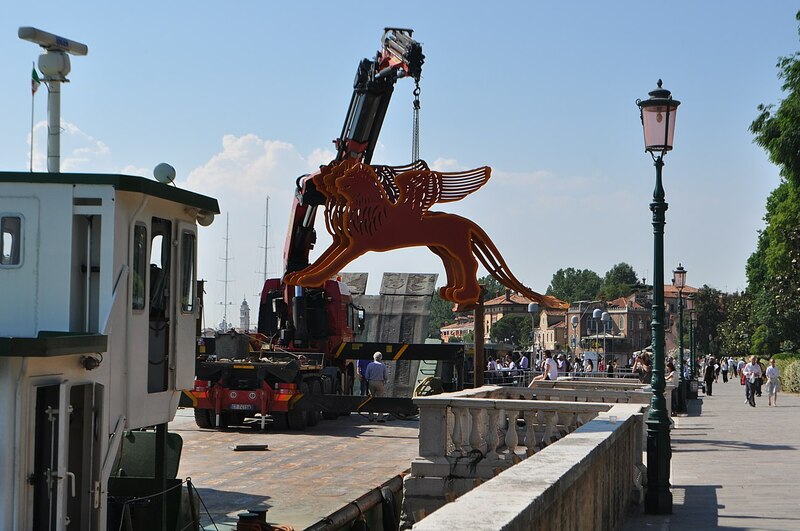 I traveled to La Serenissima in December to see how the city was gearing up for the anniversary of the establishment of the ghetto. 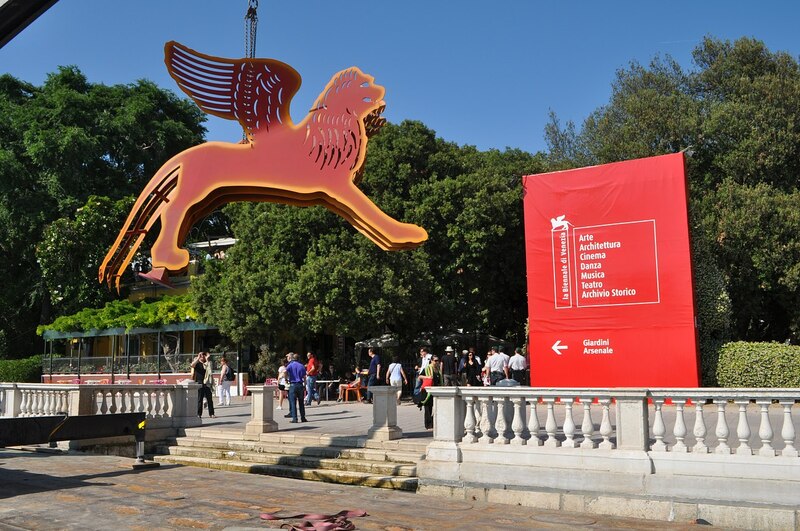 A major exhibition called Venice, the Jews and Europe: 1516 to 2016 (on view from June 19 to Nov. 13) was being planned for the Ducal Palace, and during the last week of July, Shakespeares Merchant of Venice will be staged (in English) for the first time in the confines where its most hallucinatory scenes take place. Venice being Venice, there will also be glittering parties, celebrity-filled fund-raisers and fancy dress galas, starting with the invitation-only performance of Mahlers First Symphony at La Fenice opera house on March 29. But in the course of my visit, what I became most curious about was the mood of the current Jewish community of 450 people. Venice is such an impossibly beautiful fantasy, it seems astonishing that ordinary people, Jews among them, actually live there. How, I wondered, did deep-rooted Jewish families feel about their past  and future  in this ancient, vulnerable city? Jewish merchants and bankers were vital to the flow of these commodities, but as Venice declined, the Jewish presence dwindled. By the outbreak of the Second World War, Jewish Venice had shrunk to 1,200 residents. Today, with the citys total population hovering around 58,000 (down from 150,000 before the war), there are about 450 Venetian Jews left, only a handful of them residing in the ghetto. So now the ghetto is just a shell? I wondered aloud as Ms. Crepaldi led us across the campo, over a bridge, down a street of intriguing-looking shops, and into a tighter, grimmer square (the Campiello delle Scuole or little square of the synagogues), flanked by the two Sephardic scuole. Calimani and Sullam  two of the surnames inscribed on those plaques  appeared in tiny letters by the buzzer I pressed at 10 oclock the next morning. Riccardo Calimani, the esteemed historian of Italian Jewry and the author of a book about the Venetian ghetto, had given me very precise directions to his home off the Strada Nuova (a rare rectilinear thoroughfare stocked with shops catering more to residents than tourists). My fathers family arrived in Venice from the north of Italy in 1508, he said, slowing his Italian down to a tempo I could follow. My ancestor Simone Calimani was the author of a trattato morale [moral treatise], printed in the 18th century when Jewish publishing was flourishing here. 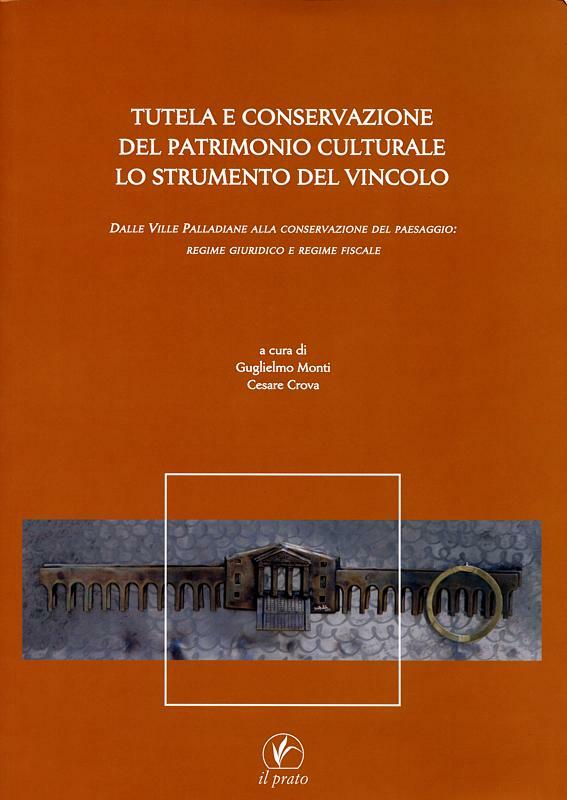 My grandfather was the cantor in the Scuola Levantina, even though our roots are not Levantine but Italian and German. The Venetian history of the Calimani family, I realized, coincides almost exactly with the history of the ghetto. The palace belongs to his wifes family, the Sullams, Spanish Jews who took refuge in Venice after the expulsion from the Iberian Peninsula at the end of the 15th century. 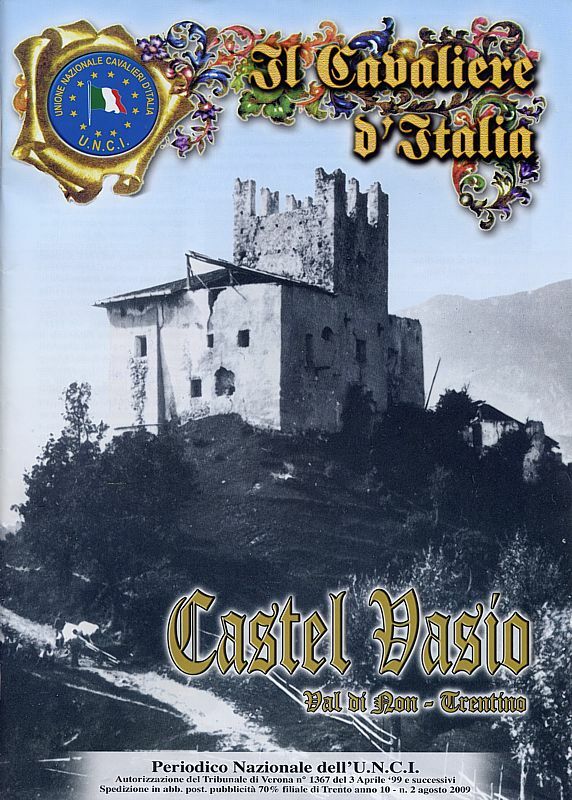 I knew, from reading Mr. Calimanis The Ghetto of Venice (1988), that Italian and German Jews, the first and poorest to settle in Venice, had been consigned to selling rags and running pawnshops, while the great merchants of Venice were later arrivals from Spain and the Levant. Their families abandonment of the ghetto is also typical. As soon as the ghetto was abolished in 1797, Jews with means fled the high-rise tenements  the tallest buildings with the lowest-ceilinged apartments in Venice  for more elegant, and spacious, parts of the city. But the ghetto remained the anchor of Venetian Jewry. Since travel by gondola was deemed permissible on the Sabbath, the observant had no trouble floating back each week to pray at the scuola of their choice. The Airbnb my wife, daughter and I rented just off Campo SS. Giovanni e Paolo  the heart of Castello, a still quasi-authentic quarter of working families, schools, neighborhood bars and the municipal hospital  is perhaps half a mile as the crow flies from the flat of Donatella Calabi, a professor of urban history who curated the exhibition Venice, the Jews and Europe: 1516 to 2016. But even though Ms. Calabi had emailed me a map with arrows pointing the way, it still required several forays across the nearby Campo Santa Maria Formosa before I hit on just the right calle (street in the Venetian dialect). As we sat by the windows of her top-floor apartment watching the dome of San Marco go gray against the December dusk, Ms. Calabi spoke with animation of the coming exhibition at the Ducal Palace. 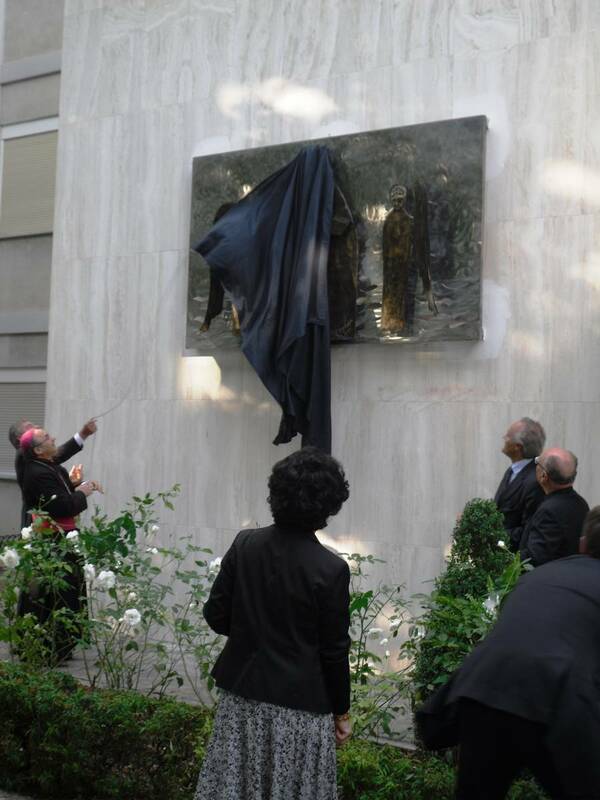 The ghetto provided an incredible occasion for cultural exchange she said, and the exhibit will focus on that exchange within the ghetto itself, between the ghetto and the city, and with the rest of Europe. Artworks including Carpaccios Predica di Santo Stefano (St. Stephens sermon) on loan from the Louvre, virtual reconstructions of the ghetto in various periods, and sacred books will conjure up the rich complexity of this exchange. Amos Luzzatto, an esteemed Venetian-Jewish intellectual and the past president of the Jewish Community of Venice, was present, and we chatted for a few minutes about the small Jewish cemetery on the Lido, the beit midrash (study room) named for his family that is still in use in the ghetto, and the book by his renowned ancestor Rabbi Simchah Luzzatto that I had spotted in the Jewish Museum. Mothers pushed strollers in and out of shadows cast by the teetering ghetto skyscrapers. Booted and scarfed Venetians clicked their heels across a bridge and disappeared into the inviting trattorias that line the fondamenta (bank) of the Rio della Misericordia canal. A small knot of tourists hovered by the entrance to the Jewish Museum, a charming warren of rooms stuffed with precious objects and books (and slated for a major makeover later this year under the aegis of Venetian Heritage, an international organization dedicated to preserving the citys cultural riches). I had just enough time before lunch to duck down an alley and browse the elegant Judaica pieces in glass and gold at Arte Ebraica Shalom. Did you know sarde in saor  sweet and sour sardines, a ubiquitous winter appetizer in Venice  is typically Jewish? the rabbi asked as the first round of plates appeared beside our glasses of prosecco. I was aware of the influence of ancient Jewish recipes on Roman cuisine, but it never occurred to me there was anything Jewish about the food of Venice, where shellfish (not kosher) figures in so many dishes. Id also never seen an Orthodox rabbi sipping prosecco. 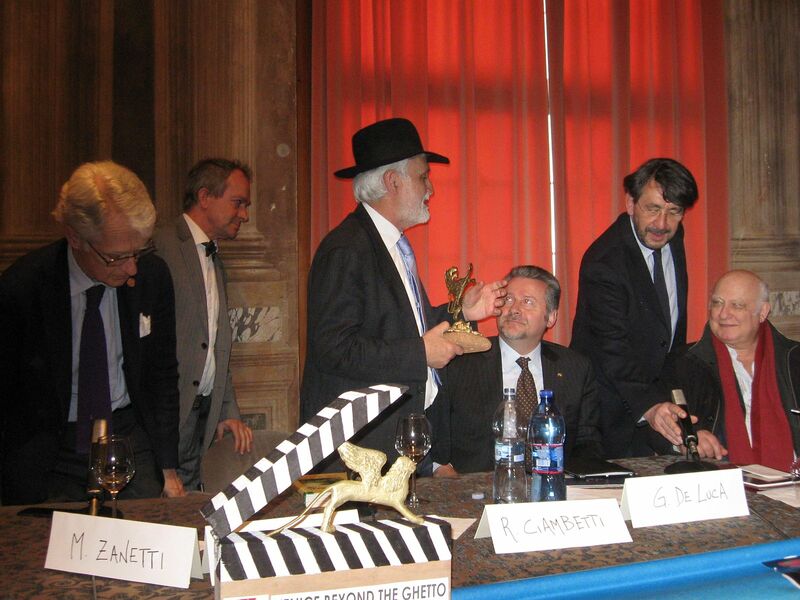 Id been in Venice less than a week, but already I recognized faces  Paolo Gnignati, the current president of the Jewish community; Elly, the strapping Israeli security guard who had warned no cellphones  theyre Orthodox! before letting me enter the synagogue; and of course Rabbi Bahbout, distinguished and elegant in his fedora as he chanted the Sephardic liturgy. Every Venetian I spoke to, Jew and gentile alike, had expressed deep pessimism about the citys future. But as I sat in this sacred space in the hushed, carless city, listening to the Hebrew prayers and Italian murmur, I felt reassured, not discouraged, by the evidence of time. Since the ghetto was first established, doges, merchant princes, Shylock, Napoleon, the Austrians, the Nazis have come and gone (and in Shylocks case, will soon return). Through that half-millennium of history, Jews have gathered on Sabbath mornings like this one at the serene cusp of winter to pray and gossip in the Venice ghetto. 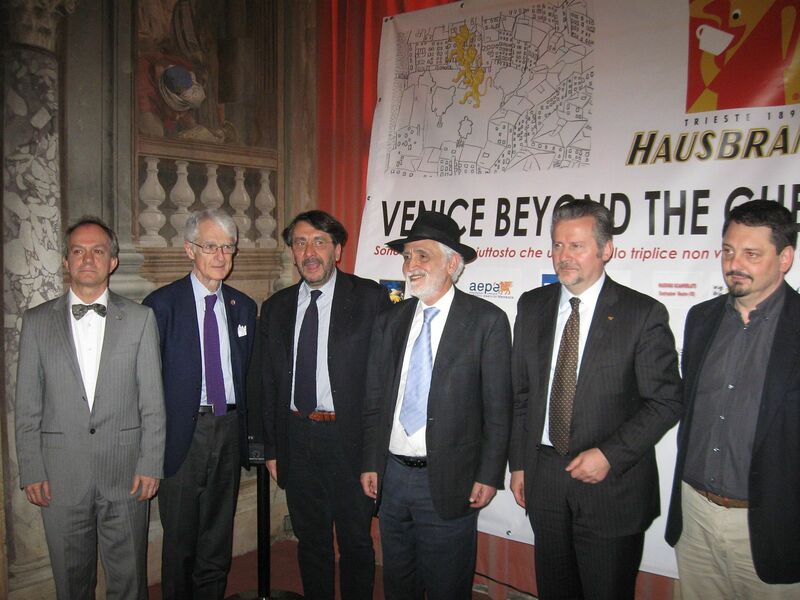 Venice, the Jews and Europe: 1516 to 2016 will be on view at the Ducal Palace (veniceghetto500.org/la-mostra/?lang=en, Piazza San Marco) from June 19 to Nov. 13. Tickets are 19 euros (about $20) and can be purchased online. 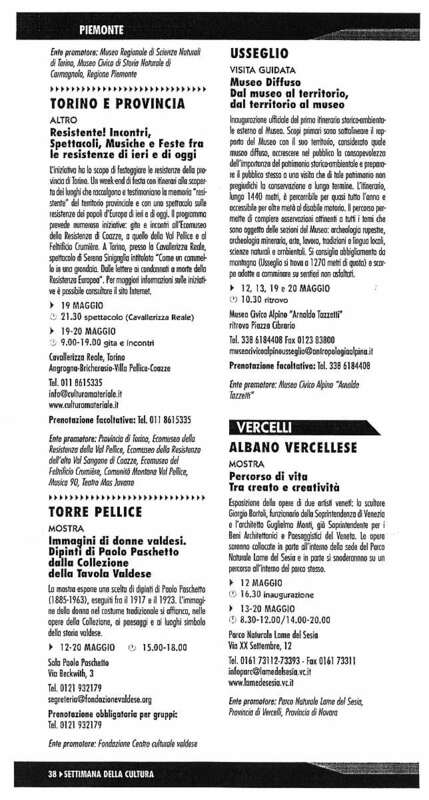 The Merchant of Venice will be performed outdoors in the Campo di Ghetto Nuovo on July 26, 27, 28, 29, and 31, with a rain date on Aug. 1. 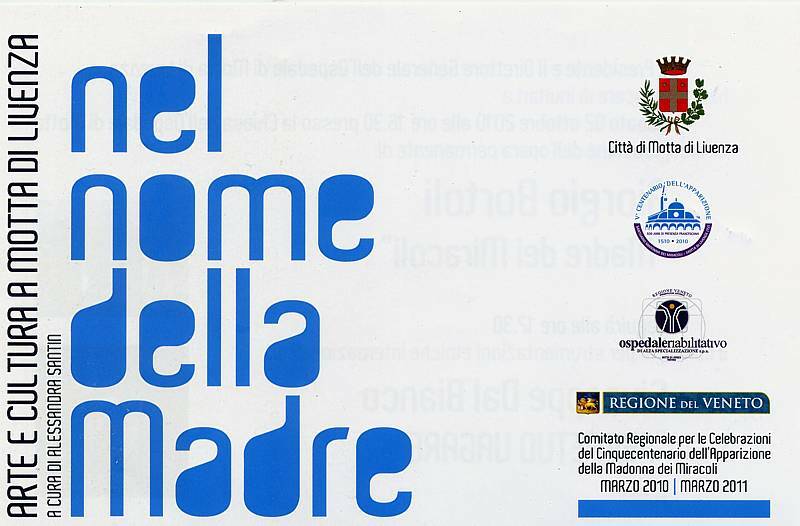 The production, in English, is being staged through a partnership between Compagnia de Colombari theater company (colombari.org/#!home/c1pbl) and CaFoscari University of Venice. For tickets and further information, see themerchantinvenice.org. 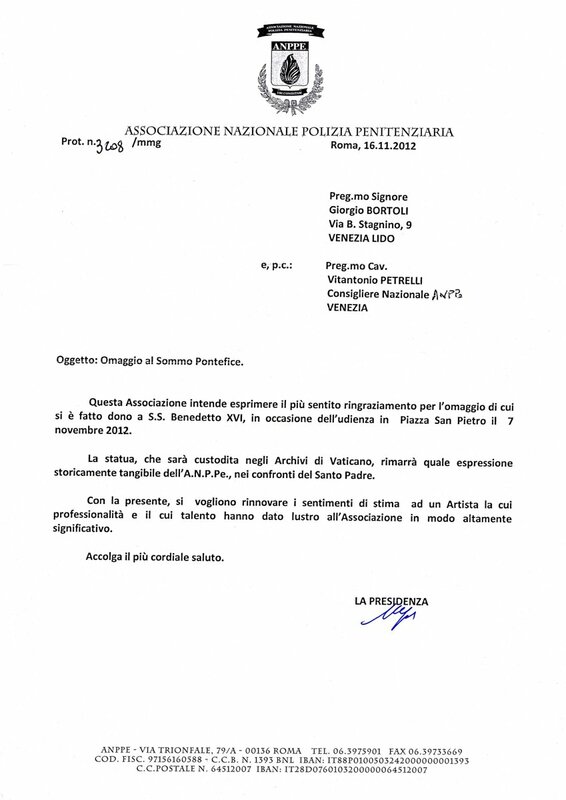 A representative of the National Penitentiary Police (ANPPE) met with the Patriarch of Venice Francesco Moraglia. 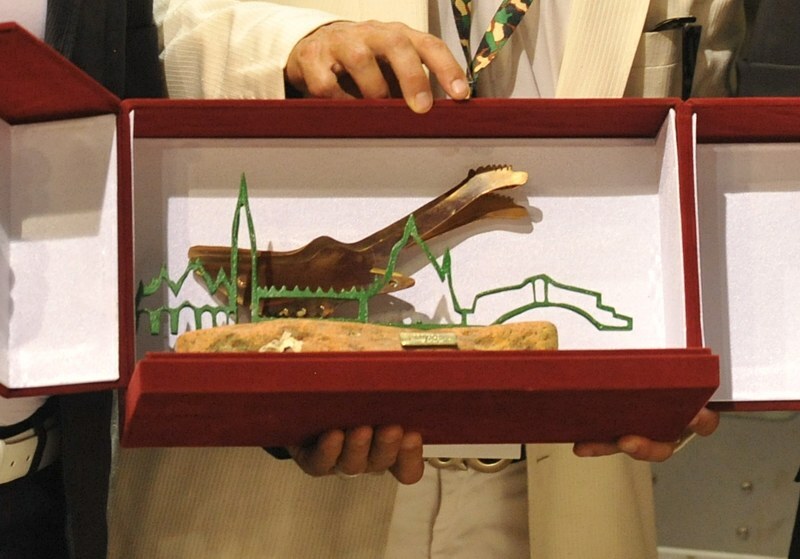 At Bishop Moraglia was presented with a sculpture created by master Giorgio Bortoli, a "Lion in moeca" with the cross, a symbol of peace. 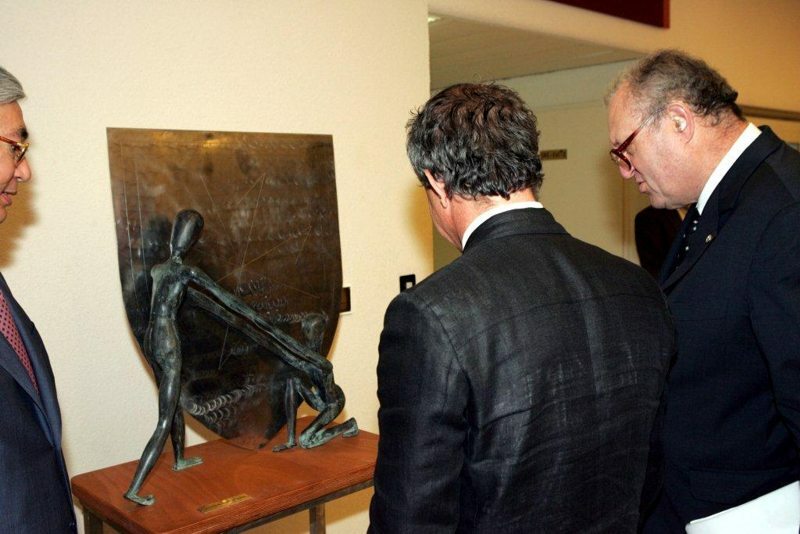 Satisfaction with the family and the author of the work in bronze. 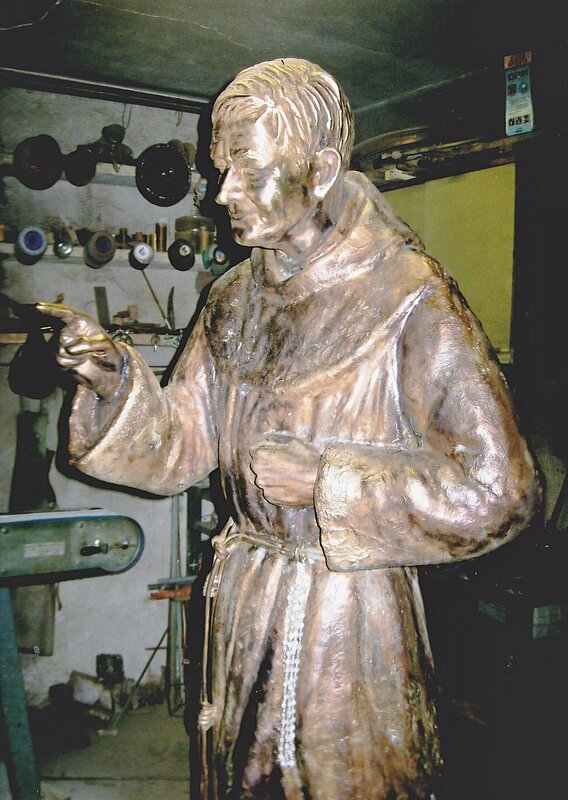 Has been taken recently by Fermi in Caldiero and already there are many people who have visited, offermandosi in prayer, to the bronze statue depicting Father Ildefonso Corrà, the angel of the Balkans. A forge these two quintals of bronze was the Venetian master Giorgio Borboli, APARENTAL artist known internationally for having made a bronze bust of Maria Callas in Monaco of Bavaria. 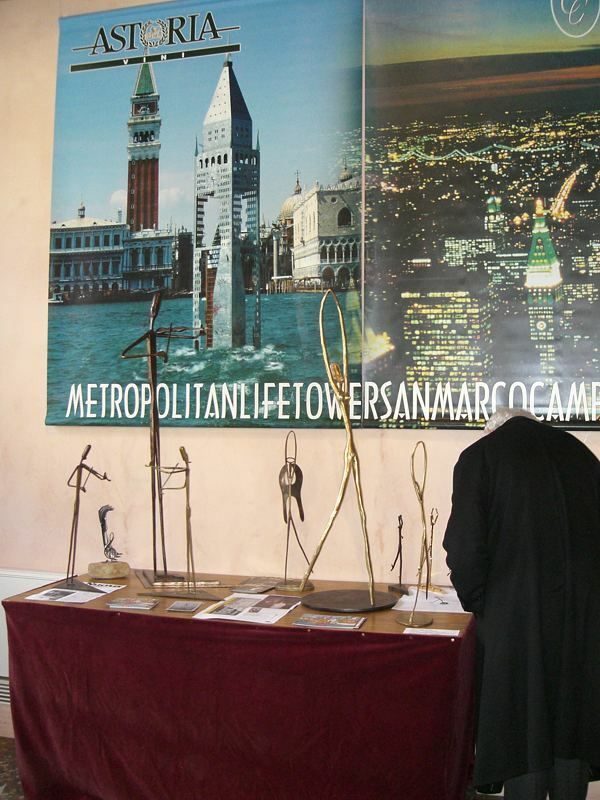 "I had a few photos of father Ilde to carry out the work," says Bortoli, "but I remember when Venice was in the convent of San Francesco della Vigna certainly was from him to give me inspiration." 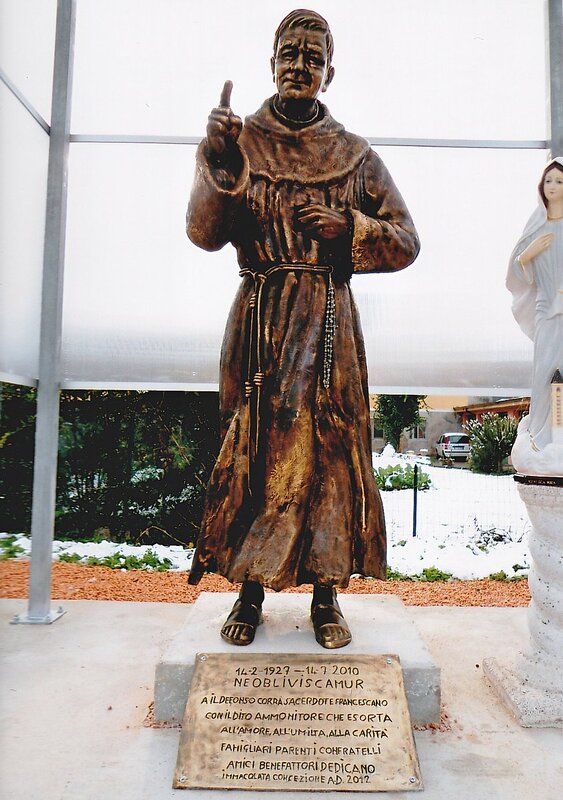 Are you satisfied with the artist above all the fact that the people who knew his father Corrà front of the statue of the monk Gypsy says "That's him. '" Intact Borboli has withdrawn as it was in the habit a posgualcito, penetrating gaze and that warning finger that has a raison d'esserg explains Umberto I run brother of Father Ildefonso: "It is to show them the right way, to urge a reflect on their work, to remind those who live in comfort that he saw with his own eyes where there is need. " 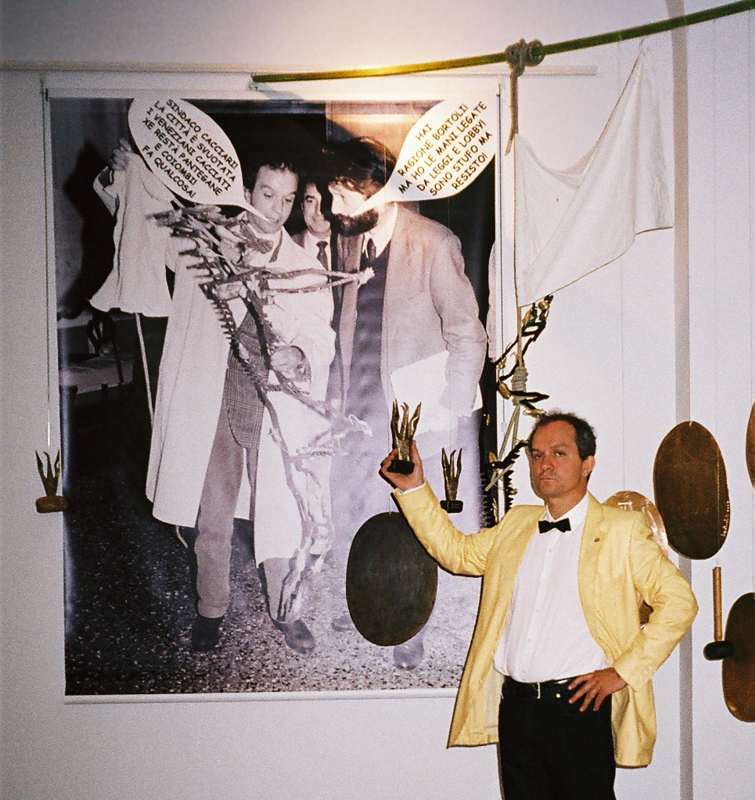 "I have a picture in which my mother also has the raised index finger," says Umberto "I remember that, during an argument I said that about me, that I had been sent from Caldiero in Malcesine, nobody cared. She took my hand and asked me what the five fingers I would be willing to be cut. Attonito said no and she replied: And you think that I would have a private one of my sons had it not been for his own good? Bortoli I sent to all of these aspects , "says Umberto," To ensure that he could find the right expression of the figure. " Showing that the Venetian master he did it are the people in front of the statue whisper: "There seems to see and speak to us as he once". M.R. 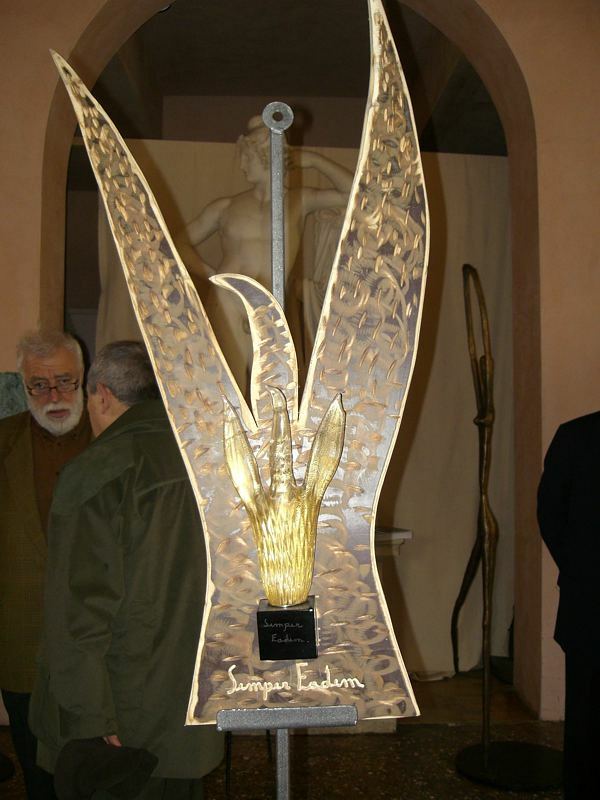 Donated to the Supreme Pontiff, S.S. Benedict XVI, from the National Penitentiary Police, a scultrura made by the master Giorgio Bortoli depicting a Madonna Nicopeja (Bronze cm 33 x 22). 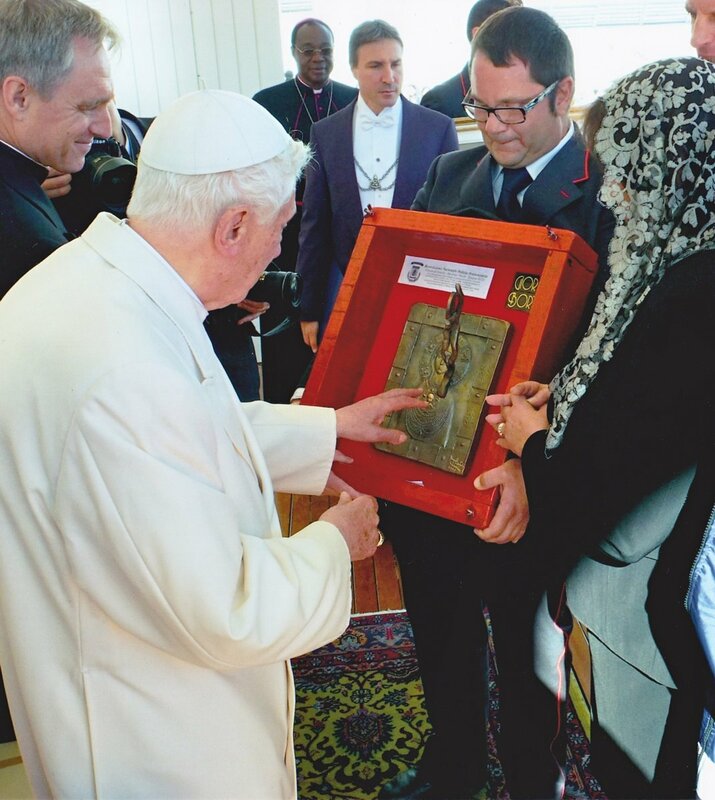 The association hopes to express my heartfelt thanks for the gift which has become a gift to the SS Benedict XVI during an audience in St. Peter's Square Nov. 7, 2012. 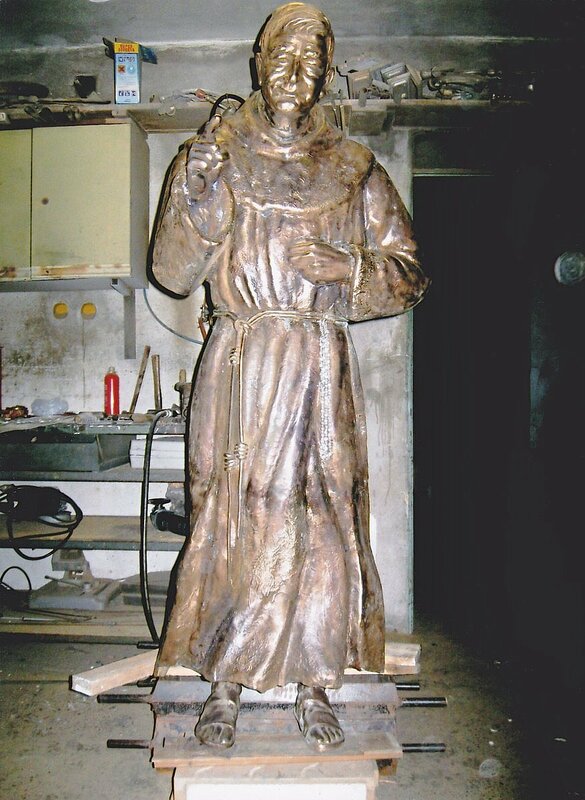 The statue, which will be kept in the Vatican Archvi, which remain historically tangible expression ANPE., To the Holy Father. 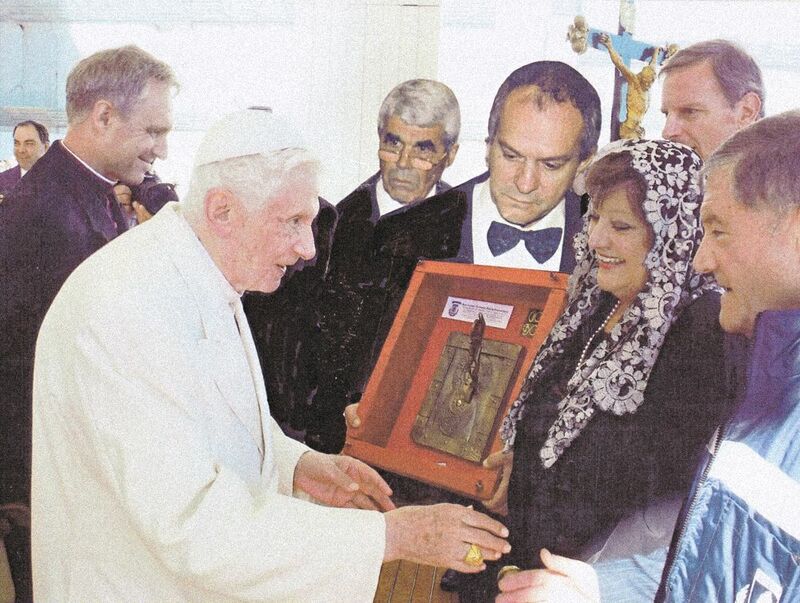 (TB) A sculpture with bronze cross, which reproduces the Madonna Nicopeja of the Basilica of San Marco, was given to the Pope by the National Penitentiary Police, on the initiative of prsidente of Venice, Vitantonio Petrelli. 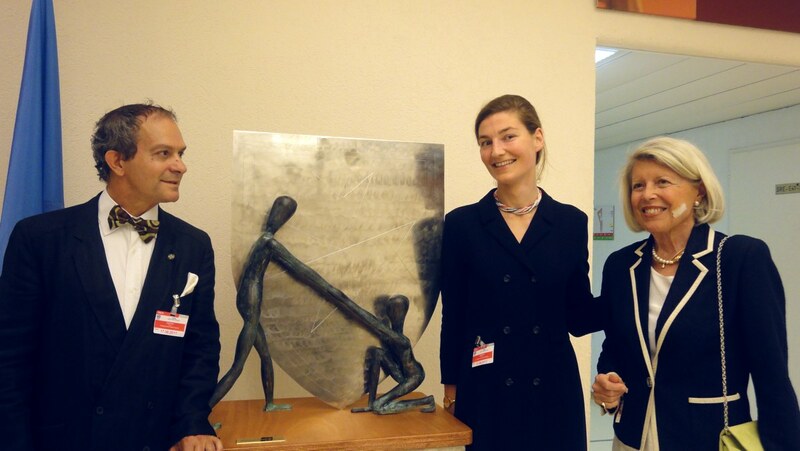 The valuable work of the Venetian sculptor Giorgio Bortoli, was delivered personally to Pope Benedict XVI by the deputy head of the prison, Simonetta Matone. 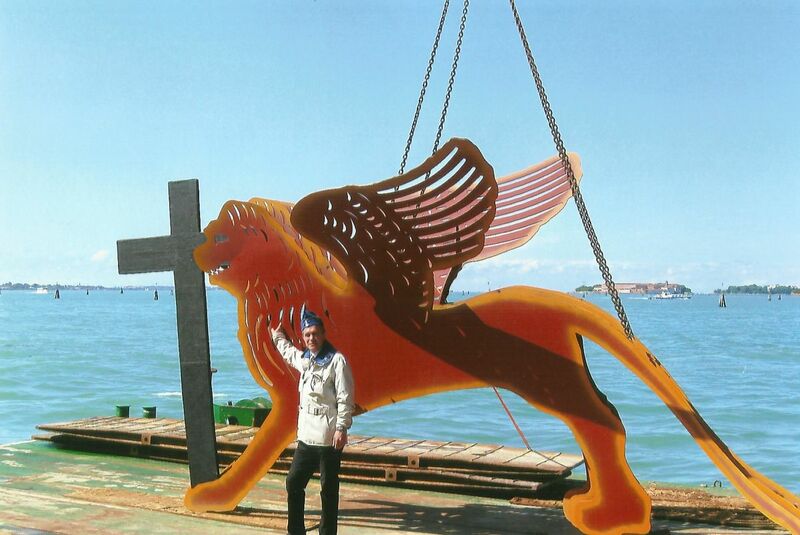 The work is distinguished by the sign of the heraldry section of Venice Association. 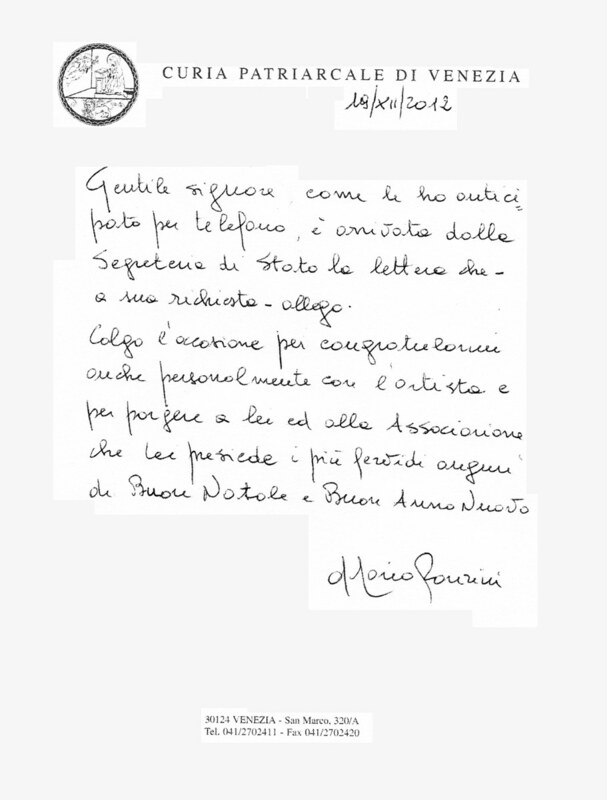 Letter of thanks from the Secretary of the Vatican State to the artist Giorgio Bortoli for the realization of "Madonna Nicopeja"
Letter of thanks from the A. N.Pe. 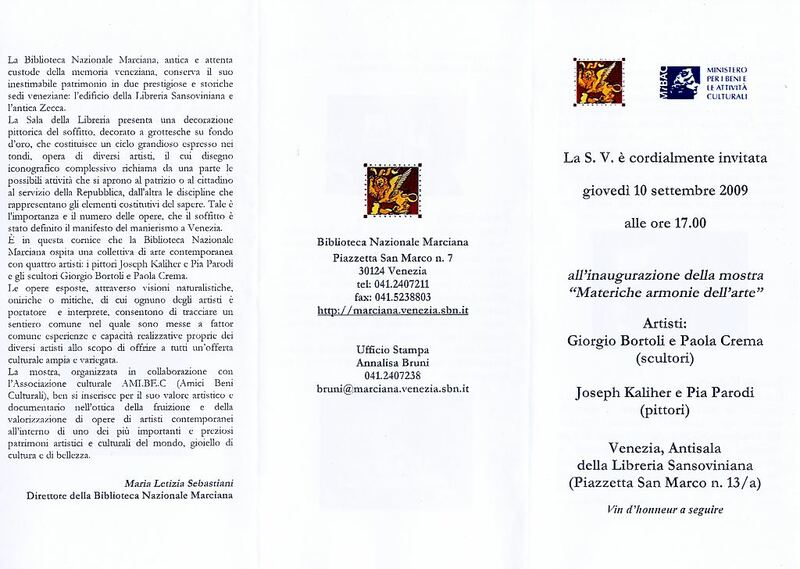 Letter of thanks from the Patriarchal Curia of Venice to the artist Giorgio Bortoli. 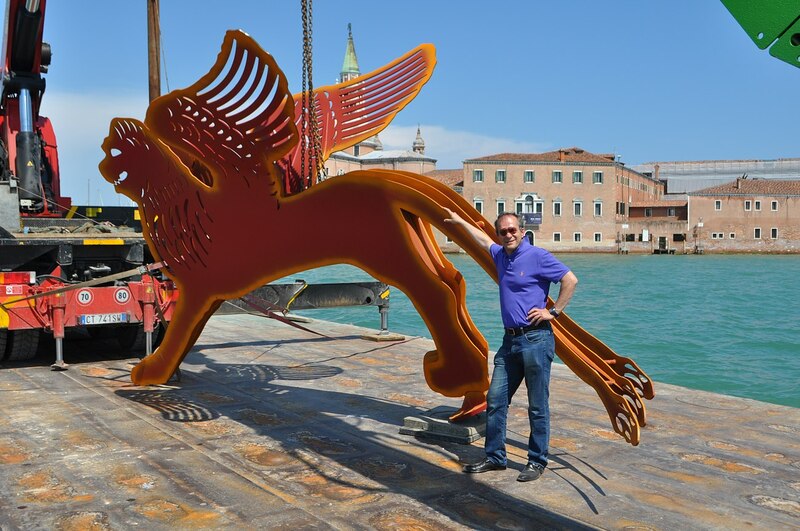 June 18, 2012 - The sculptor Giorgio Bortoli delivers the sculpture on the rebirth of the Phoenix to the Prefect of Venice, Domenico Cuttaia. 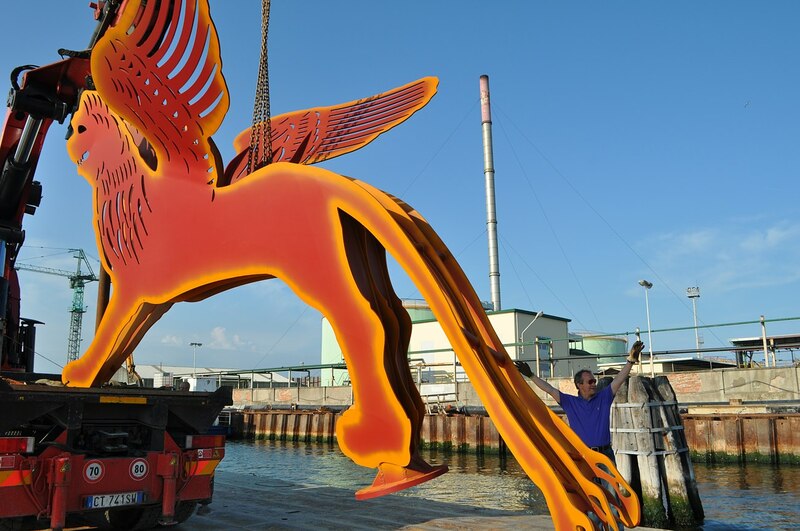 June 18, 2012 - The scultora reralizzata by Maestro Giorgio Bortoli, donated to the Prefect of Venice, Domenico Cuttaia. 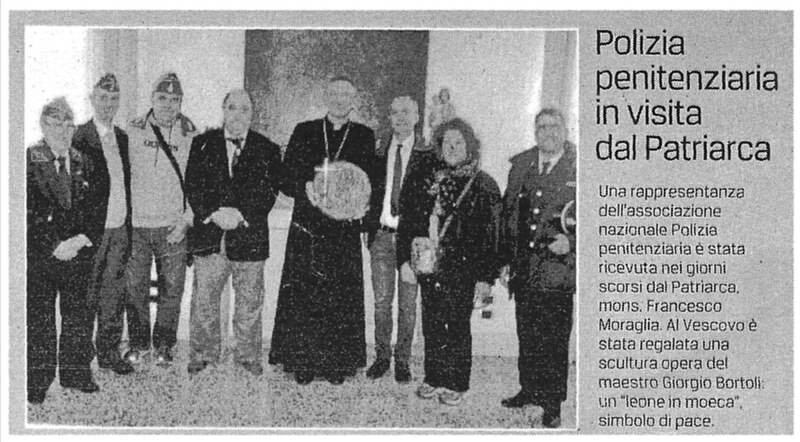 In recent days, a delegation of the National Police Prison, Section of Venice with the provincial president Jonelle Petrelli, Secretary Stephen Rubin and sculptor Giorgio Bortoli - was received by the prefect Domenico Cuttaia. 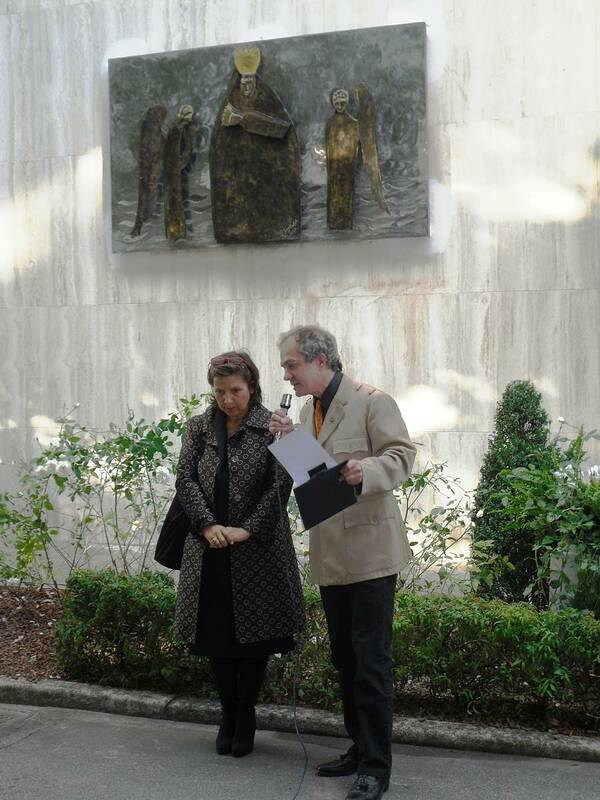 The meeting, submission of documents with which it is certified I'autenticità delivered to the prefect of the sculpture from procuatore head of the Republic, Louis Delpino, during the exhibition "Lest we forget", organized dall'Anppe Venetian April 28. 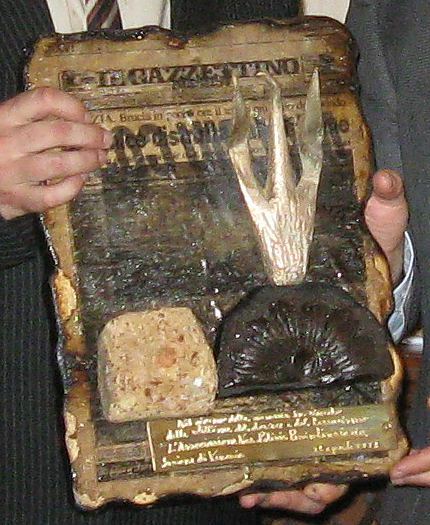 Giorgio Bortoli's sculpture is the first page of the special edition dedicated to the fire of the Phoenix 1996, Phoenix set in a bronze composed by the artist along with a piece of burnt wood of the theater. 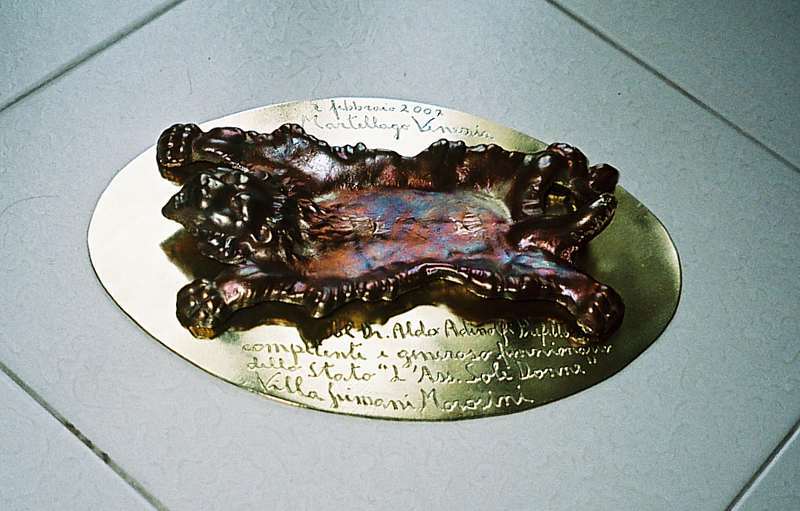 The basis of the work - on the occasion of the centenary of ricostruziome - I'artista set a piece of brick of the historic San Marco bell tower collapsed in 19O2, recovered along with other pieces by the sculptor himself, during some of his diving in the Adriatic, where the bricks were sunk sunk. 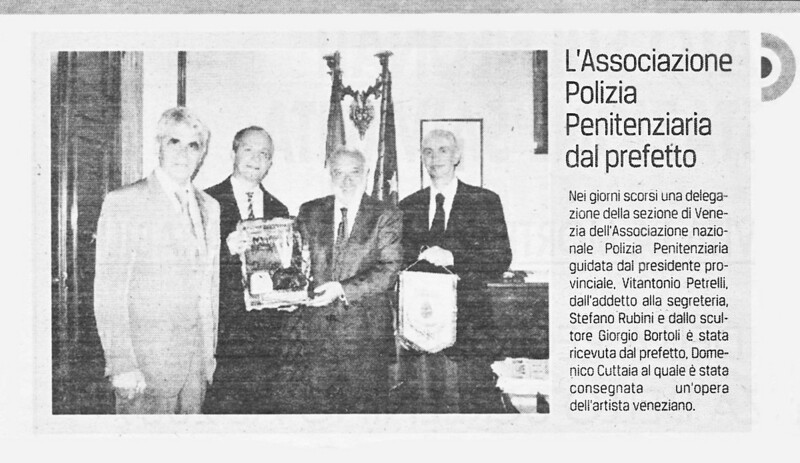 The prefect Cuttaia thanked the association for organized events and "especially for conferences to learn the law for young people in various schools in the city and the Venetian hinterland," urging I'associazione Prison Police to continue in action of civic information, giving his full readiness to participate in new initiatives. 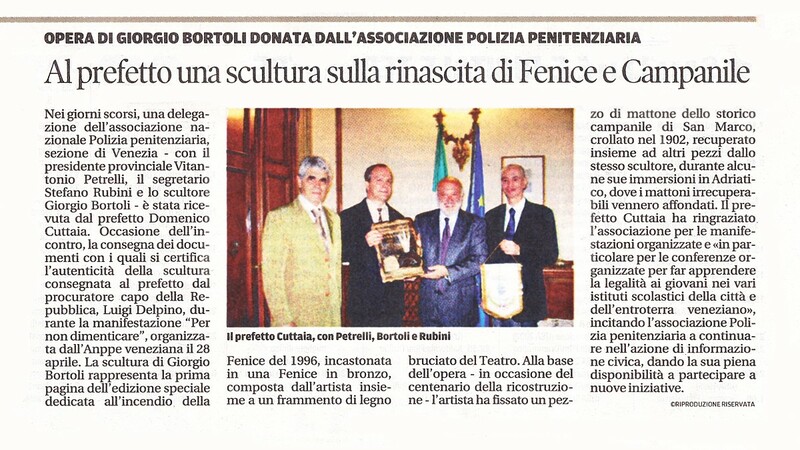 In recent days, a delegation of the Venice section of the National Penitentiary Police led by provincial president, Vitantonio Petrelli away by the secretary, Stephen Rubin and sculptor Giorgio Bortoli was received by the prefect, Domenico Cuttaia which was given a 'work of the Venetian. 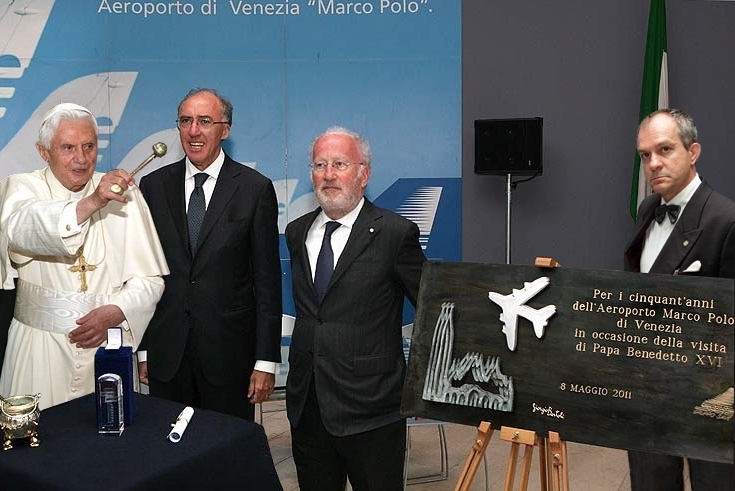 The plaque explaining the work of art "Compassion"
The Pope, during his recent visit to Venice, he inaugurated, blessing, a sculpture of George Bortoli created for the 50th anniversary of the Marco Polo. stopped a few minutes in the reception hall of the Venetian port. 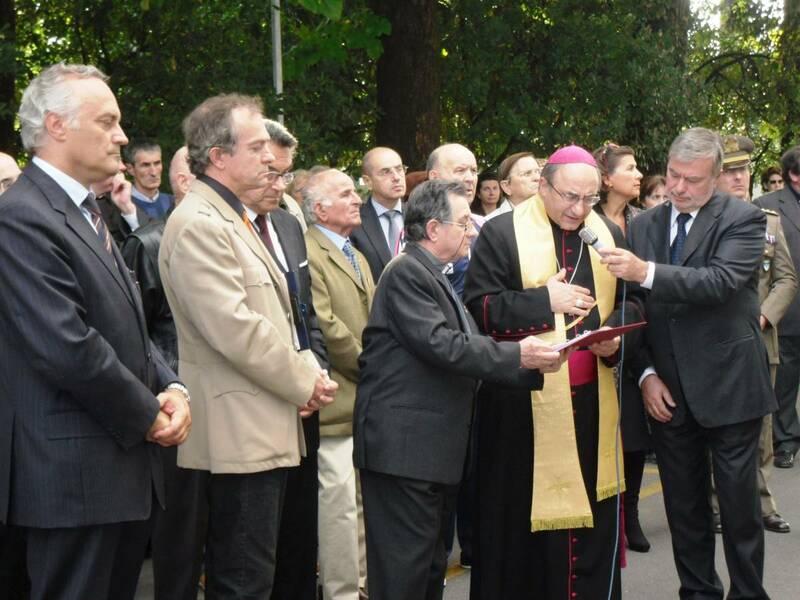 In the presence of civil and religious authorities (including the Patriarch Scola, the Minister Sacconi, the governor Zaia, the prefect, the mayor, the president of the Province and the chairman of the airport, Enrico Marchi) has blessed relief. 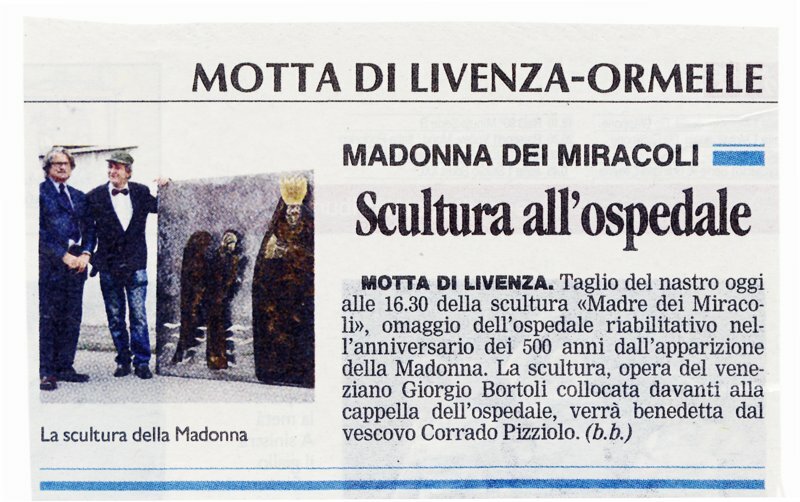 "A George, our old friendship with many compliments for the great talent "
New Teacher Bortoli sculpture titled Mother of Miracles, Installed at the Church of the Hospital of Motta di Livenza. 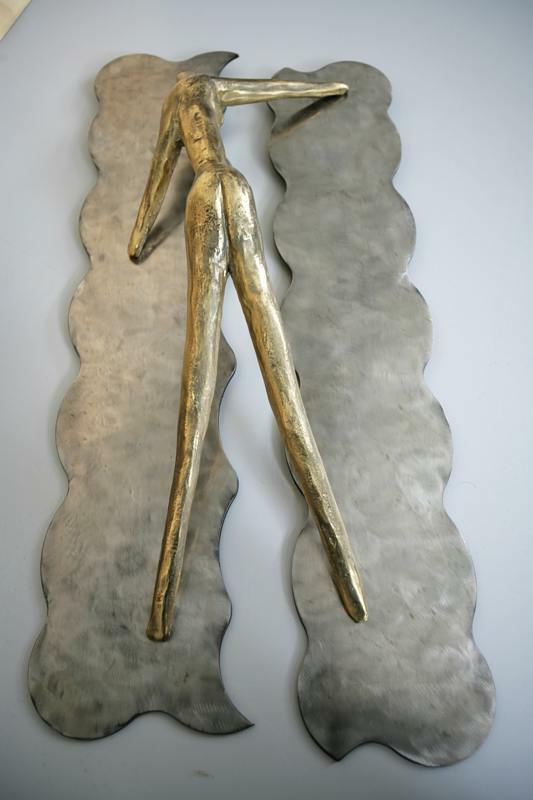 High relief sculpture in bronze, steel and Murano glass, permanent installation. 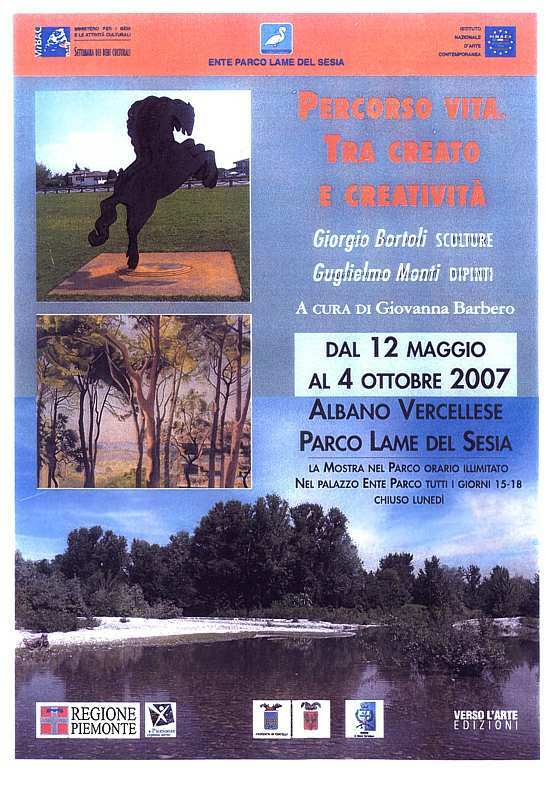 Poster (back) with photos of the works to the exhibition Art and Culture. 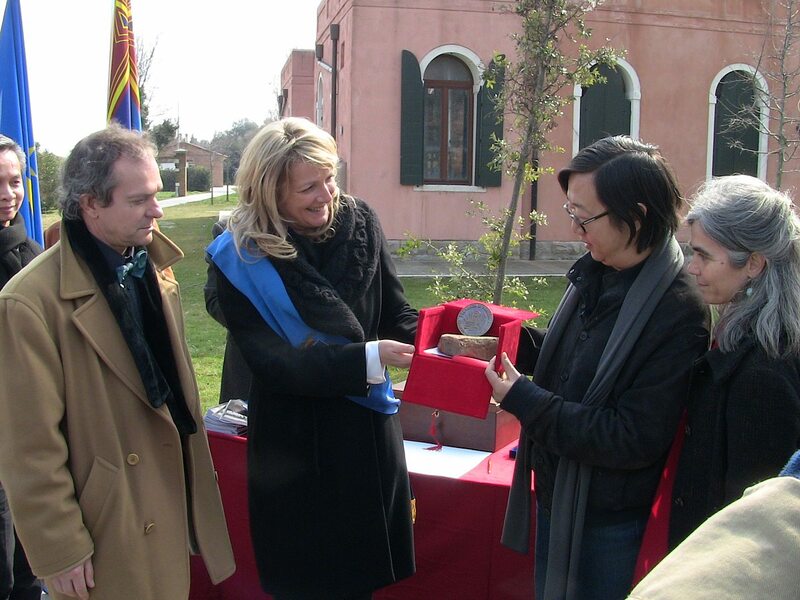 Delivery of the Medal "A Chinese Garden in San Servolo" of the Province of Venice (Venice International University). 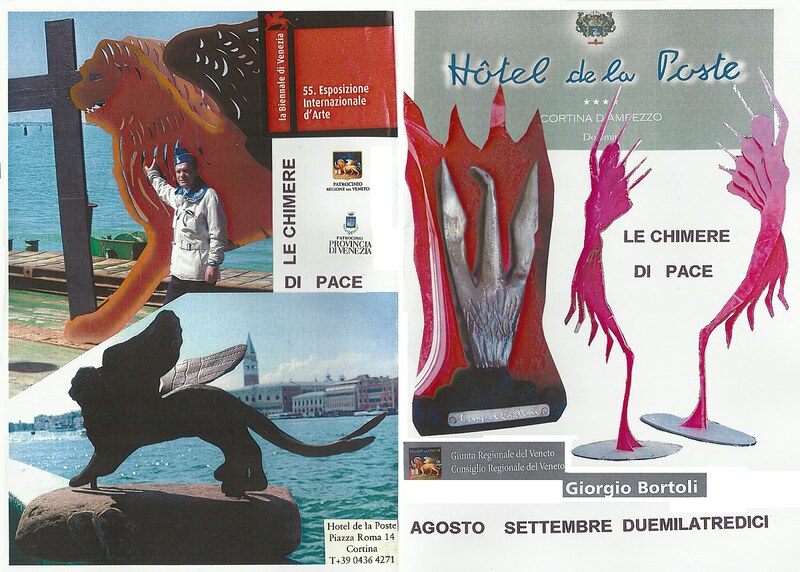 Arrigo Ciprani of the restaurant "La Perla Rossa (You Red Pearl)" winning with a sculpture realized by the Teacher Giorgio Bortoli, realized by a head of lion with bell tower of St. Mark in bronze, the all above a brick of the old bell tower collapsed of St. Mark. 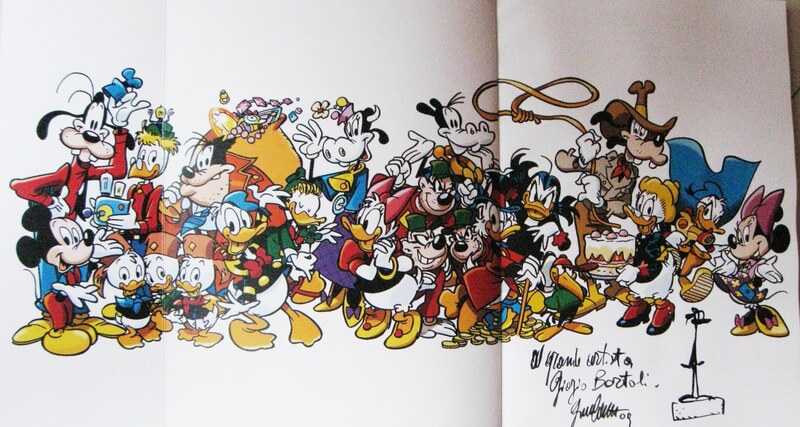 Giorgio Cavazzano, designer of Walt Disney, one of Mickey's dad. 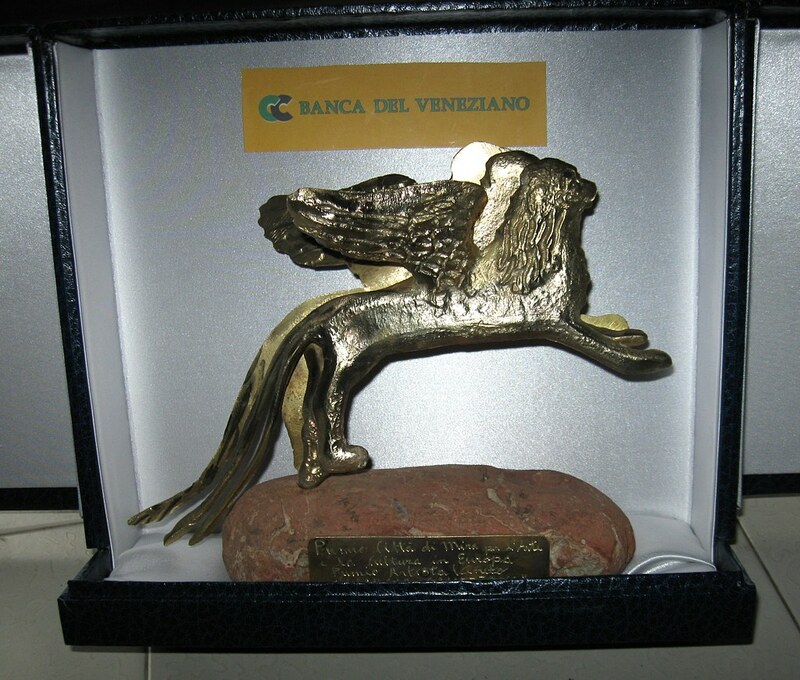 was awarded in November 2009, with the sculpture "stone lion on the Campanile," by Maestro Giorgio Bortoli. VENICE - In the wonderful frame of mannerism in Venice that is admired in the ceiling decorated with grotesques on a gold Marciana National Library, was set up a group of contemporary art, "Mater harmonies of art," with four artists: two painters, Joseph Kaliher and Pia Parodi, and two sculptors Giorgio Bortoli and Paola Crema. 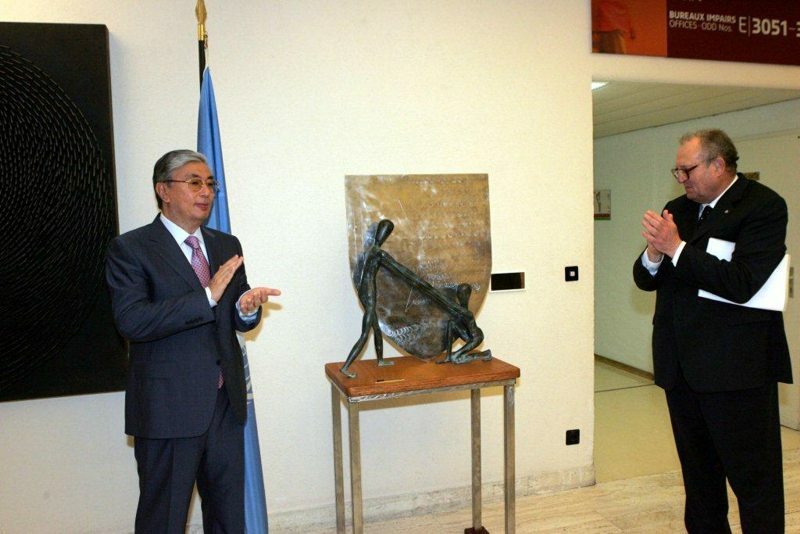 "Venice is becoming a major international centers for contemporary art," he declared with satisfaction, opening the city councilor, Luana Zanella, expressing his appreciation to the Director of the Marciana, Maria Letizia Sebastiani, which introduced , for the beautiful and elegant exhibition, and the major initiatives of the Library is always open to the territory. 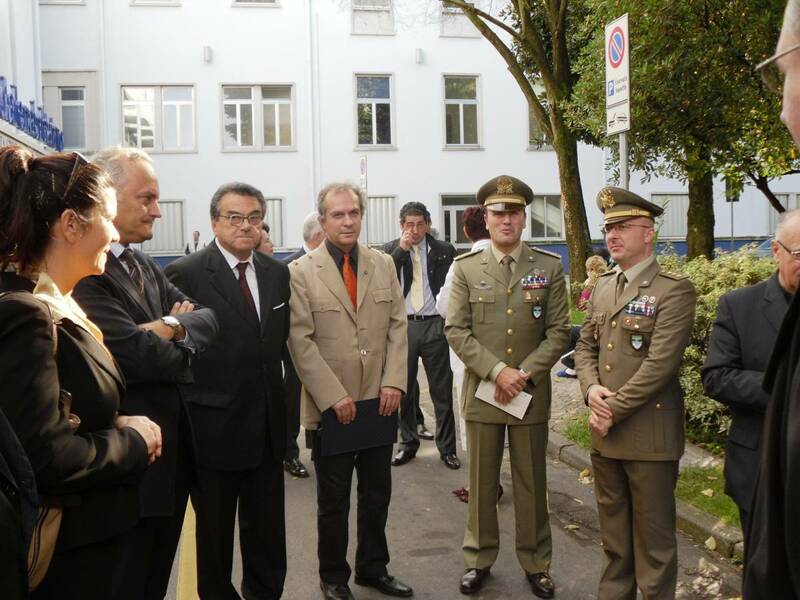 Stressed, inter alia, the active and valuable cooperation established with the local administration. The exhibition was organized by the Cultural Association AMI.BE.C (Friends of Cultural Heritage), an association of employees of the Ministry of Heritage and cultural activities open to all who manifest interest in art and culture. 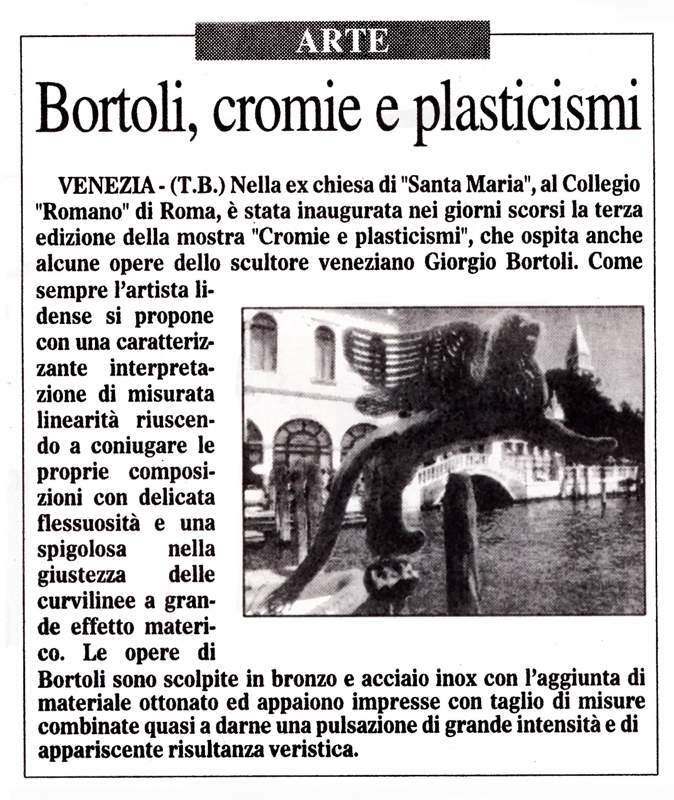 Bortoli, famous Venetian artist, spoke passionately of the "hard work of the sculptor wielding marble, bronze, glass, steel, putting the heart." 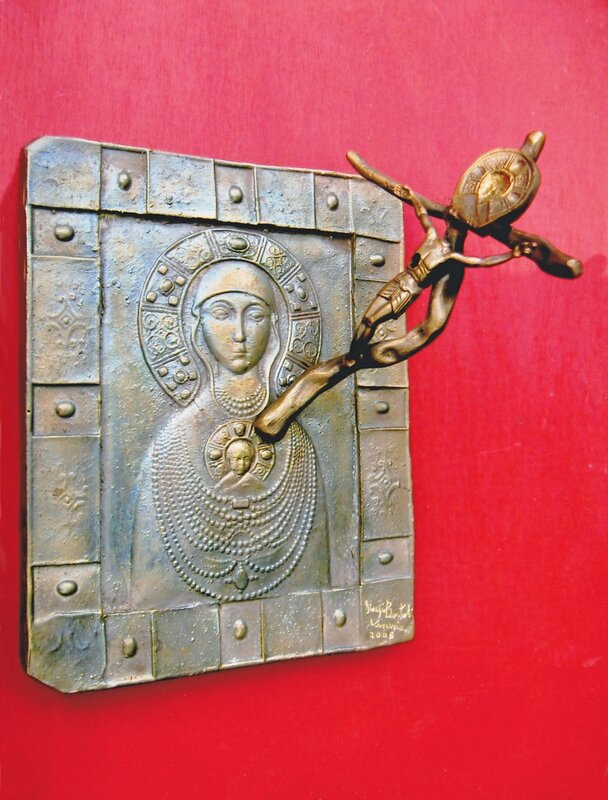 Cream, eclectic artist, uses various materials, ornaments, from silver to pearl, rock crystal from the bronze. For Kaliher, his paintings, including surrealism and conceptual, are without a title because "I appeal to the hearts and psyches of people and everyone can see in my work according to their own feelings. The colors are bright, vivid, and as he says the Gospel, we must turn children, with the innocent eyes to see and understand. " 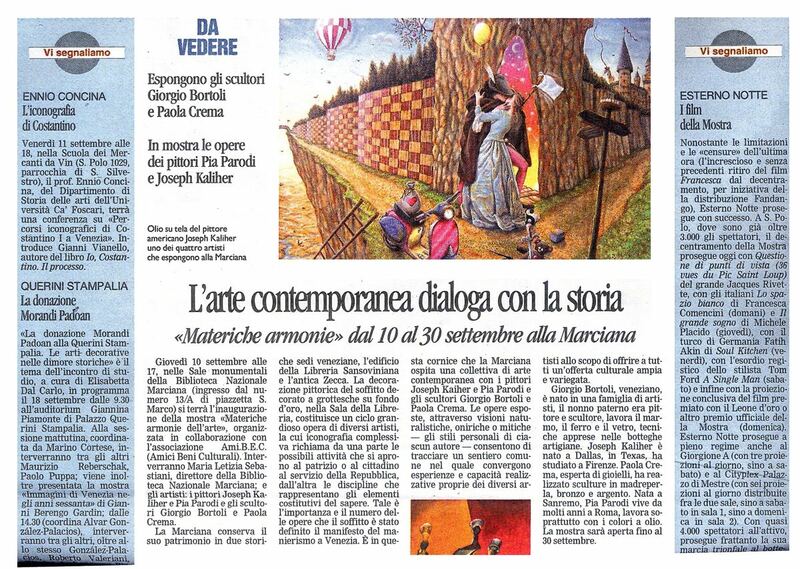 Parodi instead of his paintings, said: "I paint my emotions" which resulted in the wonderful light that floods panoramas and landscapes. 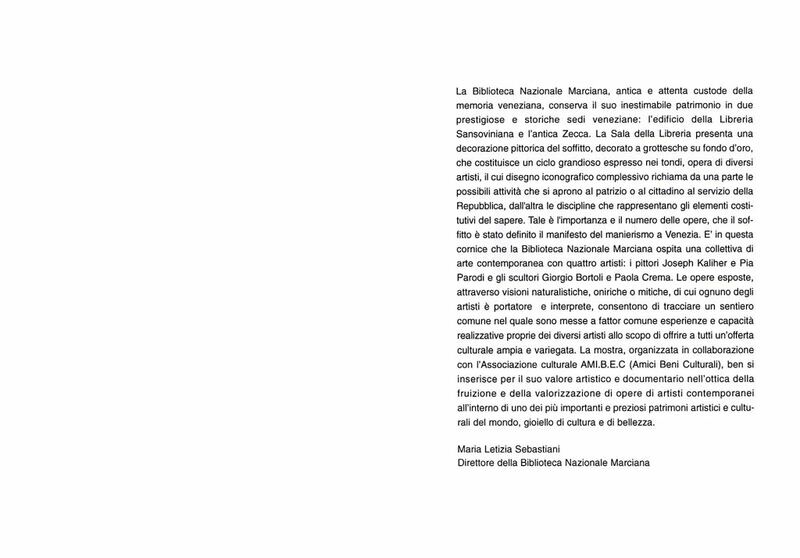 The Biblioteca Nazionale Marciana, the ancient Venetian and careful guardian of the memory retains its priceless heritage and historical sites in two prestigious Venetian 1'edificio of LibreriaSansoviniana and Old Mint. The Hall of the Library presents a pictorial decoration of the ceiling, decorated with grotesques on a gold ground, which is a grand cycle expressed in rounds, the work of several artists whose design draws from a comprehensive iconographic part of the possible activities that open to the patrician or the Citizens for the Republic, on the other disciplines that represent the constituent clement dcl know. Such is the importance and the number of works that the ceiling has been called the manifesto of mannerism in Venice. 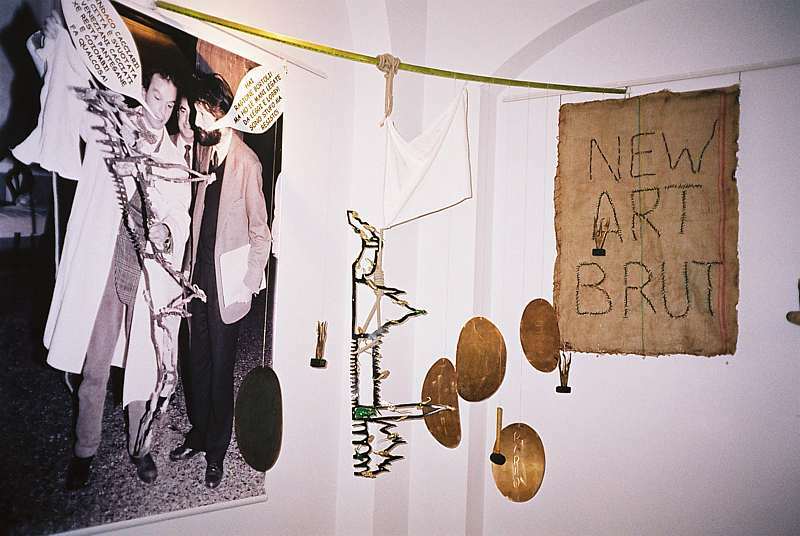 E 'in this framework that the Bibliotcca National Marcianaa houses a contemporary art collective of four artists: painters Joscph Kaliher and Pia Parodi and sculptors George Bortoli and Paola Crema. 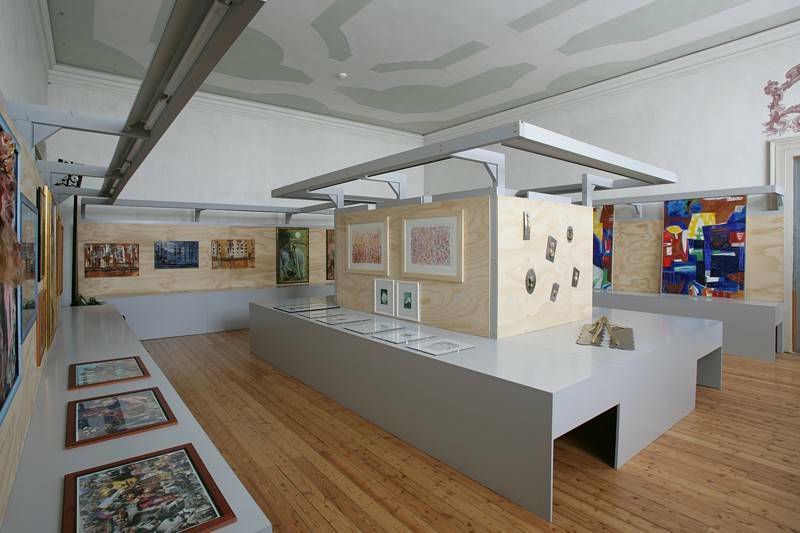 The works on display through naturalistic vision, dreamlike or mythic, each of which is the bearer of artists and interpreter, allows for a common path in which they are made to factors common experiences and construction capabilities of the various artists in order to give everyone a ' wide and varied cultural offerings. 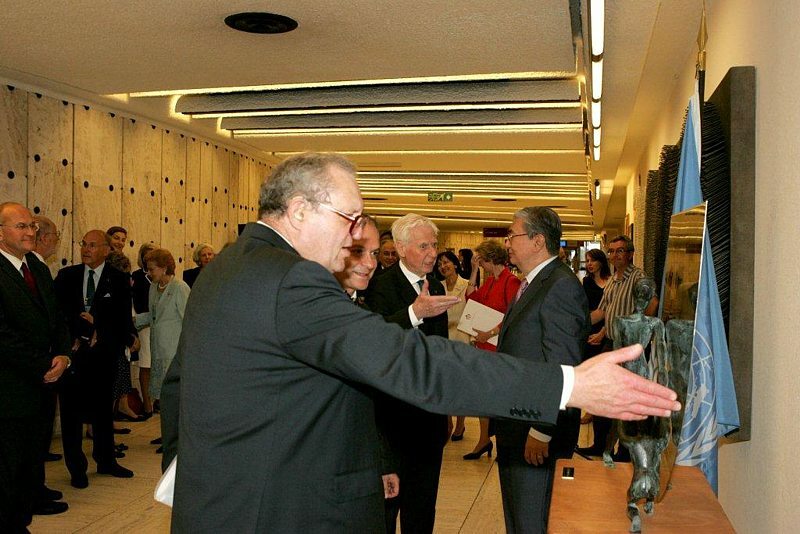 The exhibition, organized in collaboration with the Cultural Association AMI.BE.C (Friends of Cultural Heritage), good fits to its artistic value c documentary perspective of enjoyment and appreciation of works by contemporary artists within a the most important and valuable artistic and cultural heritage of the world, culture is a jewel of beauty. 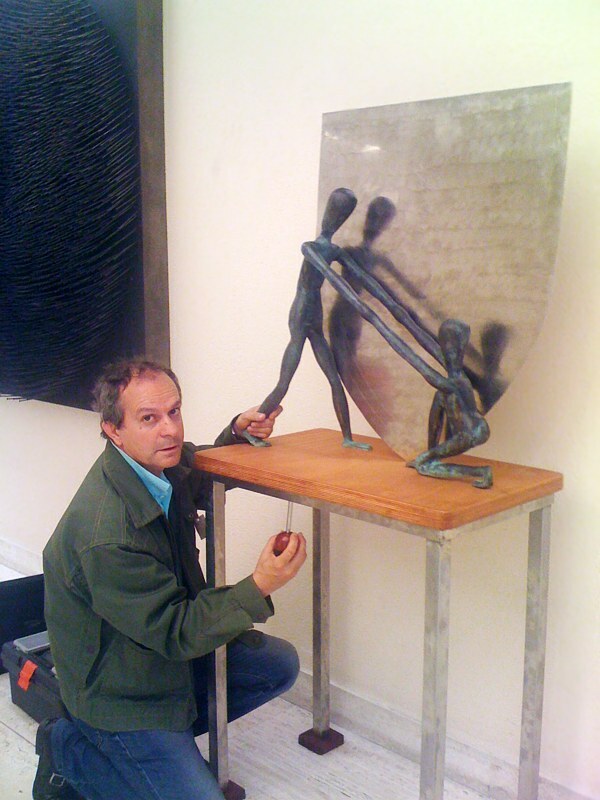 Venetian sculptor. 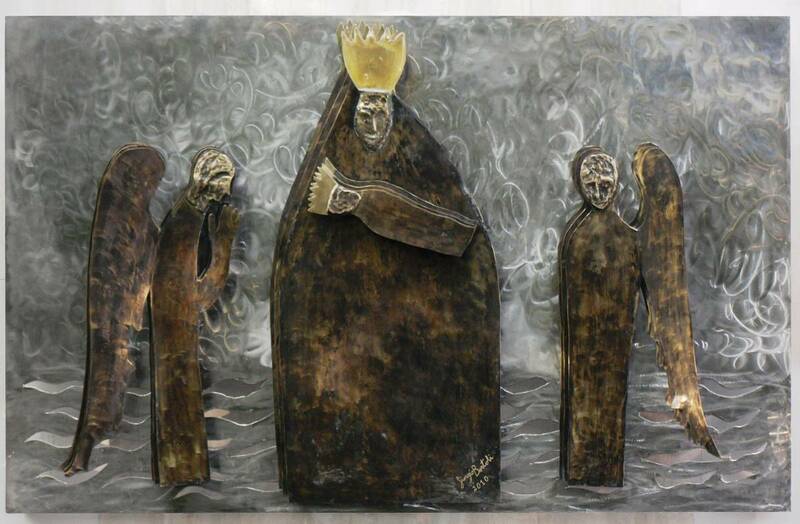 His vocation artistaca originates in the family, the paternal grandfather was in fact a painter and sculptor. 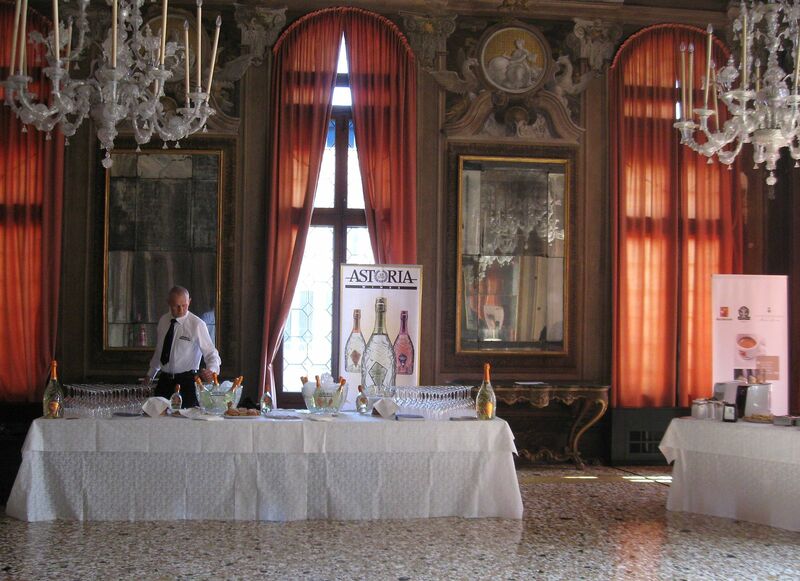 His training took place in workshops, learning how to work the marble by marble workers, carpenters and iron from the blacksmiths, glass in Murano, in foundries. The sculpture is his world. And 'think ideally what one feels inside, a great energy that one tries to transform. 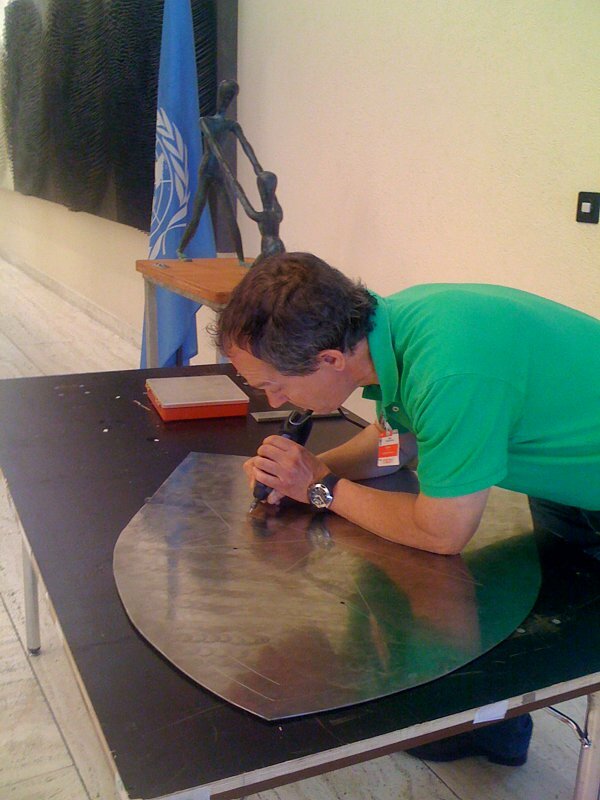 The sculptor is a transducer that takes this energy and transforms it mechanically. 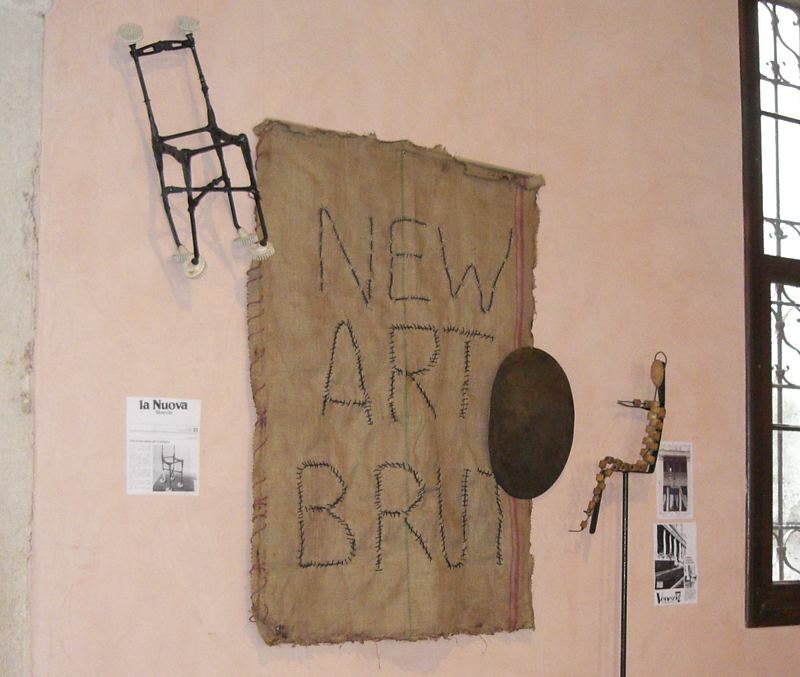 His works are exhibited in many museums in Italy and abroad. E 'born in Dallas, Texas, United States of' America. 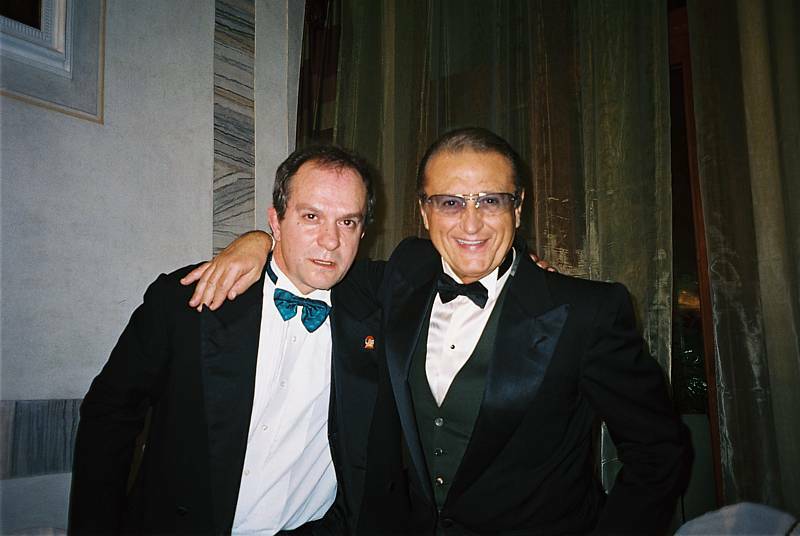 Raised in Italy and England, was the school of Maestro Maurizio Martelli Accademia delle Belle Arti in Florence. She then graduated from the renowned Institute Superieur de Peinture Van Der Kelen et Longelain in Brussels, where he specialized in painting trompe l'oeil, under the tutelage of Master Clement Van Der Kelen. 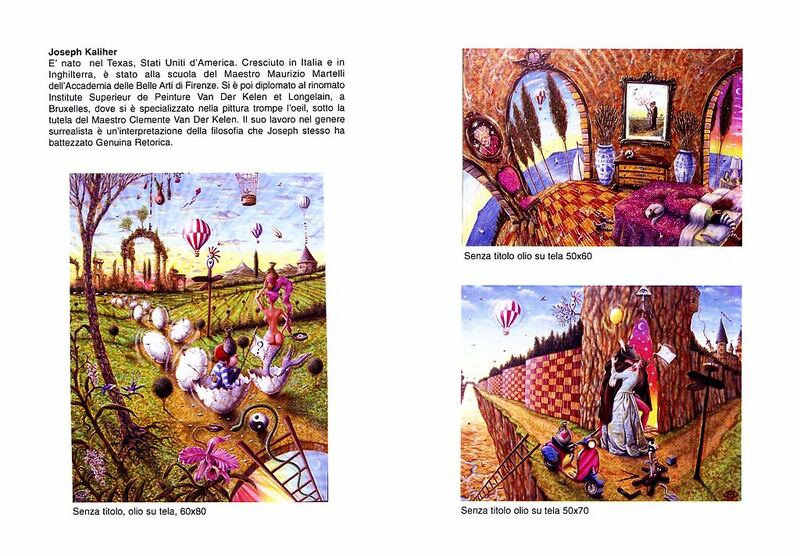 His work in the surrealist genre is an interpretation of the philosophy that Joseph himself has baptized Genuina Rhetoric. 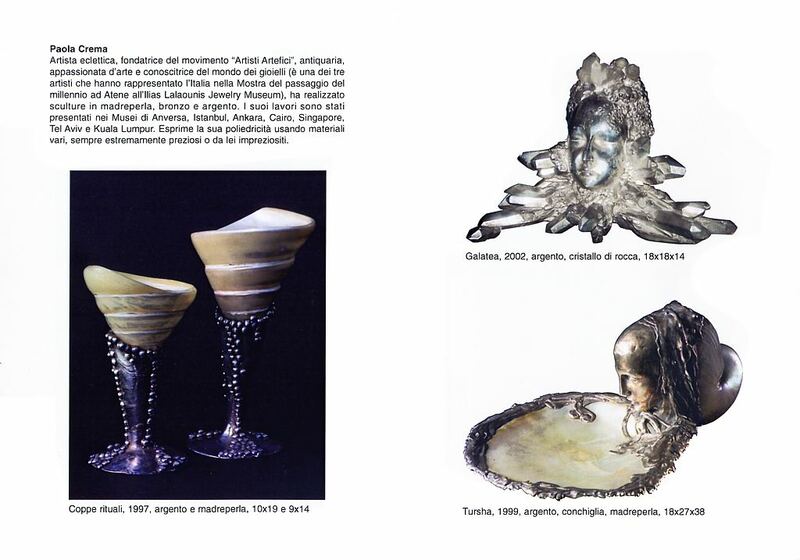 Eclectic artist, founder of the movement "Artists Framers, antiques, art lover and connoisseur of the world of jewelry (it's one of three artists who represented Italy in the exhibition of the passage of the millennium all'Ilias Lalaounis Jewelry Museum in Athens) , has created sculptures in mother of pearl, bronze and silver. 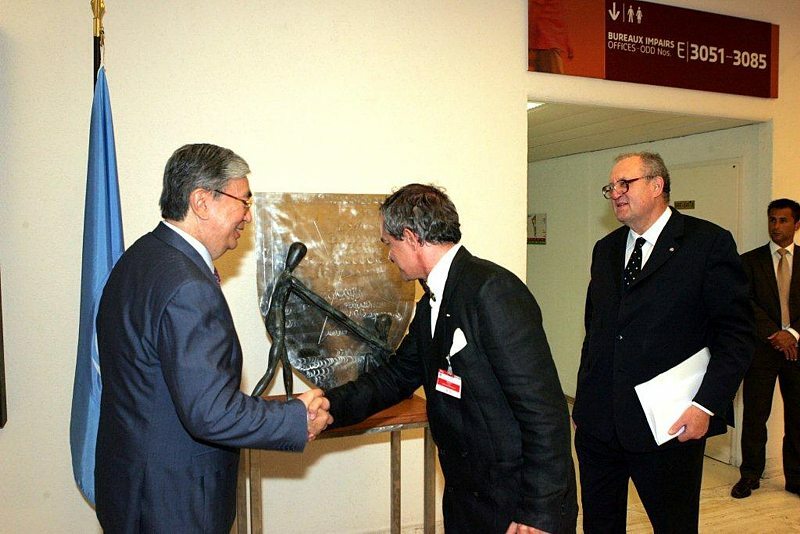 His works have been presented at museums in Antwerp, Istanbul, Ankara, Cairo, Singapore, Tel Aviv and Kuala Lumpur. 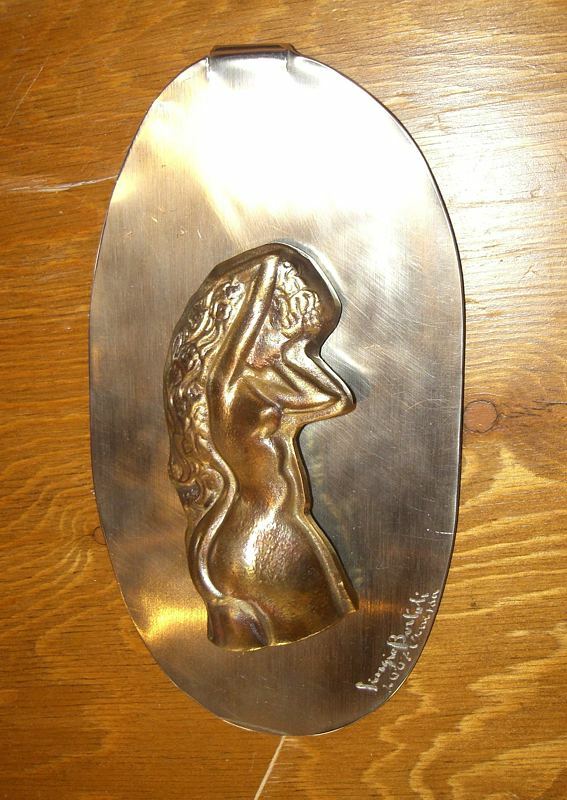 Expresses its versatility by using various materials, always extremely valuable or she embellished. 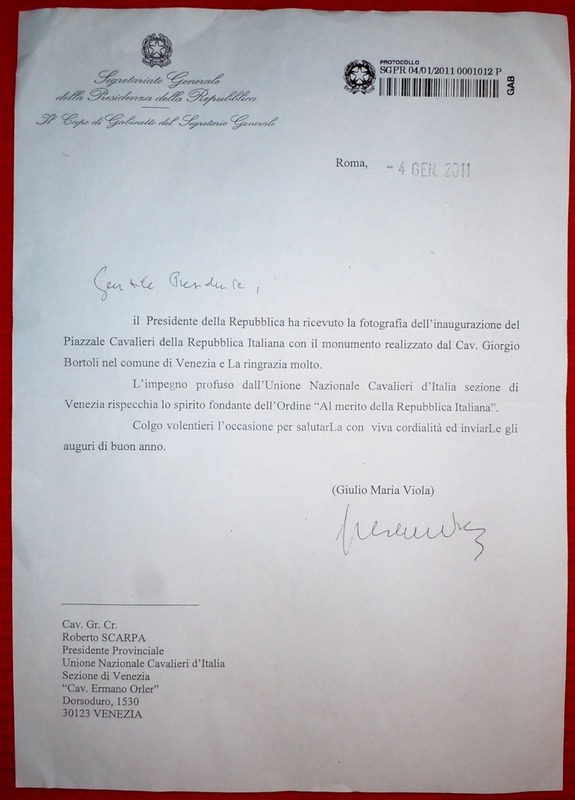 Letter of the General Secretariat of the Presidency of the Republic. 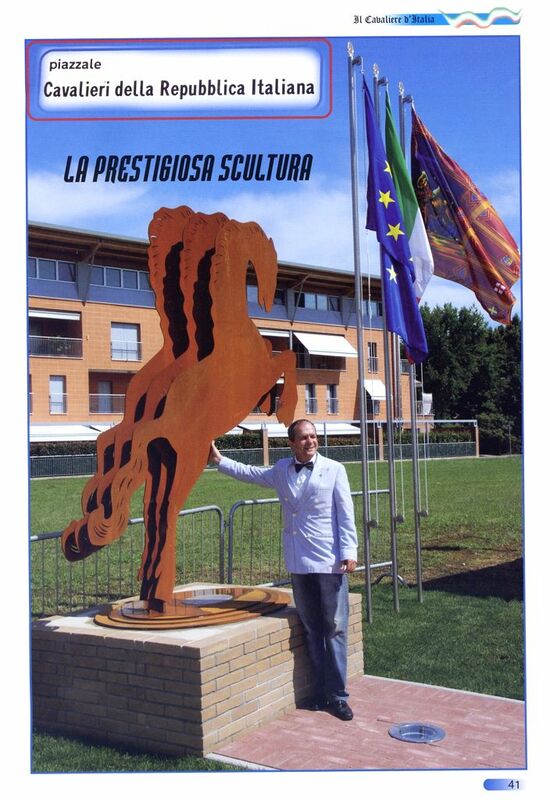 Dear President, the President of the Republic has received a photograph of the inauguration of the Square Knights of the Italian Republic, the monument made by Cav. 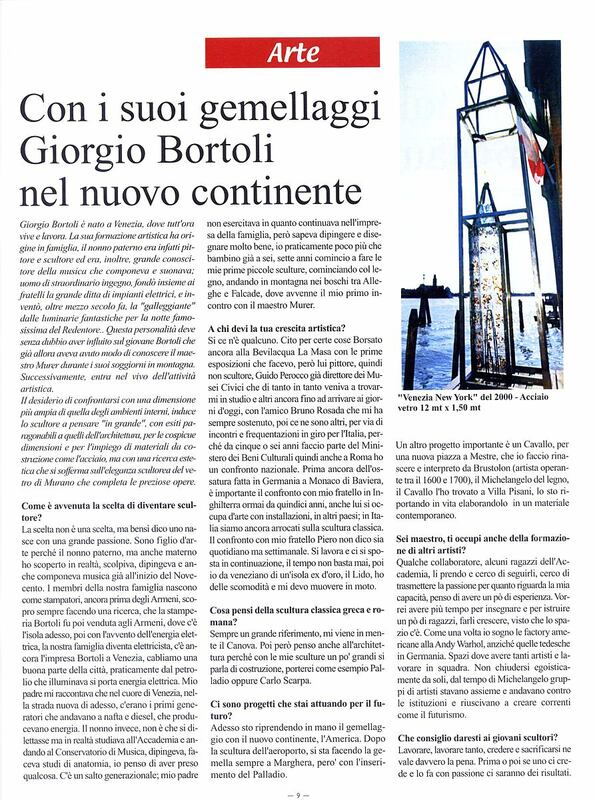 Giorgio Bortoli in the City of Venice and thanks you very much. 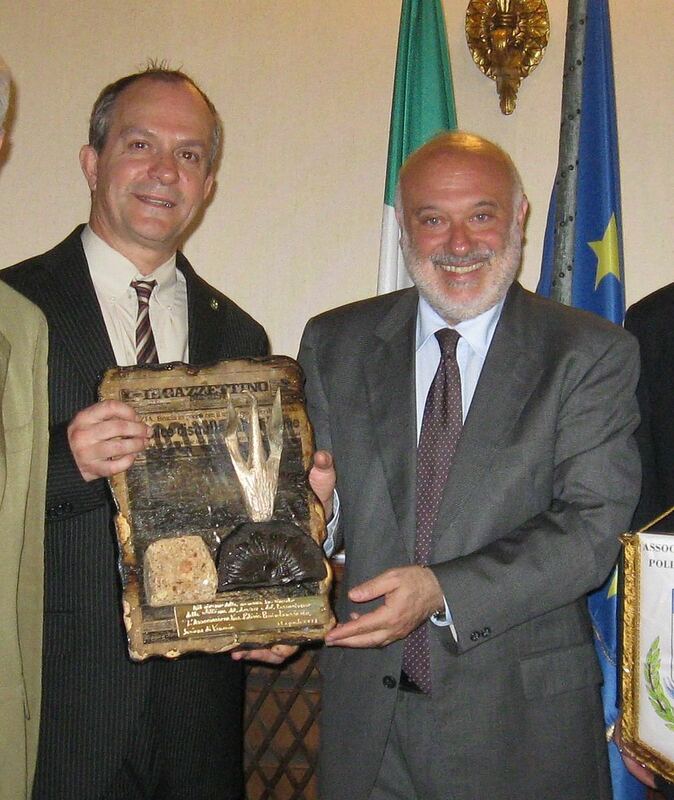 The commitment by the National Knights of Venice Italy section reflects the founding spirit of the Order of Merit of the Italian Republic. " I gladly take this opportunity to warmly Salit and send you good wishes for the New Year. 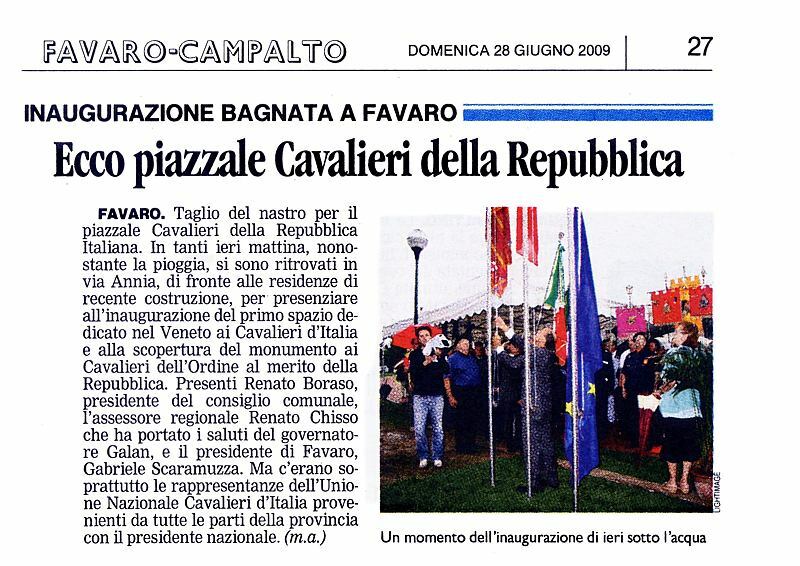 (M.D.L) he is developed you to Favaro the ceremony of inauguration of the Square Riders of the Italian Republic yesterday. 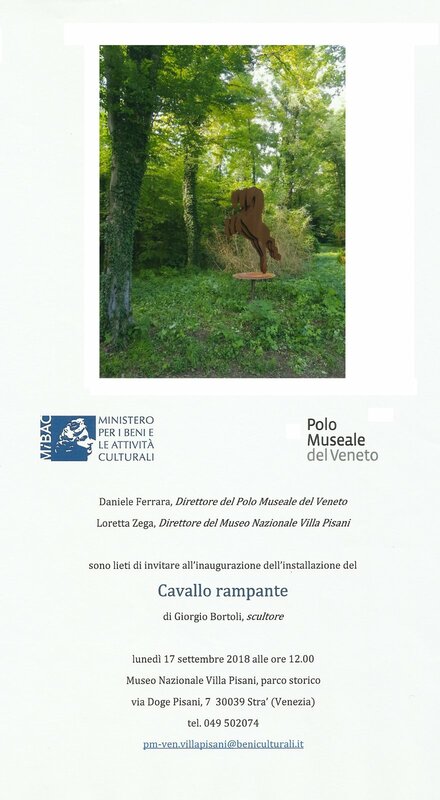 It deals with the first space in Italy devoted to the Riders of the Republic: it is situated in the area close to the gym Rodari in the street Charles Agnoletti and to the center of the new Square he has been situated a monument created by the artist Giorgio Bortoli in honor of the title. 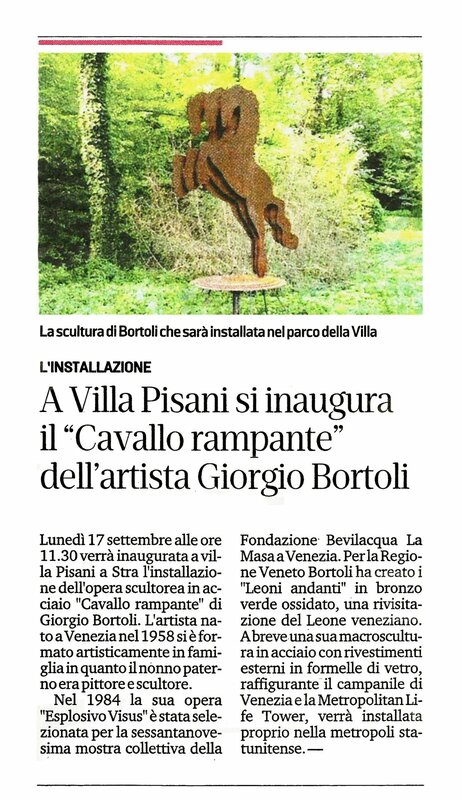 The work, tall 2,70 meters for a width of 1,35 meters, are realized in steel on base of cement and marble and it represent a rampant horse reproduced in three placed side by side outlines the one to the other that you are inspired to the eighteenth-century wooden foals that adorned the stables of Villa Pisani to Stra. The monument reproduces an impression of dynamism and speed that it is accompanied to the nobility of laying of the animal. 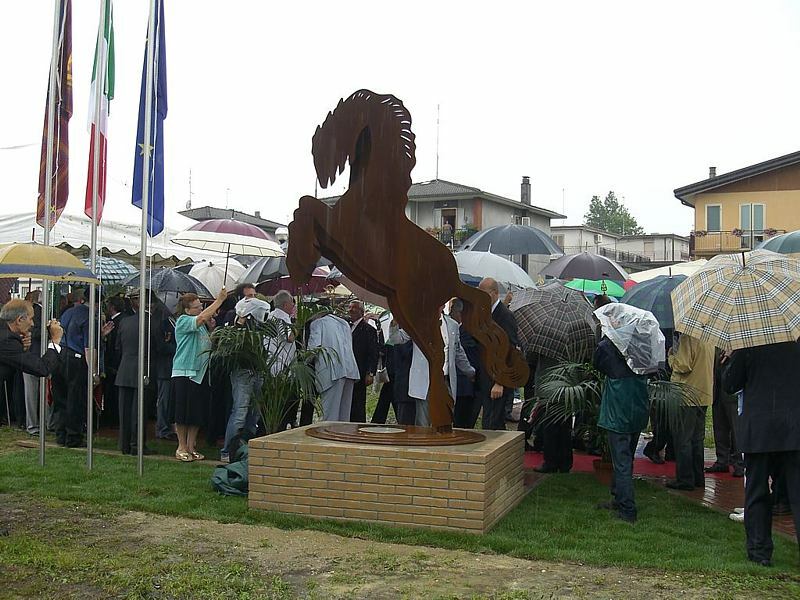 To the ceremony, unwound herself under the rain, they were present Ennio Radici, president national Riders of Italy, the provincial president of the Unci Roberto Scarpa, the district delegate of the same association Oar Of the Augellis, the president of the Municipality of Favaro Gabriele Scaramuzza, the regional alderman to the mobility Renato Chisso and the President of the Council comúnale Renato Boraso. 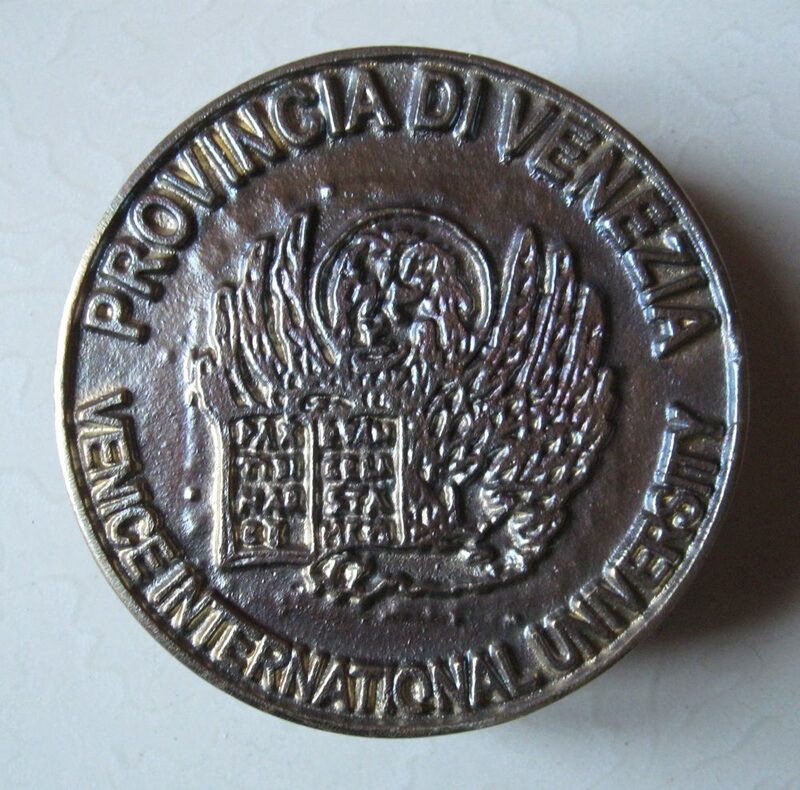 There were, besides, quite a lot associations of weapon, a representation of the association fighting and legionaries, of the Lagoon ones and of the Policemen and the delegates of the Unci of different sections of Italy among which Bergamo and Verona. 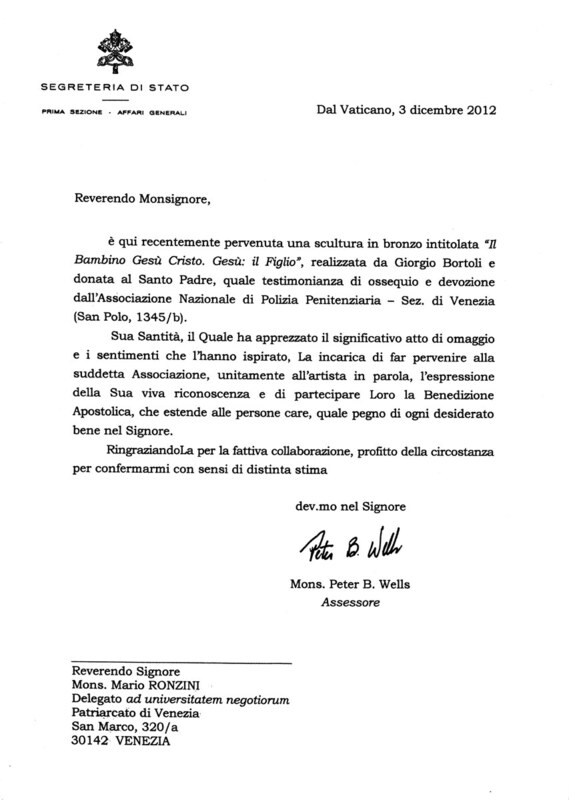 After the alzabandiera and the benediction imparted by the priest of it Enrolls Mr. Lionello, you have taken the word the authorities intervened that you have praised the social function that the union of the Riders of Italy develops towards the neediest classes. FAVARO. 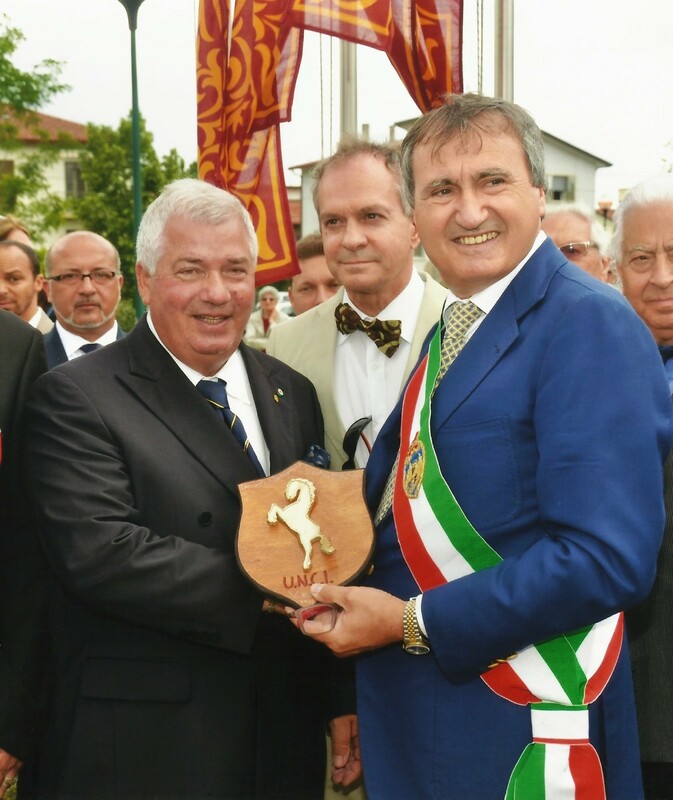 Cut of the ribbon for the square Riders of the Italian Republic. In so many yesterday morning, despite the rain, they are found again at the street Annia, in front of the residences of recent construction, to witness to the inauguration of the first space devoted in Veneto to the Riders of Italy and the scopertura of the monument to the Riders of the order to the worth of the Republic. 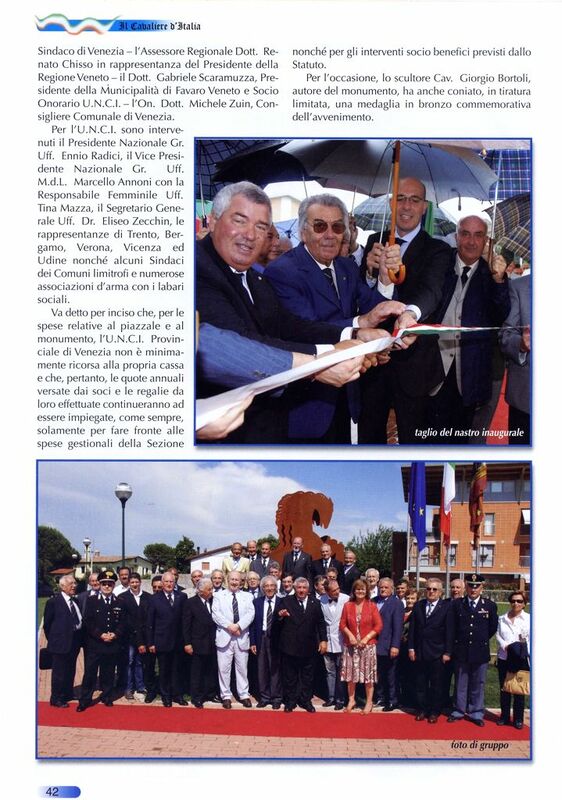 MESTRE - On initiative of the Venetian section of the Unci (Union National Riders of Italy) it is inaugurated today officially Saturday at 10 o'clock, to Favaro Veneto, the square devoted to the Riders of the Italian Republic. 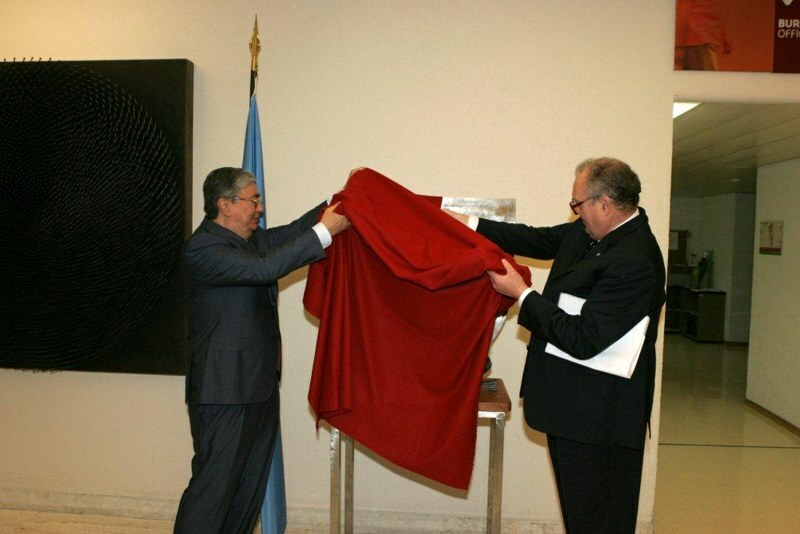 During the solemn ceremony - to which regional, provincial and town authority is been invited - the monument will be discovered to also honors him some order Á. the Worth of the Italian Republic. 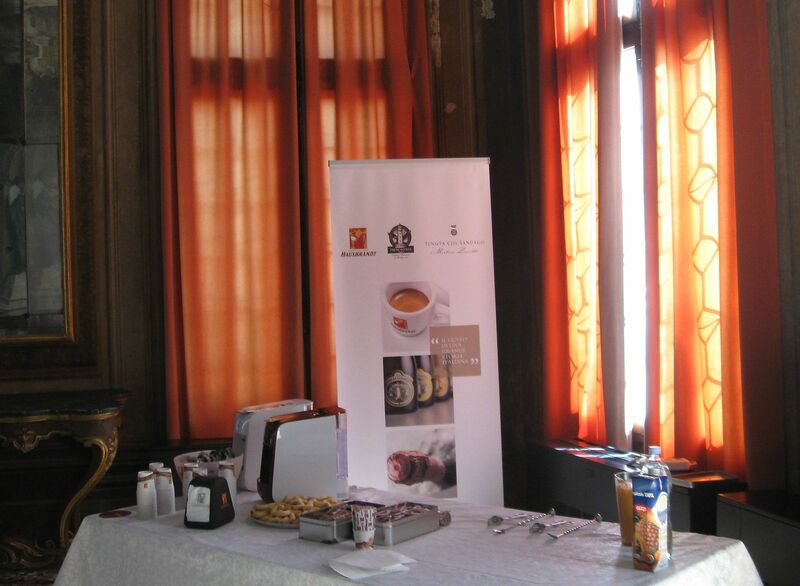 An event of a certain relief from the moment how such toponimo is the first one of its kind in Italy. (M.D.L.) 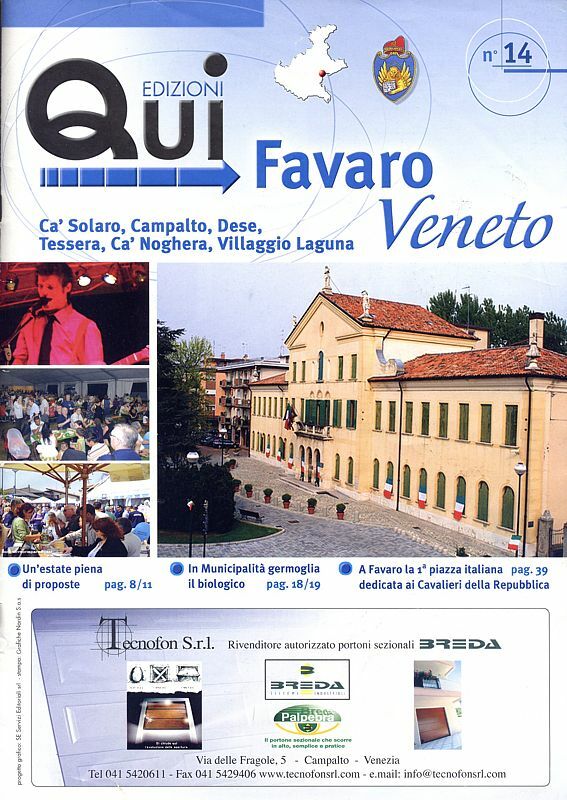 You will take place this morning at the 10, to Favaro Veneto, the ceremony of inauguration of the Square Riders of the Italian Republic. It deals with the first space devoted to the Riders of Italy in the Region Veneto and it is situated in the area close to the gym Rodari in the street Agnoletti to Favaro. For the occasion it will be open to the presence of the authorities the monument to the Riders of the order to the worth of the Italian Republic realized in honor of the title, and situated to the center of the square. 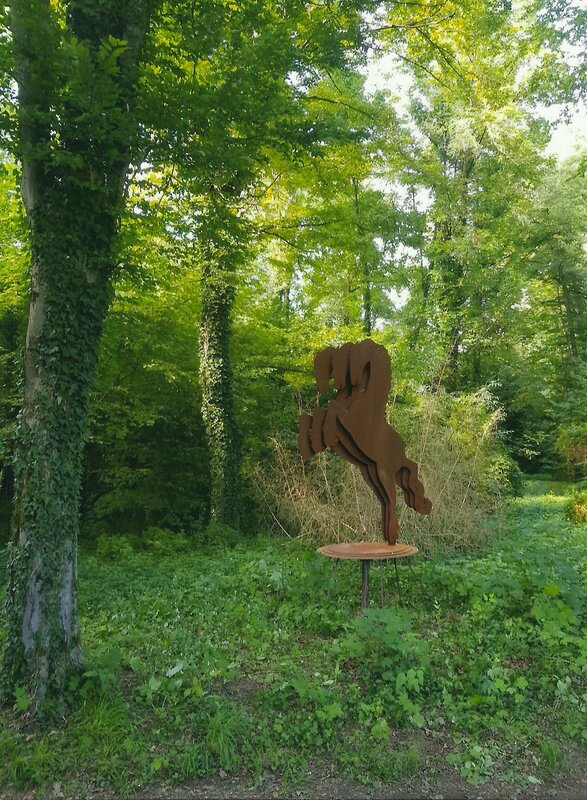 Work of the artist Giorgio Bortoli, the monument represents a horse "rampant" reproduced in three placed side by side outlines the one to the other and he is inspired to the eighteenth-century wooden foals that adorned the stables of Villa Pisani to Stra. The monument reproduces an impression of dynamism and speed, that it is accompanied to the nobility of laying of the animal. 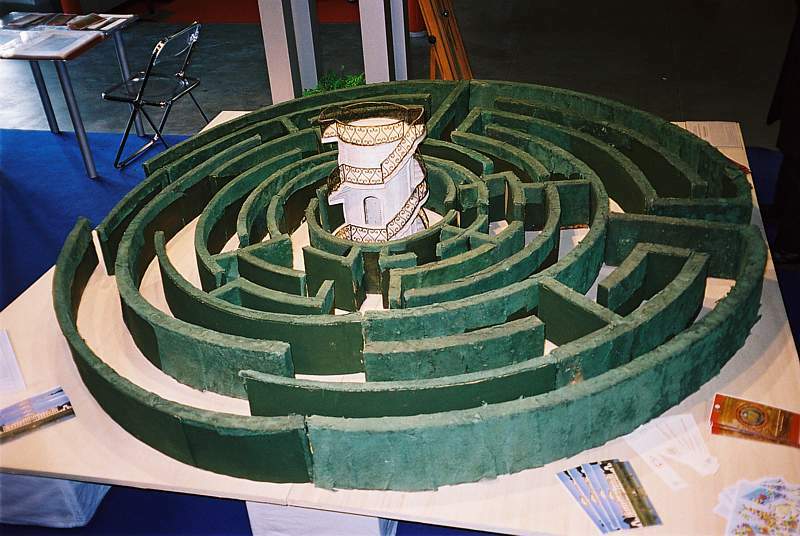 The work, tall 2,70 meters for a width of 1,35 meters he is realized in steel "courtain" on base of cement and marble. 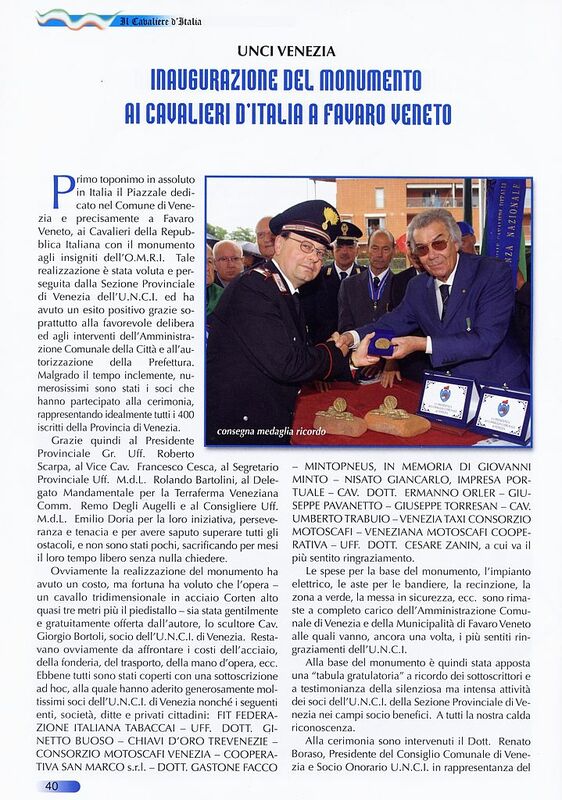 To the ceremony they will be present the president of the Municipality of Favaro Veneto Gabriele Scaramuzza, the Town President of the Council of Venice Renato Boraso, the alderman to the Public Jobs of the Region Veneto Renato Chisso. 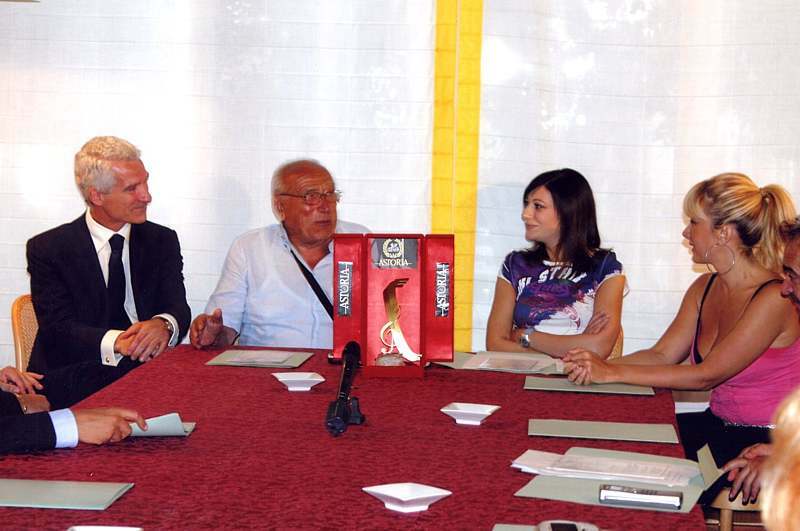 They will participate besides the representations of the union National Riders of Italy and the national President of the same Union. 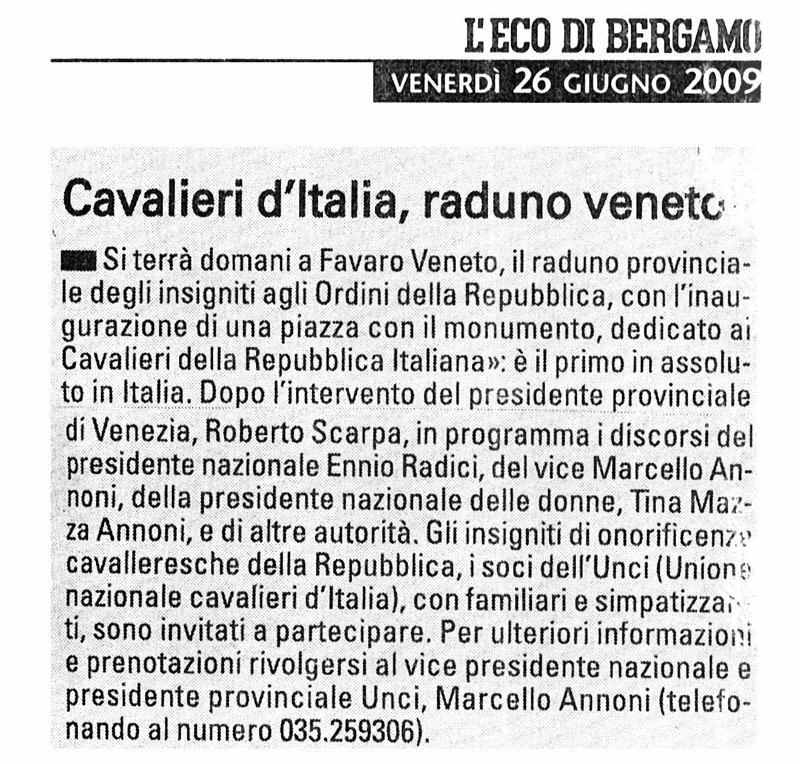 Friday June 26 th 2009 Riders of Italy, Venetian assembly. 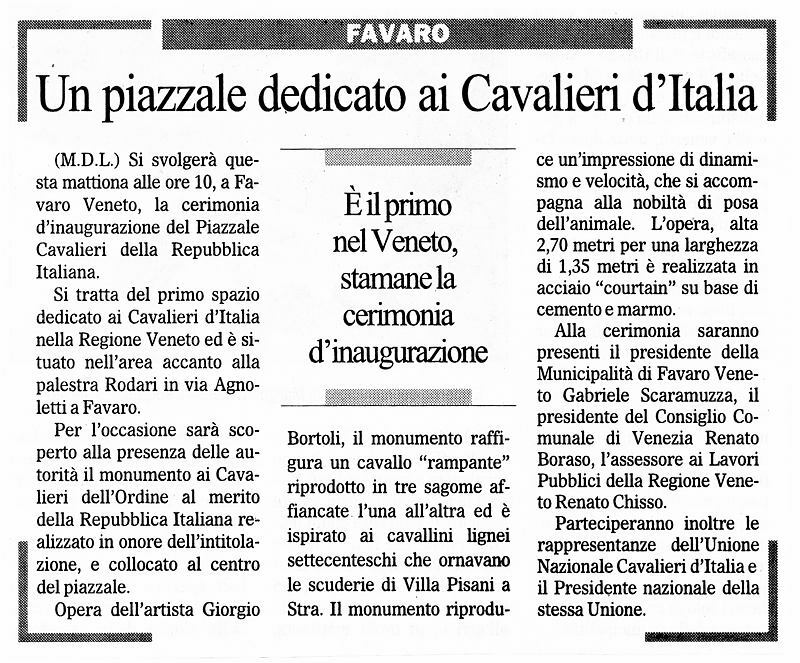 You will hold to Favaro Veneto tomorrow, the provincial assembly of the honored to the orders of the Republic, with the inauguration of a plaza with the monument, devoted to the Riders of the Italian Republic: it is the first one in absolute in Italy. 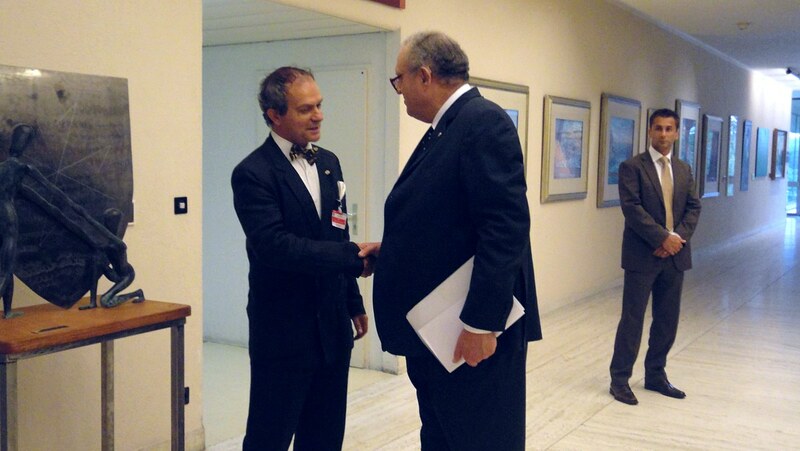 After the intervention of the provincial president of Venice, Roberto Scarpa, scheduled the discourses of the national president Ennio Radici, of the deputy Marcello Annoni, and of other authorities. 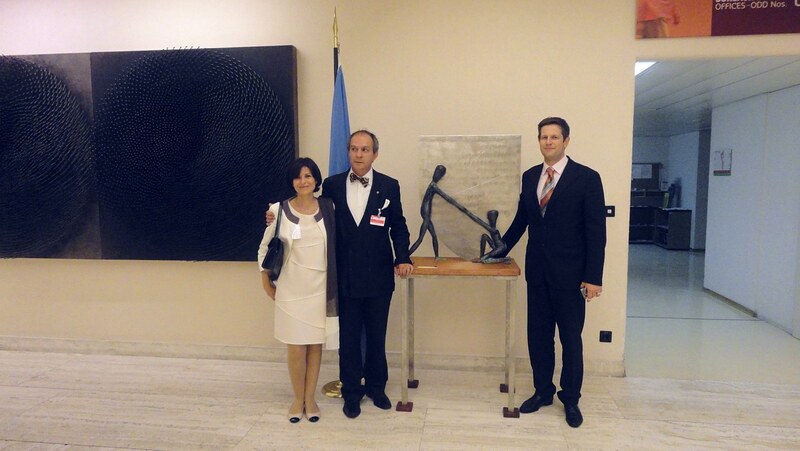 Honors him of honor chivalrous of the Republic, the partners of the UNCI (Union National Riders of Italy), with relatives and sympathizers, they are guests to participate. 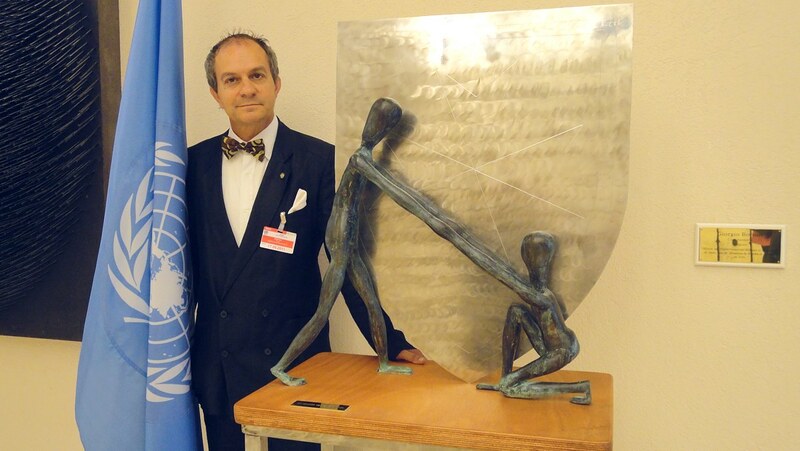 For further information and bookings to turn to the deputy national president and provincial president Unci, Marcello Annoni (phoning the number 035.259306). FAVARO. 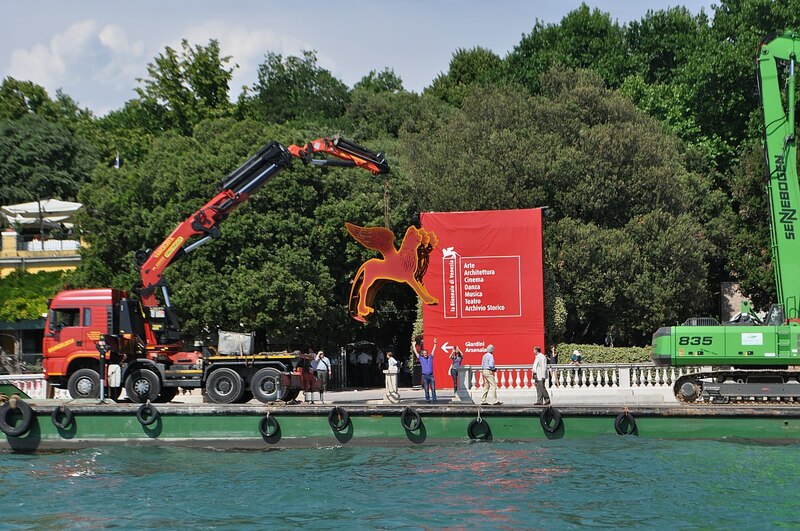 This morning beginning from the 9.30, the square will be inaugurated Riders of the Republic, situated in the area close to the gym Rodari in the street Annia. 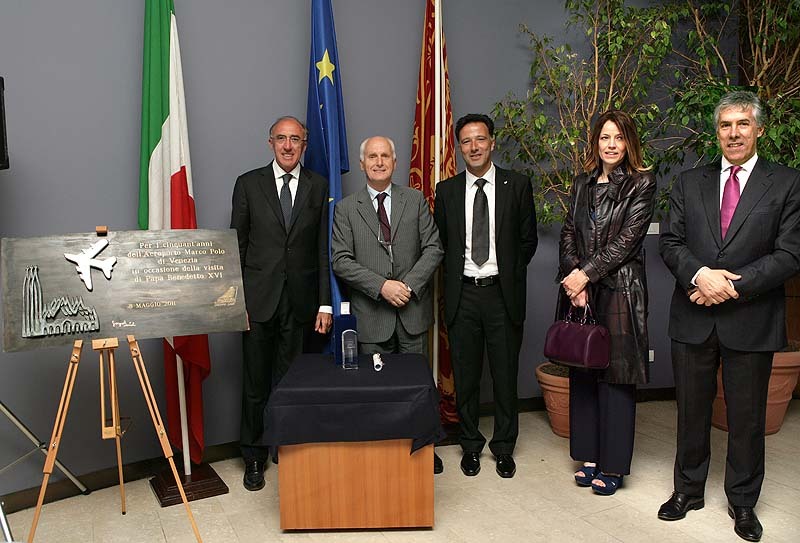 For the occasion it will be open the monument to the Riders of the order to the worth of the Italian Republic realized in honor of the title and situated to the center of the square. 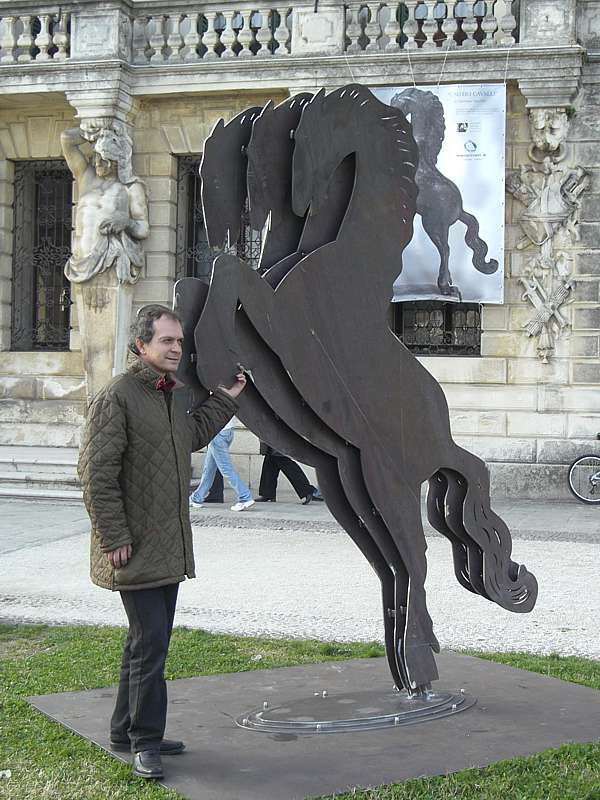 Work of the artist Giorgio Bortoli, the monument represents a horse «rampant» reproduced in three outlines to the broadsides the one to the other. 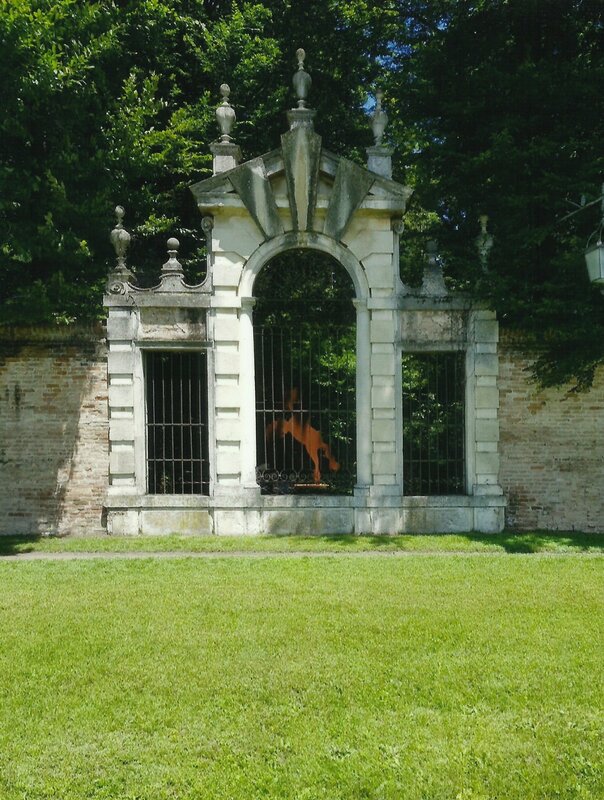 Inspired to the wooden foals of the '700 that they adorned the stables of Villa Pisani, the monument it reproduces an impression of dynamism, beauty and speed. 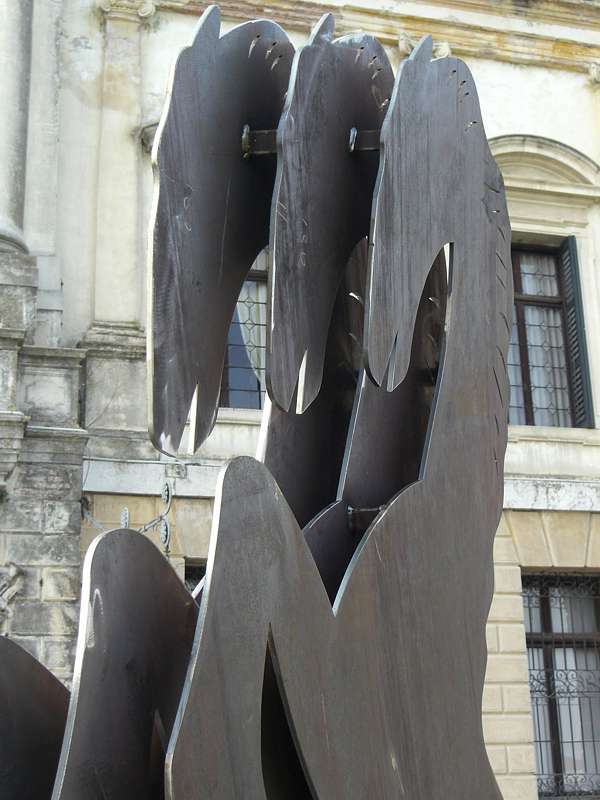 The work, tall 2,70 meters for a width of 1,35 meters he is realized in steel «courtain» on base of cement and marble. Venetian, Venetian, until too much Venetian. 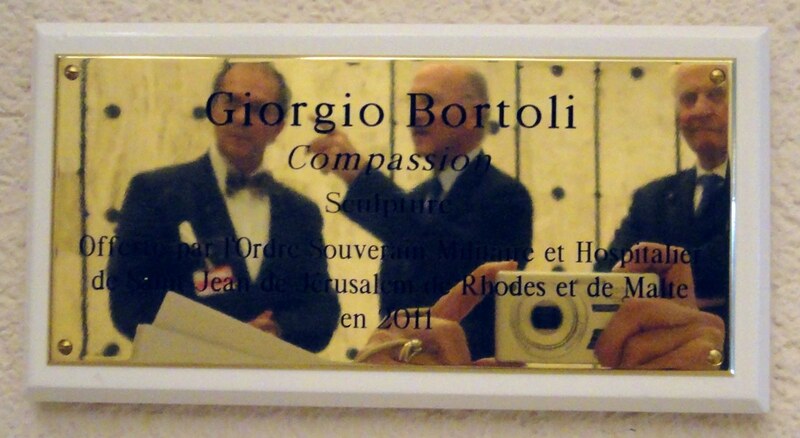 But this gives a further quality and a seal of origin to the job of form and subject of George Bortoli. 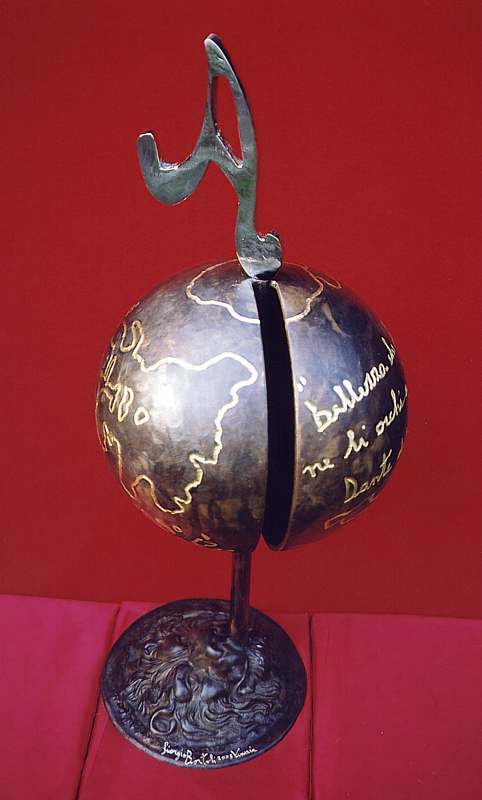 Idea to engrave a wish to the most varied material of the art, evokes its distant origin in a family of typographers, in a Venice where the press and the sketch of the characters he has become the form of the message of the written culture and glance. Close to this art by now ancient the fact that the family Bortoli has worked in the century of the electricity to create the light and the discreet shades in Venice, it puts George in the difficult art to connect and to solicit past and present, that are images so connected indistricabilmente in the stones and in the waters in Venice. His is a diffused art that deepens the technical fusories for the arcane symbols in Venice that become now and always contemporary. 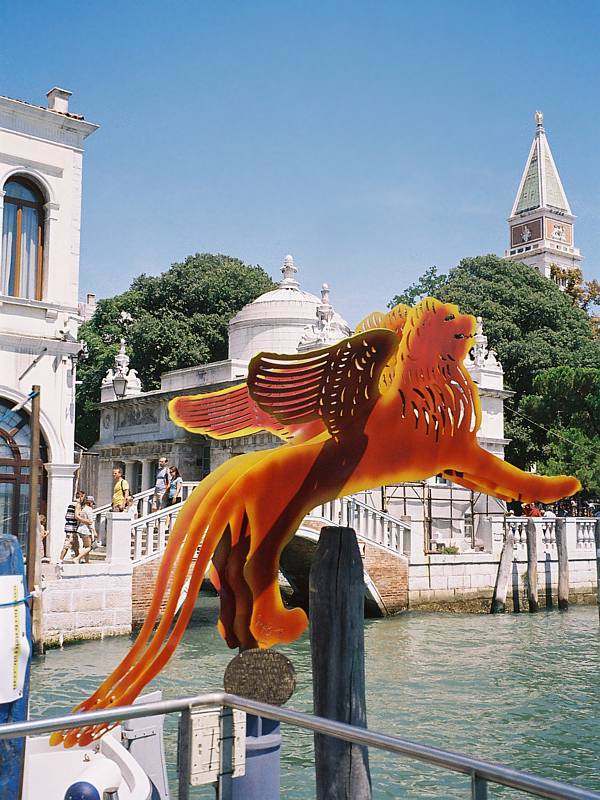 / flying lions (1987) they swim in a liquid air, You phoenix (1988) it takes back the bronzy form of an icon saved by the waters and by the fire or the other Phoenix (1997) that it revives from the liquidity of that fire that becomes glass or the triplex irons of the Gondola (2001) swaying and semilucidi in the glass acidato. 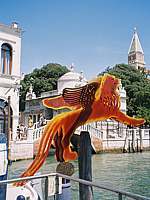 He anchors a Jellyfish (2004) howling with his furious serpentellis, but as saved and thrown above by a drowning, it expresses a brutal beauty as he knows how to be Venice especially in the comparisons of his artists. 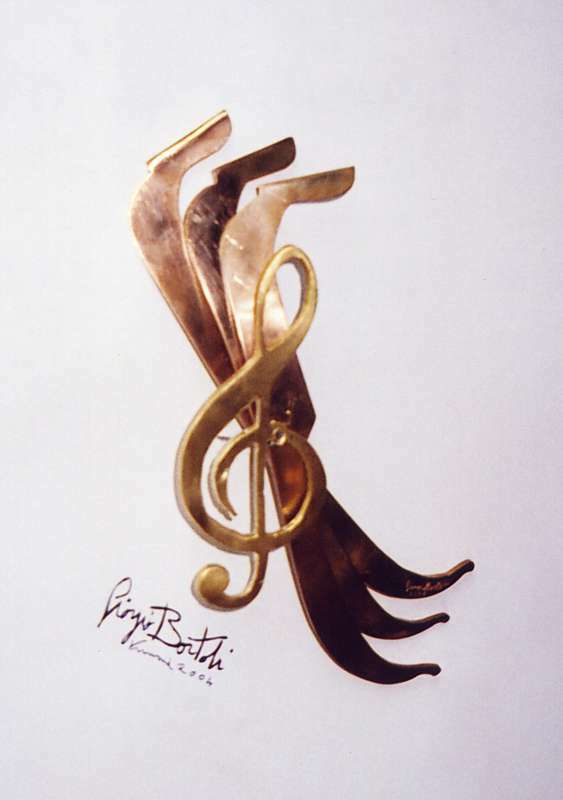 Here that beyond the whole iron wish of George Bortoli, it flexes and it shapes the iron in a series of more connected representations to the celebration of the arts of the sound and the rhythm as Paganini (19861 and the Paganinis (1988) jokingly started blarneying to the plural, so a desired clarinettist and lost for Venice Woody Allen (2004), as well as various Ballerinas it suspended with the circle of the braccias (1998) or as they walked in point of feet above the water of the low lagoons (2007). The alternating Personality (1990) it proposes with rare effectiveness the comic and symbolic effect dl too many exposed characters and unconsciously crushed by their improponibile humor. 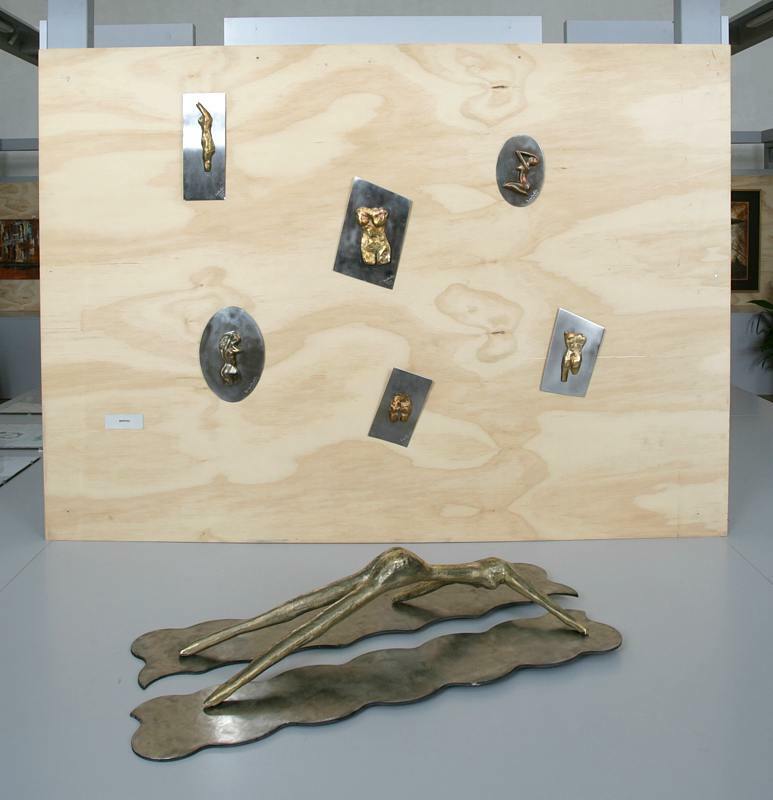 These figures of Bortoli are assimilated to the first Eccentricities (1624) as they were note called, the joined and polymorphous creations of Giovanni Baptist Bracelli, close to the helpful courtesy of the Manuesse (1987J that it approaches her to the manikins danzanti of Oskar Schlemmer. Aspects ironic these that go toward the mocking conscience of the ready made as her Chair of the Mayor (1989) or toward affirmations well more tragedians of the plague of the century, the Aids (1992) in the years of his/her slow epidemic decline. 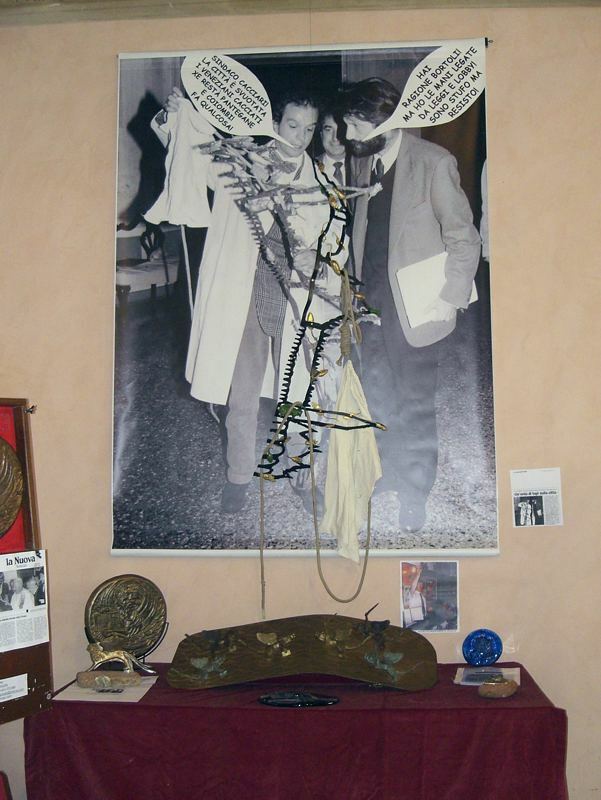 But what notices the energy of the spirit that the fleeing reality and the Leo Alato (1987 and 1997) that it brandishes" the sword against the insane idleness of his/her same inhabitants, that the creative energies of George Bortoli really they don't bear. Himself goes to ripescare from the city of the forgetfulness the dead bricks and I submerged of the old bell tower of St. Mark, saving them and risignificandoli one to one, after the dump in sea of the rubbles of the collapse (1902) and their abandonment in the arm of sea to the mouths of san Nicolò of the Beach. But this oscillating creativeness that frequents the different materials toward an orientation of affirmations and truth it spent on his own one hundred varieties, is amazing and even marvelous that isolate him and as you save him from a tortuous and forgotten history and can become a very particular gift. Certainly a true prize that seals in conclusive way an action artistic fact and brought defeasible from others. The sculpture of George comes as to call out of the condition of abandonment and makes him recognizable in the celebration and in the gift, for example integrating that wheel of the dreams that is the cinema spool. 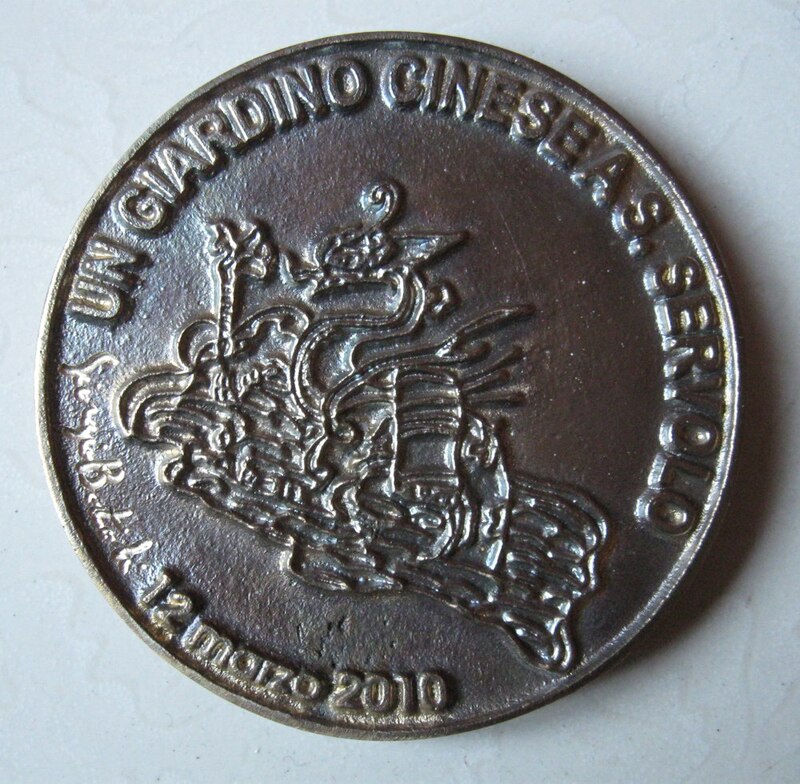 A small wheel to five rays that it becomes in plain and in lifted the historical emblem of the cinema, the last and seventh art in the contemporaneity. This happens thanks to the gift of his different arts so you weave to the various and colored subjects gone out of a fire, now possessed and tamed, from him as artist. George Manfren Bortoli was born in Venice, where still alive and he works. One artistic formation has origin in family. The Bortolis at the end of the '500 were typographers, then in the first Nine hundred they contributed to illuminate Venice cabling her/it. Aside maternal, his grandfather was a good chisels, in demand in Germany. The taste of the innovation, the awareness of the progress they are given presents in his nature. 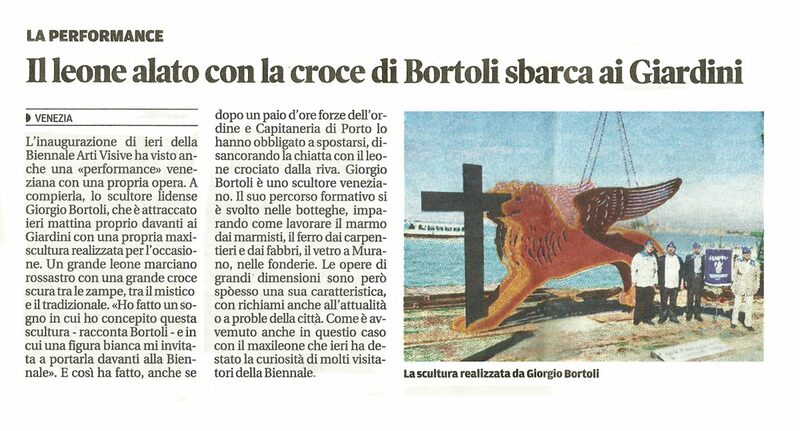 The young Bortoli has the opportunity of knowing the August sculptor Murer, during the stays in mountain, beginning to carve the wood. 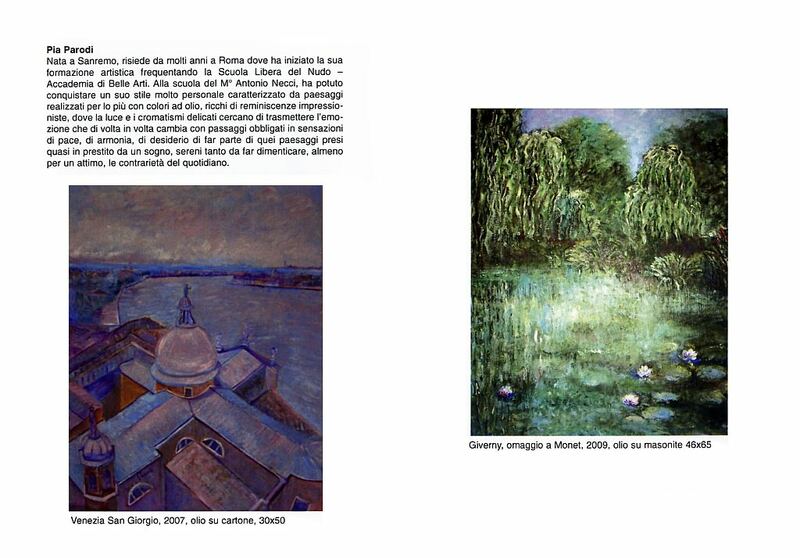 Subsequently it follows the suggestions in painter Borsato's study, exposing Bevilacqua to the Foundation the Masa. It grows working to the Theater her Phoenix, it devotes him to innovative searches in sculptural field, frequenting and discussing to Ca' Foscari with the critic and teacher Giuseppe Mazzariol, that he saw in Bortoli a Luca Di the Robbia "that it ever experimented in continuation arts and sciences sights." The historian of art Guido Perocco often goes to find him in his study to the Alberonis of the Beach and will write: "between the sea and the lagoon, near the lighthouse, among the trees, detached by the World... the young intelligent sculptor that the thin thread of the imagination follows for going over the limit, having waves and clouds as first subjects... ". It doesn't attend academies, but only studies of painters and good artisans as the artists of once, that were to shop from a teacher. The experience in Germany with the architects planners of the Olimpiaspark of Monk the door as the rector of the University institute of Architecture has told Marino Folin the "overcoming of the divisions among the arts", in this case the sculpture and the architecture, in the nature; so its archiscultura is born in steel and glass of 12 meters that it is found to the Airport in Venice. 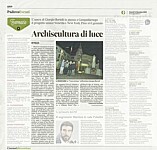 Idea sustained by the philosopher and mayor Massimo Cacciari that it brings George Bortoli to collaborate in the Office of the Cultural Good, with the intellectual and artist Guglielmo Monti, Superintendent to the Architectural Good. Same give Office, the title of Rider of the Republic him is conferred for artistic worth. 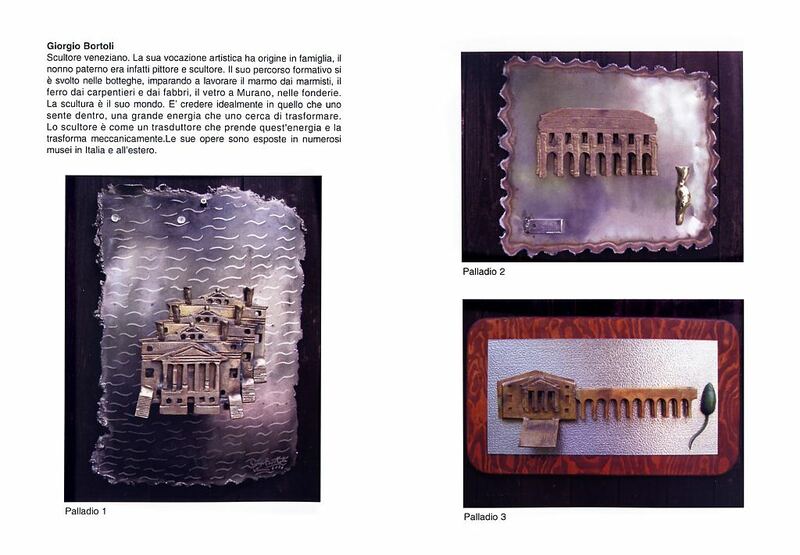 Committees of works you specifically conceive for representing the professional history of some important firms that you/they have wanted to tie his/her own name to an exclusive work of George Bortoli: Zeta 3 Couches - they Contemplate, Water Mineral S. Benedict S.p.A. - Scorzè, Love Café - Marghera, Libco - Milan, Fincantieri S.p.A. - Trieste, New Pansac S.p.A. - Mantua, Sews together Regional and Board of Veneto, Theater You Phoenix - Venice, Bench of S. Marco - Venice, Ancestress and AVAL (hotel keeper) for international show of the Cinema, The Gazzettino S.p.A., Astoria Vini - Treviso, Metraspeed - Marghera, Common of Venice, Gatorade - Milan, Ciga Starwood - New York, Mana Malcontenta - Venice, Cooperative Credit of Marcon - silver Letter Prize by F.lli Aquilani - Viterbo, the Venetian's Bank, New Gondola of gold, Casino in Venice S.p.A. Its works show up near numerous deprived collections and museums in Italy and to the foreign countries. 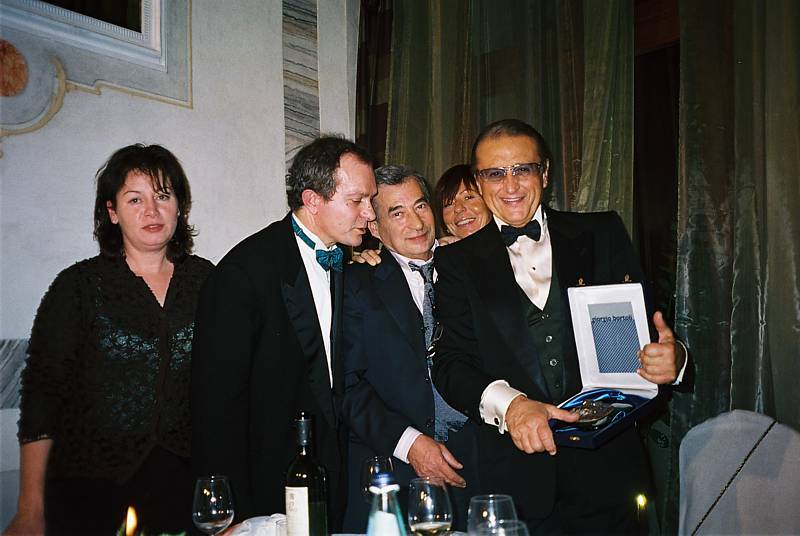 Guido Perocco, Joseph Mazzariol, Sandro Menegazzo, Beatrice H. Guthrie, Silvio Fuso, Gianfranco Pontel, Ersilio Tonini, Ermenegildo Fusaro, Massimo Cacciari, Bruno Rosada, Marta Marzotto, Vittorio Sgarbi, Paola Puccinì, Stephen Zecchi, Alberto Francescani, Sea Folin, Paul Costa, Claudio Zanuttigh, Franco Perlasca, William Monti, Roberto Turetta, Manlio Brusatin. 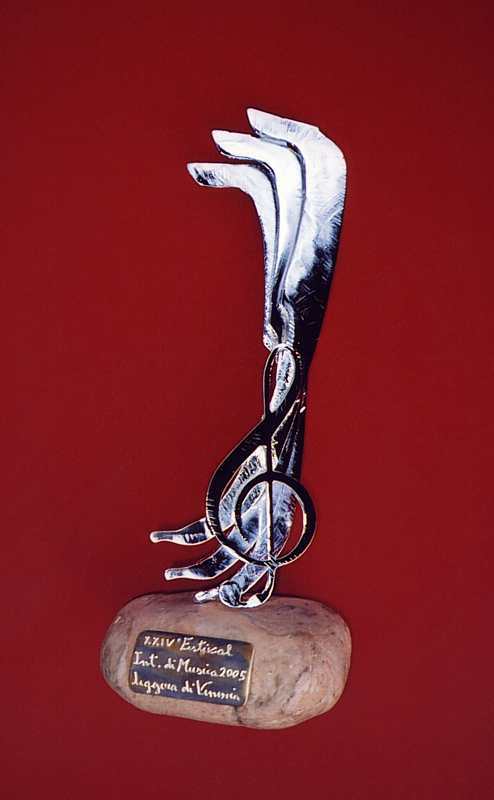 Prize of Poetry "silver Letter"
Great poetries read by famous actors that, for an evening, they have so "lent" their voice to exalt even more of it, the go it - king, on the notes of the orchestra that, live you has accompanied the various ones, "performance." These the ingredients that, Tuesday evening, they have decreed the triumph of the poetry to the Gran Theater you Phoenix of Venice. 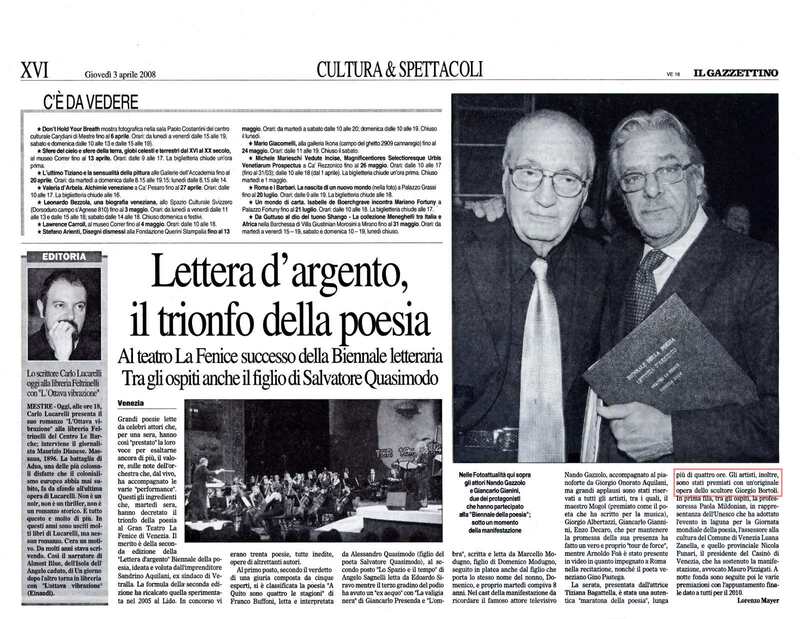 The worth is of the second edition of the "silver Letter" Biennial of the poetry, conceived and wanted by the entrepreneur Sandrino Aquilani ex mayor of Vetralla. The formula of the second edition has traced that experimented in 2005 to the Beach. 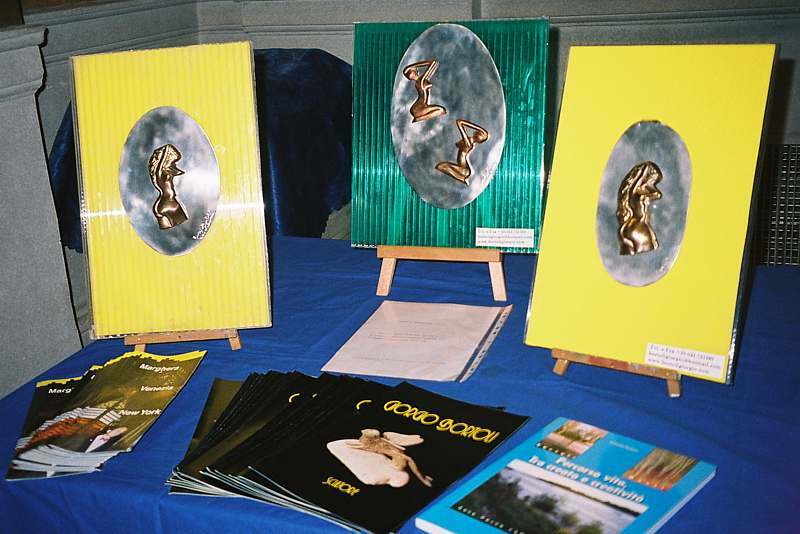 In contest there were thirty poetries, all unpublished ones, works of as many authors. 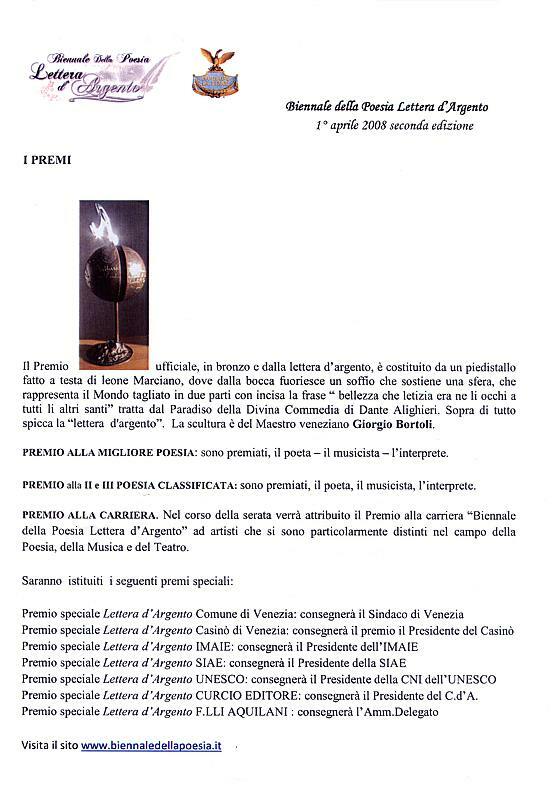 To the first place, according to the verdict of a jury composed by five experts the poetry you is classified "A Quito is four the seasons" of Franco Buffoni, read and interpreted by Alexander Quasimodo (child of the poet Salvatore Quasimodo), per second place "The Space and the time" of Angel Sagnelli read by Edward Siravo while the third step of the platform has had a "ex aequo" with "You black suitcase of Giancarlo Presenda and "The shade, writing and glance from Marcello Modugno, child of Domenico Modugno, follows also in the stage from her child that he bears the same name of her grandfather, Domenico, and really Tuesday turned 8 years old. 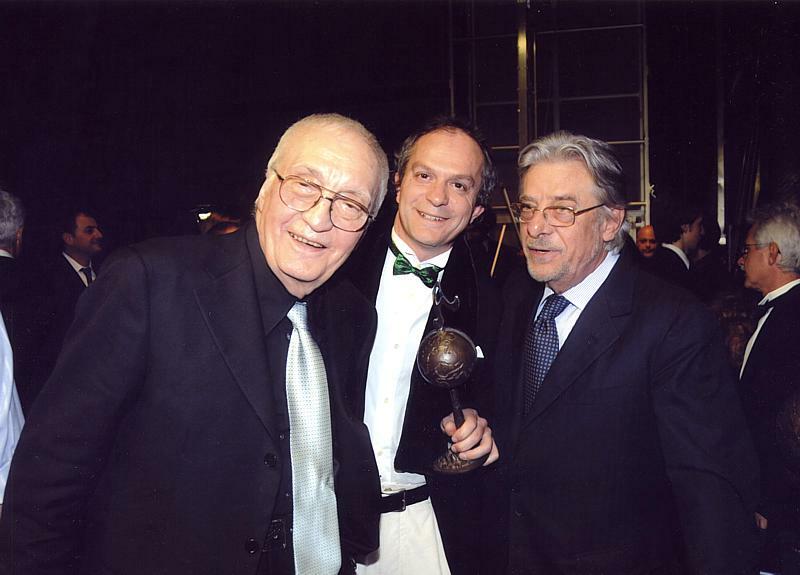 In the cast of the demonstration to be remembered the famous television actor Nando Gazzolo, accompanied to the piano by George Onorato Aquilani, but great applauses have been reserved to all the artists, among which, the teacher Mogol (winning as the poet that has written for the music), George Albertazzi, Giancarlo Giannini, Enzo Decaro, that the promise of its presence to maintain has done a real "tour de force", while Arnoldo Foà has been present in video in how much busy to Rome in the recitation, as well as the Venetian poet Gino Pastega. 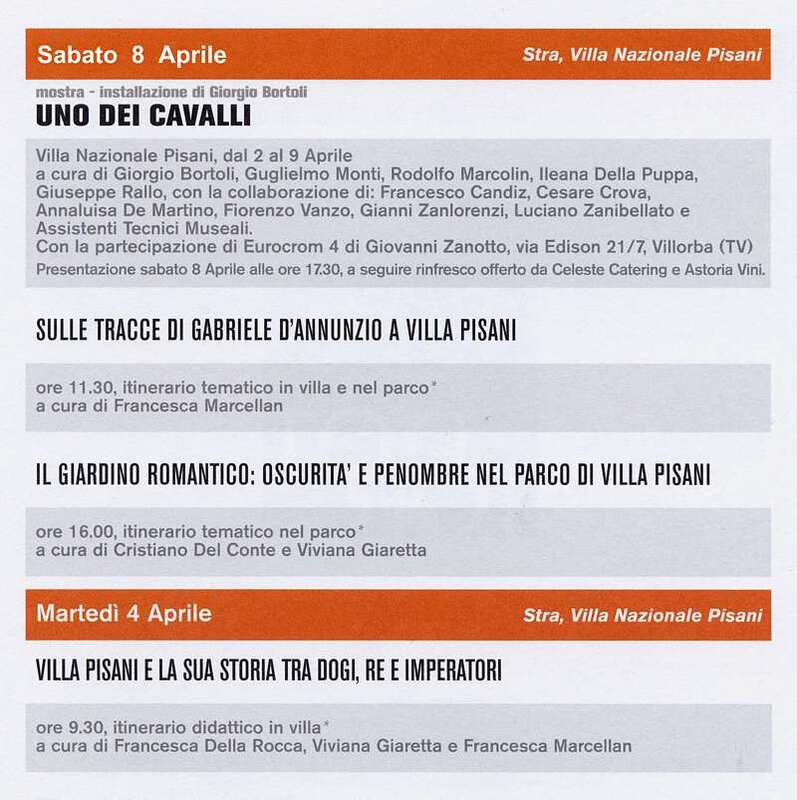 The evening, introduced by the actress Tiziana Bagattella, you/he/she has been one authentic "marathon of the poetry", long more than four hours. 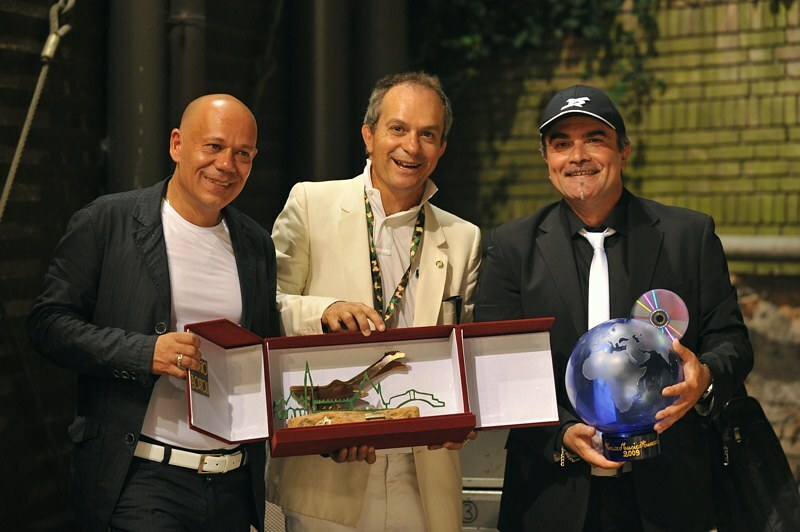 The artists, have been winning besides with sculptor Giorgio Bortoli's original work. 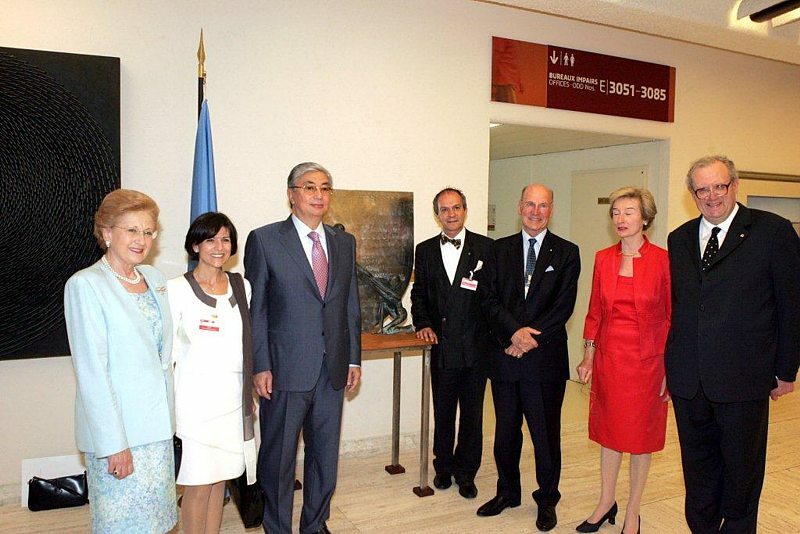 In the first row, among the guests, the teacher Paola Mildonian, in representation of the Unesco that he has adopted the event in lagoon for the world Day of the poetry, the alderman to the culture of the Comune in Venice Luana Zanella and that provincial Nicola Funari, the president of the Casino in Venice, that has sustained the demonstration, awocato Mauro Pizzigati. 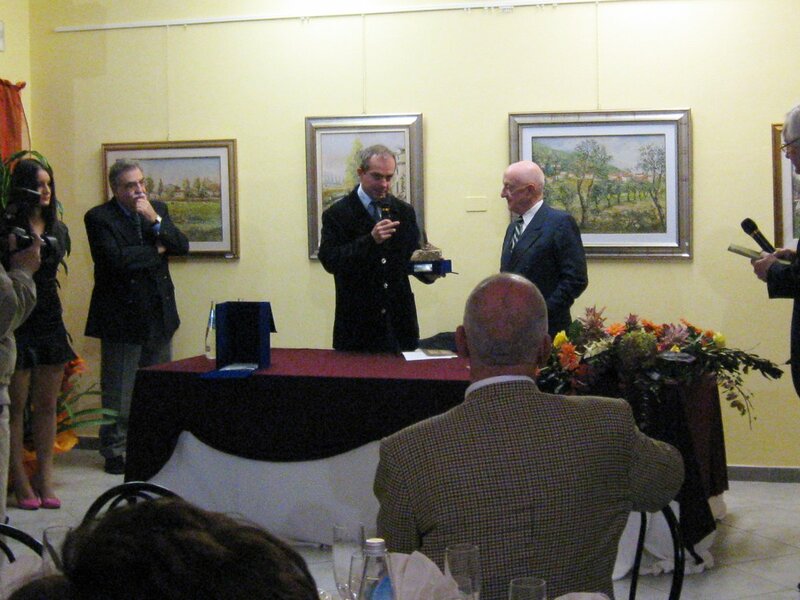 To deep night the various awardings are followed with then the appointment final datum to all for 2010. 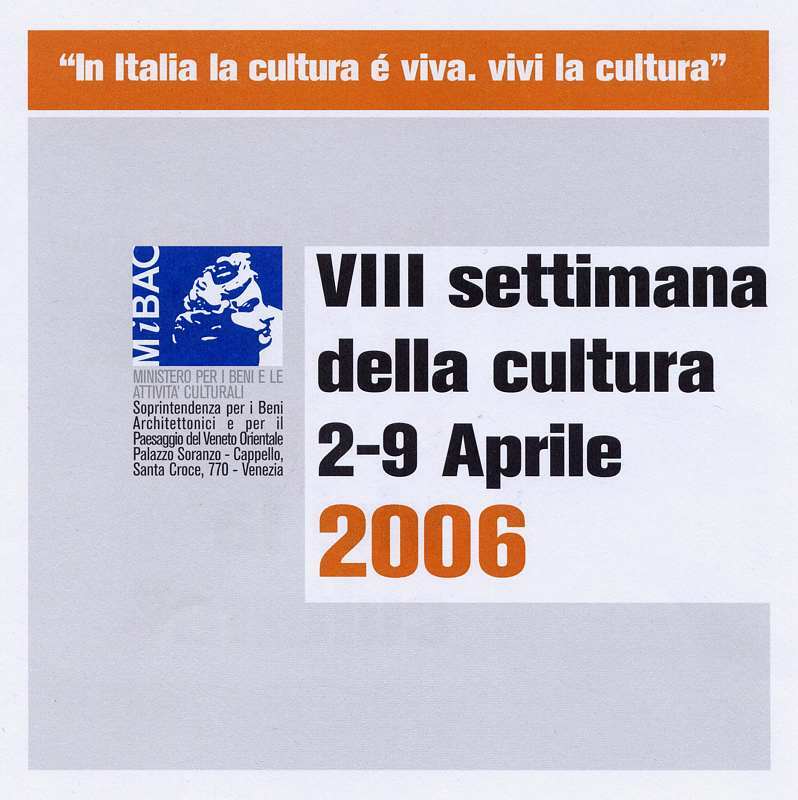 The date in which the second Biennal exhibition of the Poetry silver Letter will develop him you/he/she has been fixed for April 1° th 2008, to Venice, near the Theater The Phoenix. 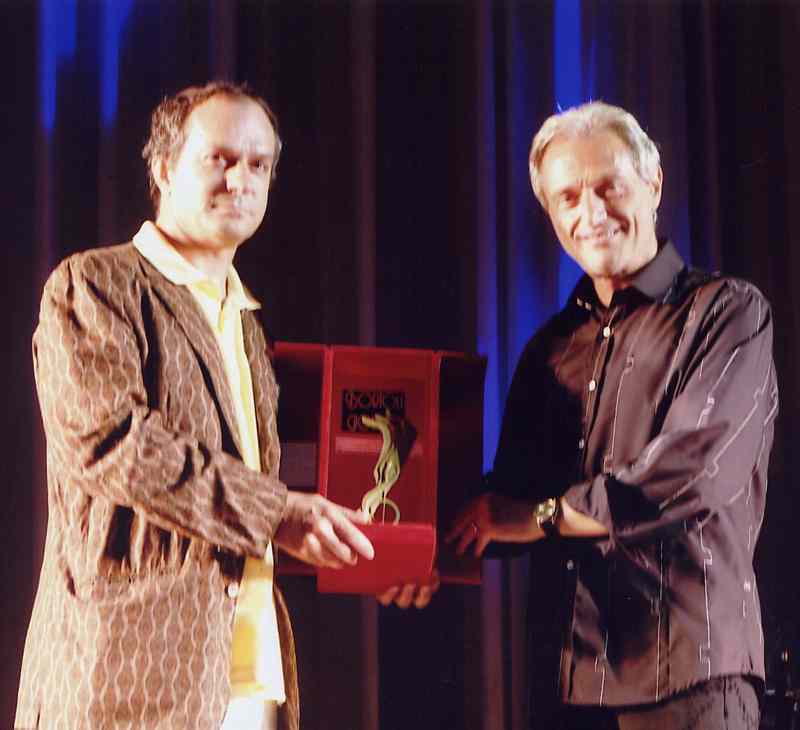 In synthesis, a true Sanremo of the Poetry, that will succeed in putting together the most prestigious names of the world of the poetry, of the theater, of the music (Poets, Actors, Composers and Managers of orchestra). 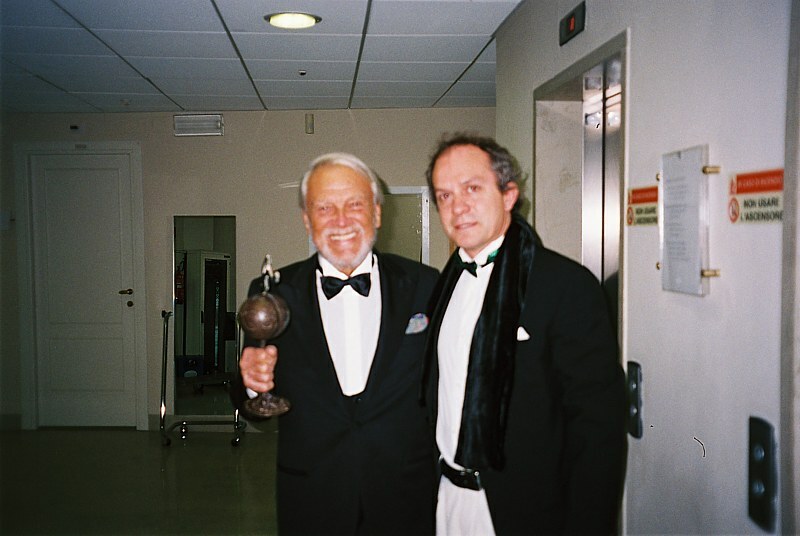 A prestigious stage, a great orchestra, unpublished poetries, musical structures to theme compotes on the poetries, the most beautiful voices in the Italian theater, managers of orchestra that alternate him national and international guests. 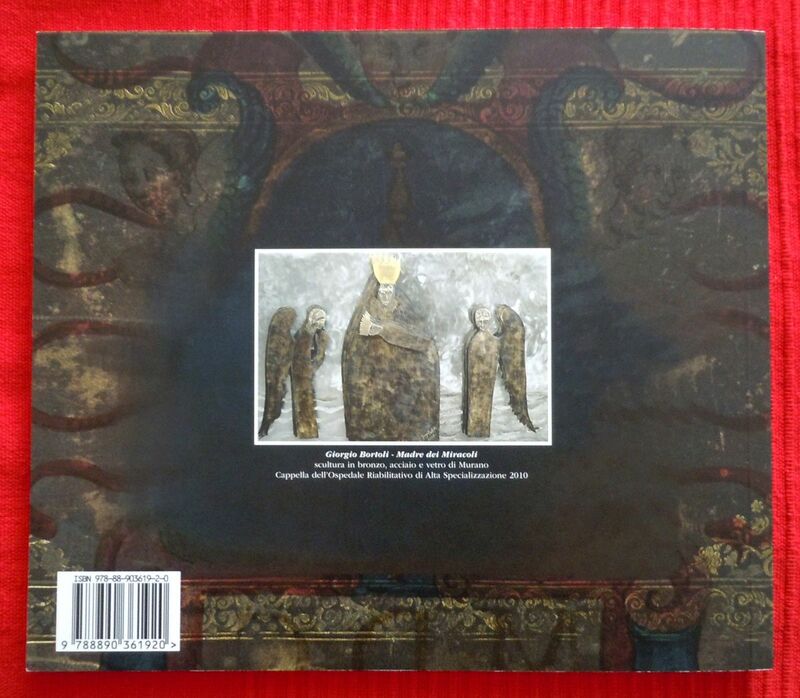 Among the poets that have already sent their poetries we find: Maria Luisa Spaziani, Alda Merini, Andrew Zanzotto, Ennio Cavalli, Franco Buffoni, David Rondoni, Antonella Anedda, Renato Minore, Alexander Fo, Gabriella Sica, Conrad Calabrò, Dante Maffia, Sergio Zavoli, Helen Clementelli, Alberto Toni, Stefania Lubrani, Angel Sagnelli, Gianni Pizzolari, Daniel Pieroni, Giancarlo Pontiggia, Joseph Mannino, Vittorio Squillante, Dania Lupi, Ivan Nossa, Lucy Monaco and other anchor. 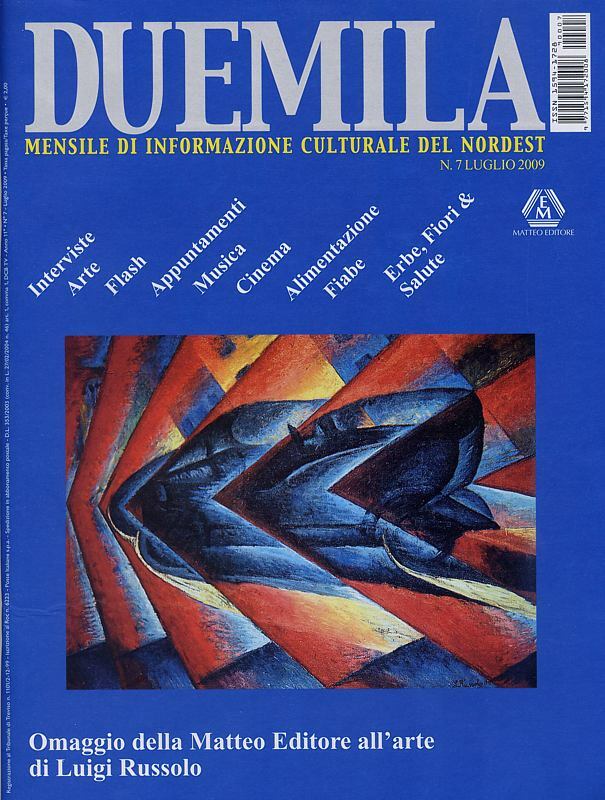 Among the actors we find, Nando Gazzolo, Arnoldo Foà, Kim Red Stuart, Marcello Modugno, Marisa Solinas, Enzo Decaro, Tiziana Bagatella, Piermaria Cecchini, Edward Siravo, Vanessa Gravina and others. 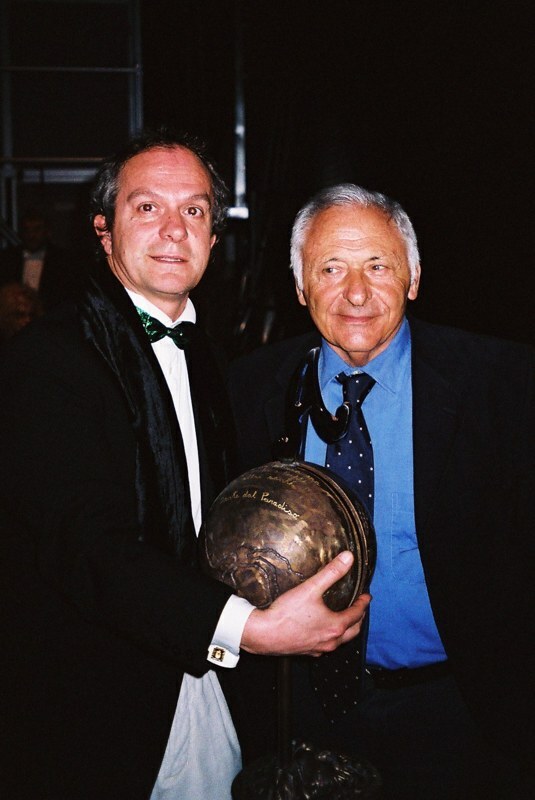 Between the musicians and managers of orchestra Renato Serio, Said Mariano, Pino Donaggio, Angel English, Amedeo Minghi, Vittorio Iué, Christmas Massara, Maurice Abeni, Roberto Procaccini, Tub Carollo, George, Stephen Borzi, Cristian Mele, Fred Cecchini. 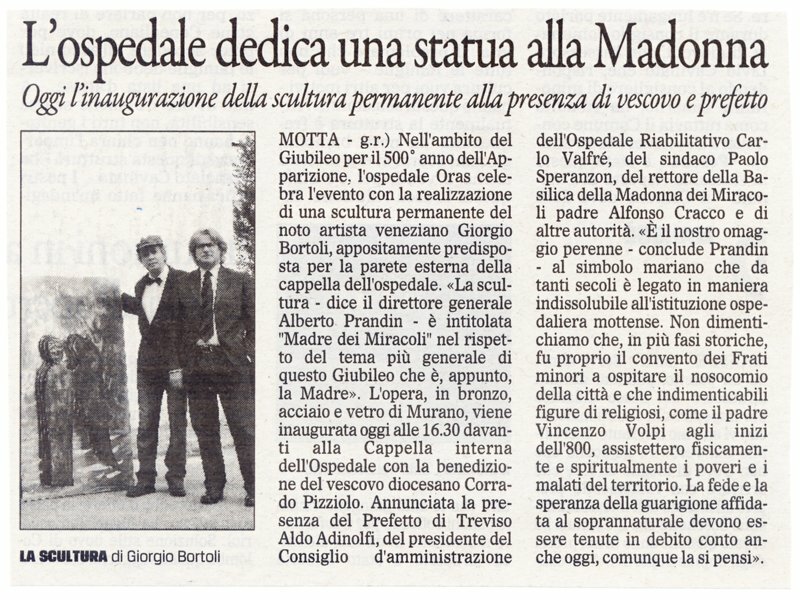 Among the guests, Alexander Quasimodo, then a poet that has written for the music: Giulio Rapetti in art Mogol and others two prestigious presences George Albertazzi, Giancarlo Giannini. 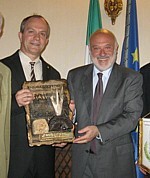 The event has gotten the Patronages of the Commune in Venice, of the Province in Venice, of the Region Veneto, of the SIAE, of the IMAIE, the adhesion of the President of the Republic Italian George Napolitano with the assignment of a silver medal, finally the Patronage of the Italian Committee Nazionale for the UNESCO, within the World Day of the Poetry. 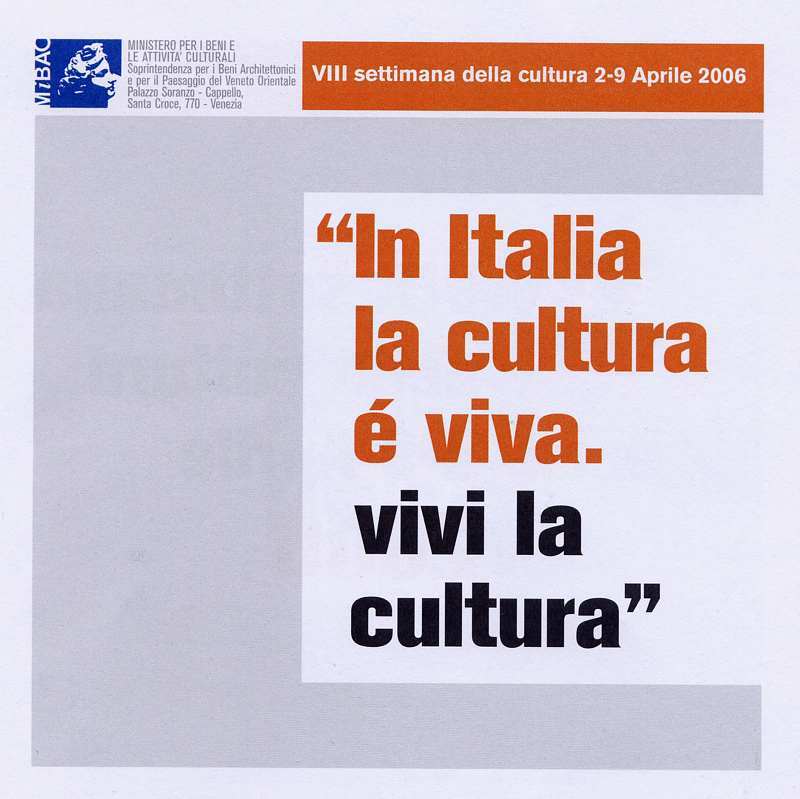 The press conference of presentation will be held by the Mayor of Venice Massimo Cacciari, with the presence of the Assessora Luana Zanella, of the President Sandrino Aquilani and numerous guests of the world of the culture and the show, on March 20 to her times 13 to Ca' Doublets near the center of the Commune. 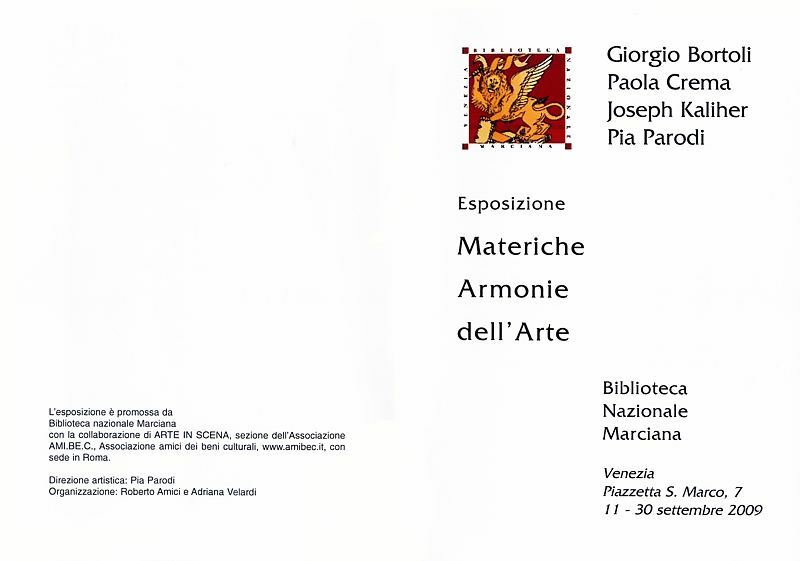 To support of the event the project "you Promote Culture he/she Adopts a Poetry silver Letter" You Curcio Editore will take care of the publication post event with attached DVD. 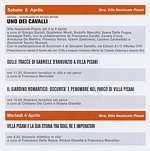 Biglietti/Tickets near the net of sale FIellovenezia www.hellovenezia.com Sponsor partner Country house' Of Venice and F.LLI AQUILANI. 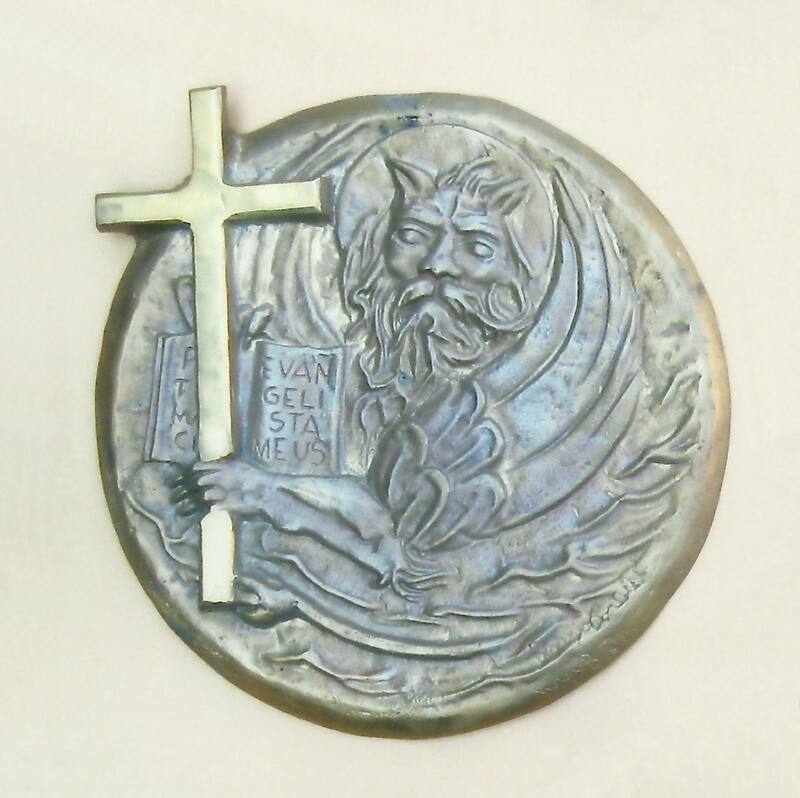 The official Prize, in bronze and from the silver letter, you/he/she is constituted by a pedestal done to head of lion they March, where from the mouth it escapes a puff that a sphere sustains, that the World represents cut in two parts with engraved the sentence " beauty that joy was them of it eyes to all of them other saints" drawn by the Heaven of the Divine Comedy of Dante Alighieri. Above of all detaches her/it "silver letter." 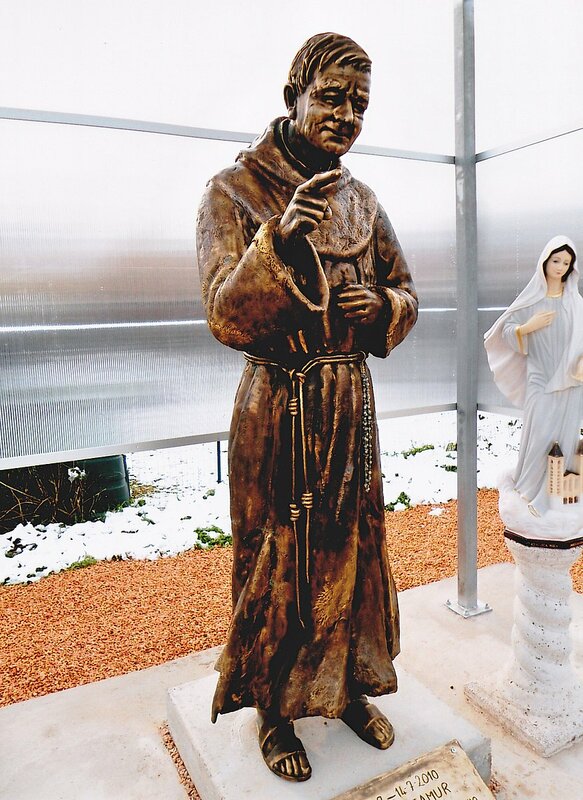 The sculpture is of the Teacher Venetian George Bortoli. I REWARD Á. 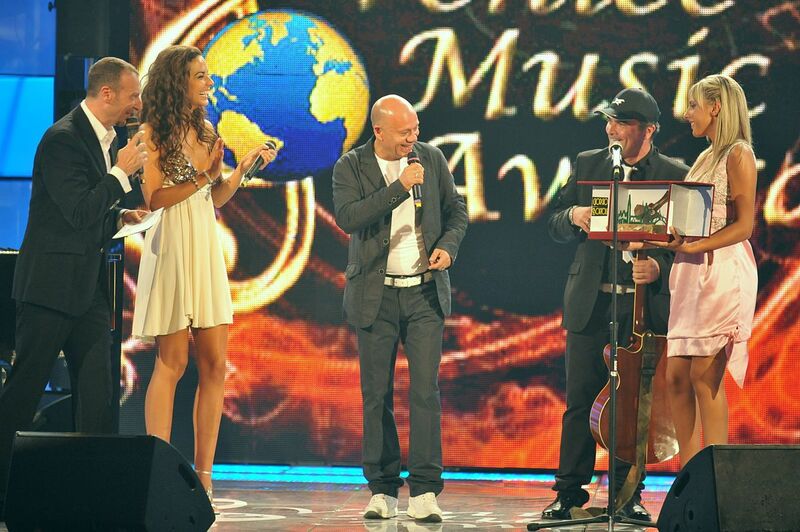 THE BEST POETRY: the poet they are winning - the musician - the interpreter. 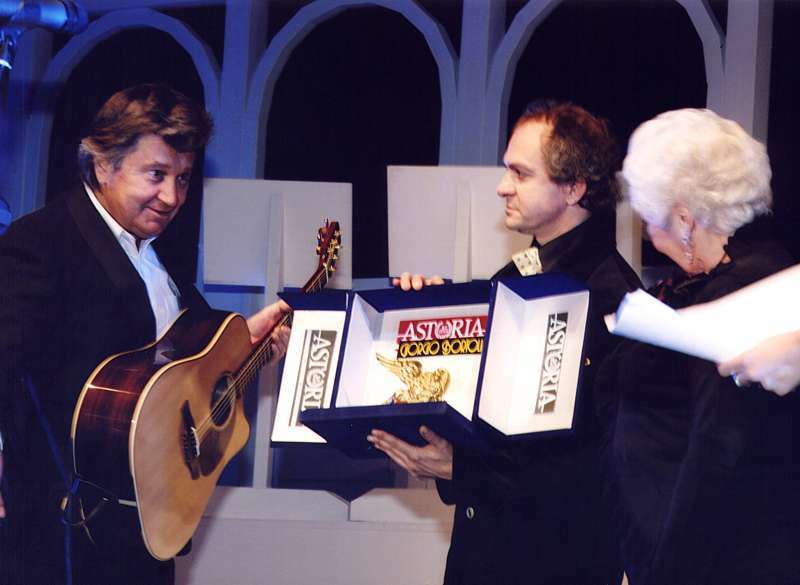 I reward to the II and Classified III Poesia: the poet they are winning, the musician, the interpreter. I REWARD Á. THE CAREER. 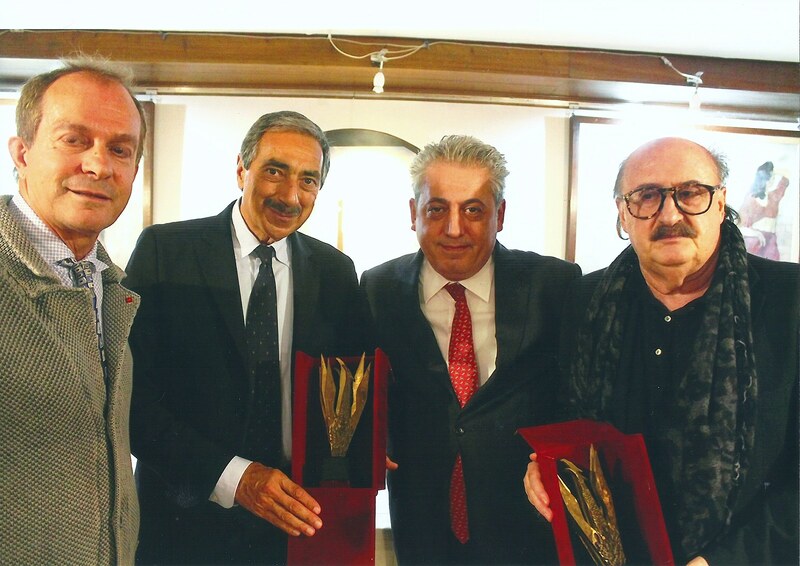 During the evening the Prize will be attributed to the career "Biennial of the Poetry silver Letter" to artists that are particularly separate in the field of the Poetry, of the Music and of the Theater. his/her own compositions with delicate flexuosity and a spigolosa in the justness of the curvilinear ones to great effect materico. 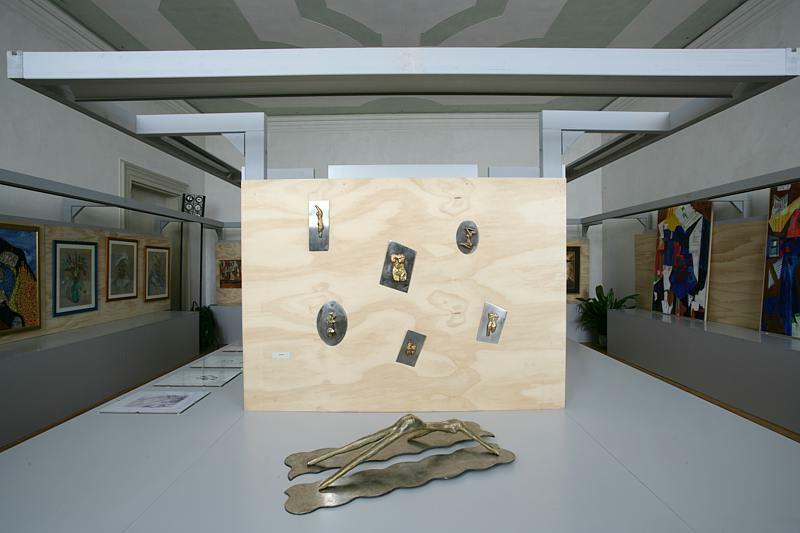 The works of Bortoli are graven in bronze and steel inox with the addition of brassed material and they appear engraved with cut of measures almost combined to give a pulsation of great intensity and fluorescent realistic result of it. 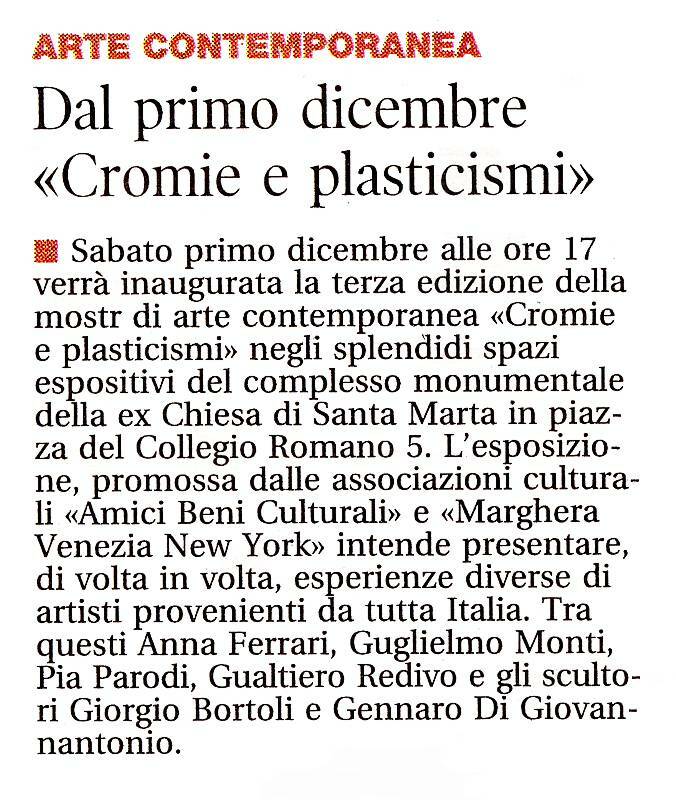 Saturday first December to her times 17 will be inaugurated the third edition of the show of contemporary art «Cromie and plasticismi» in the splendid spaces espositivi of the monumental complex of the ex Church of Saint Marta in plaza of the College Romano 5. 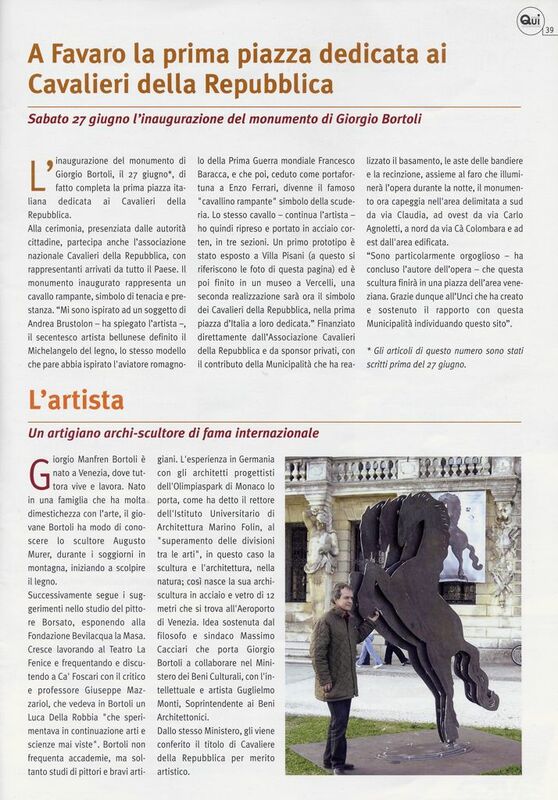 The exposure, promoted by the cultural associations «Friends Cultural Good» and «Marghera Venezia New York» it intends to introduce, of time in time, different experiences of artists coming from Italy. 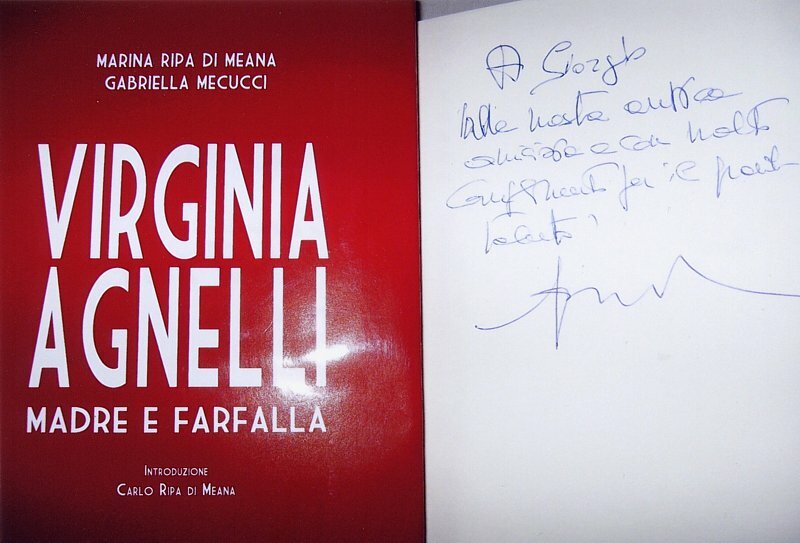 Among these Ann Ferrari, William Monti, Pious you Parody, Walter Redivo and the sculptors Giorgio Bortoli and Gennaro Of Giovannantonio. With a brief ceremony to admiral Stefano Vignani's presence, you/he/she has been situated in the aqueous space of the Capitaneria of I Bring of Venice, the new work of the sculptor Venetian George Bortoli. 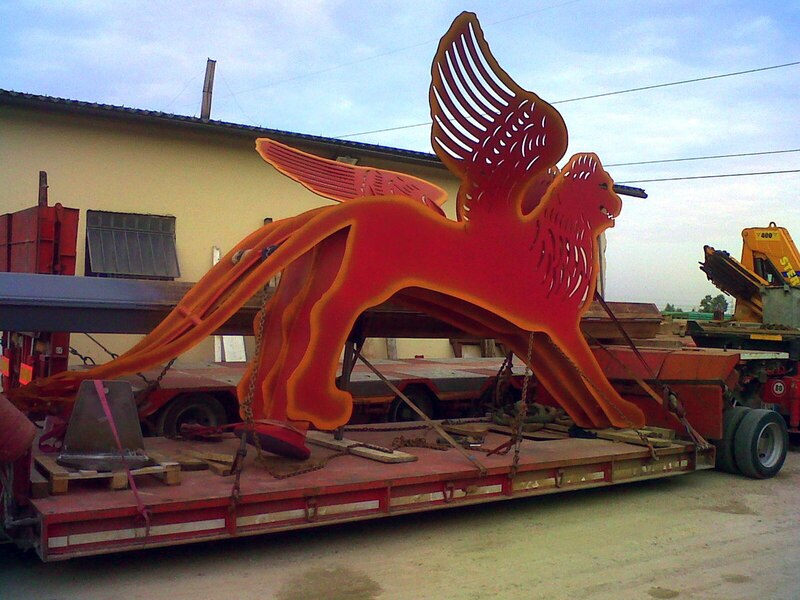 And' a lion in steel with the colors of the gonfalone of the Serene one; along two meters and a half, hangs around 5 quintals. 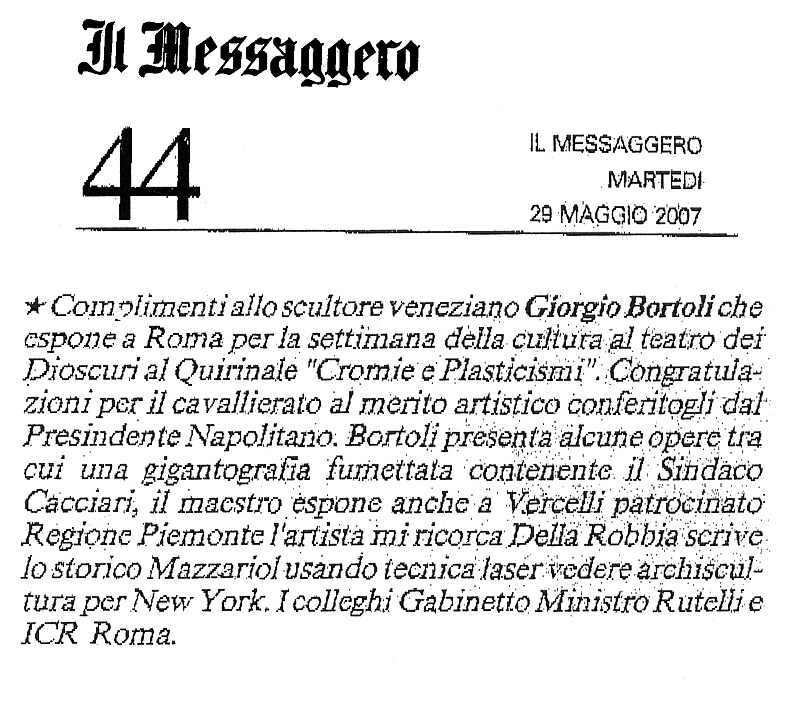 You compliment to the sculptor Venetian George Bortoli that it exposes in Rome for the week of the culture to the theater of the Dioscuris to the Quirinale "Cromie and Plasticismi." 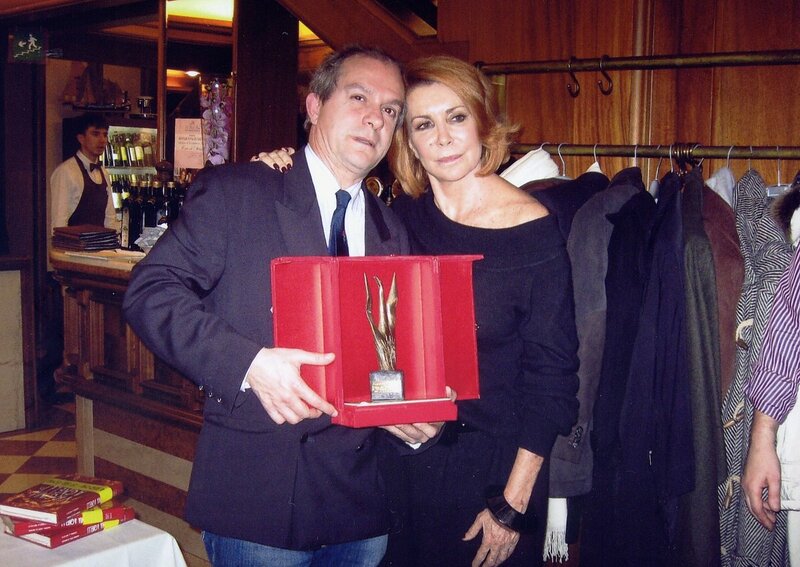 Congratulations for the cavallierato to the artistic worth conferred him by the President Napolitano. 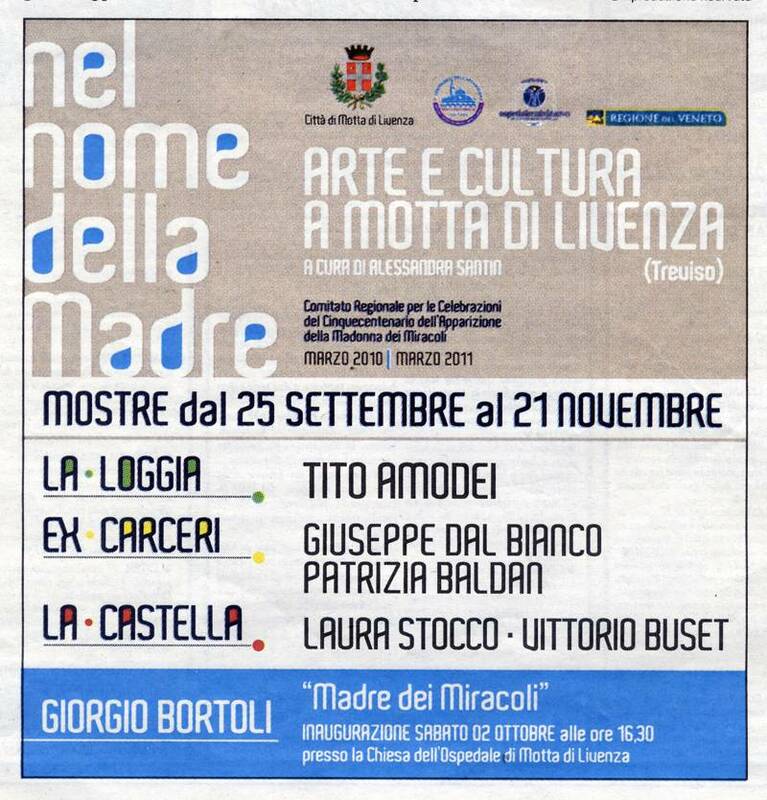 Bortoli introduces some works among which a gigantografia containing fumettata the Mayor Cacciari, the teacher also exposes patronized Region to Vercelli Piedmont, the artist he remembers the Robbia, he writes the historical Mazzariol, using laser technique to see archiscultura for New York. 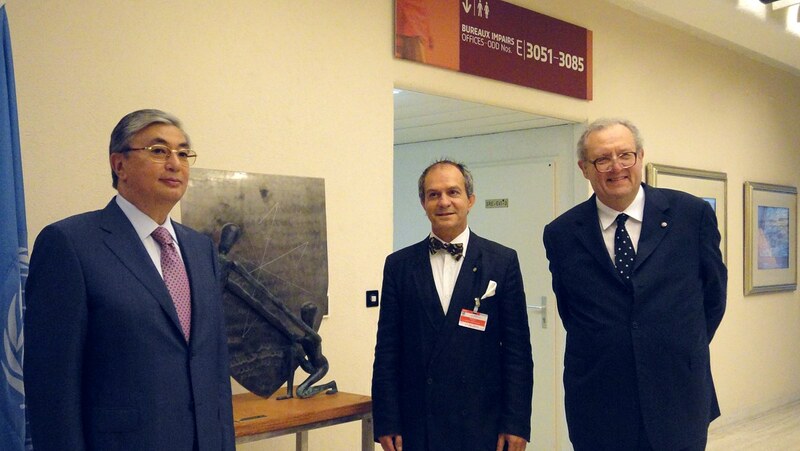 The colleagues Gabinetto Minister Rutelli and ICR Roma. to since. 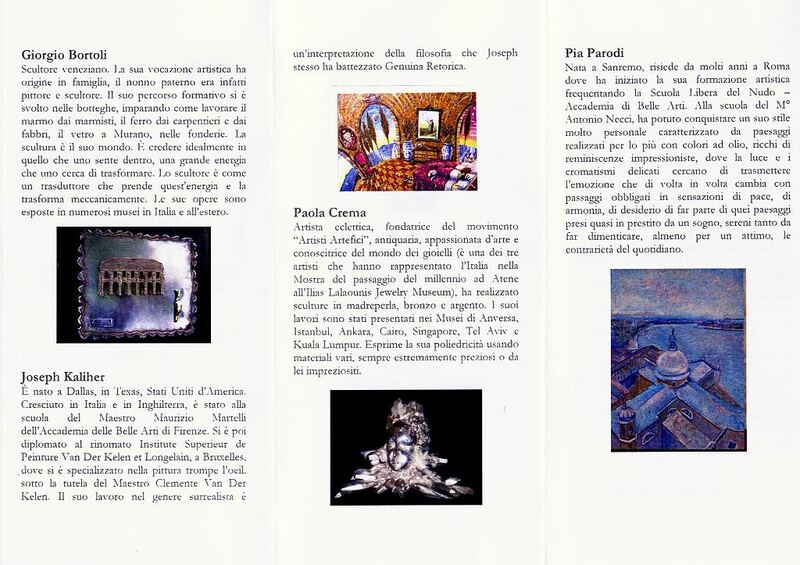 and above, some photos of teacher Bortoli's exposure, near the theater of the Dioscuris to the Quirinale, Rome extract of the brochure of the week of the culture, regarding the Region Piedmont and related to the presentation of the exposures, near the Park Blades of the Sesia, of the works of the Teacher Bortoli and the painter Guglielmo Monti. 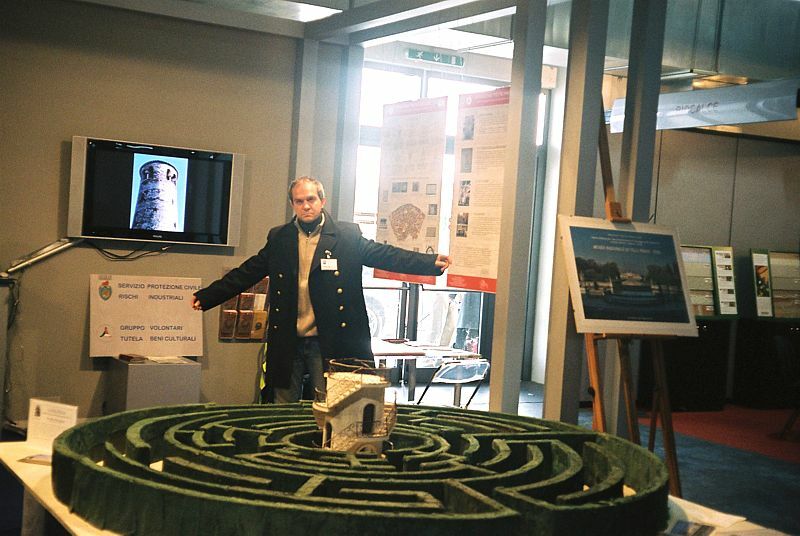 The Teacher Giorgio Bortoli with the ancient one models of the labyrinth of Villa Pisani of Stra, from himself recently restored. 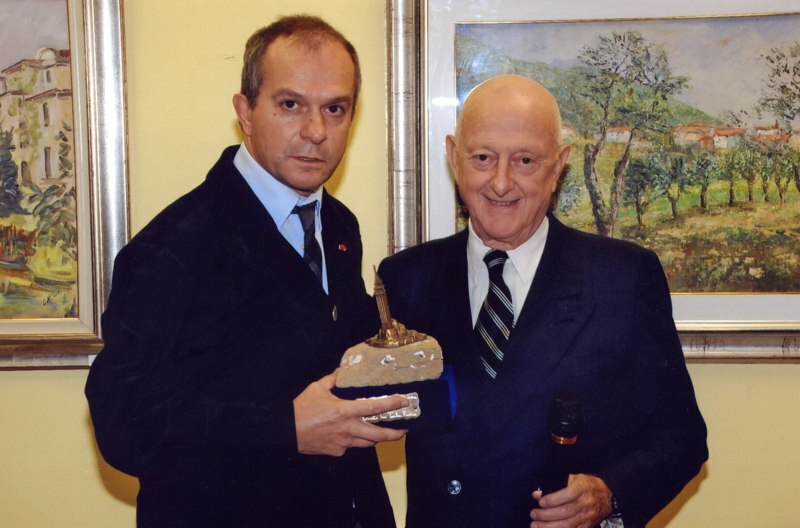 Tony Renis, to the right of George Bortoli in the photos, while it is receiving from the sculptor one work of his, on the occasion of the awarding of the "gold Leo." 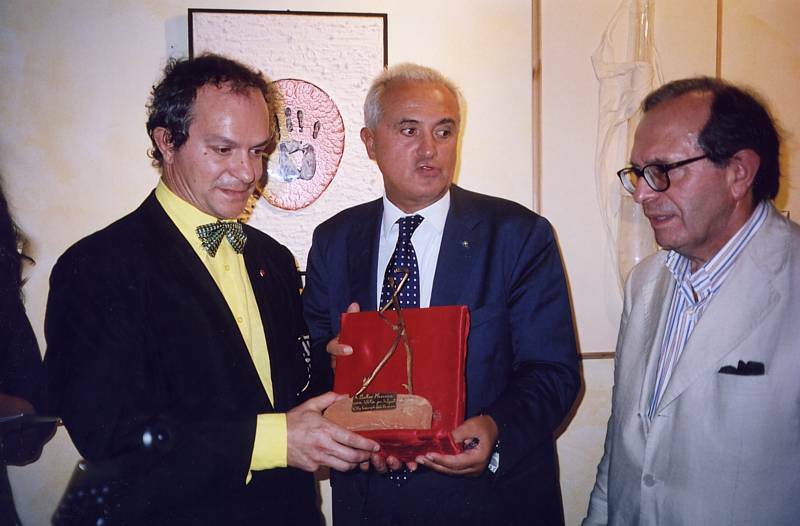 Pietro's Mennea awarding (to the center) with Teacher Bortoli's sculpture (to the left) entitled "Ermes." 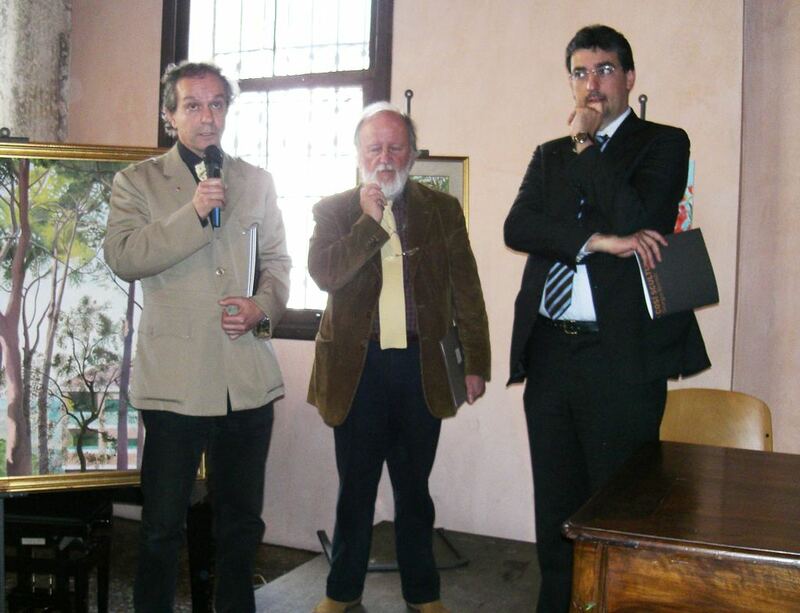 To the right the alderman to the Culture for the Province in Venice Nicola Funari. 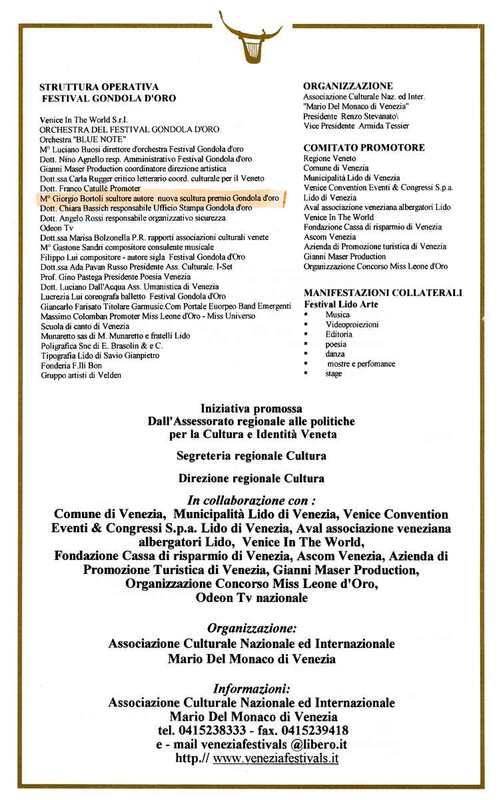 International festival of Light Music of Veneto "gold Gondola"
Natascia Stefanenko rewards the "Matia Bazar"
The review shows their qualities, fruit of a long passion and an appointment already crowned by important successes and recognition. 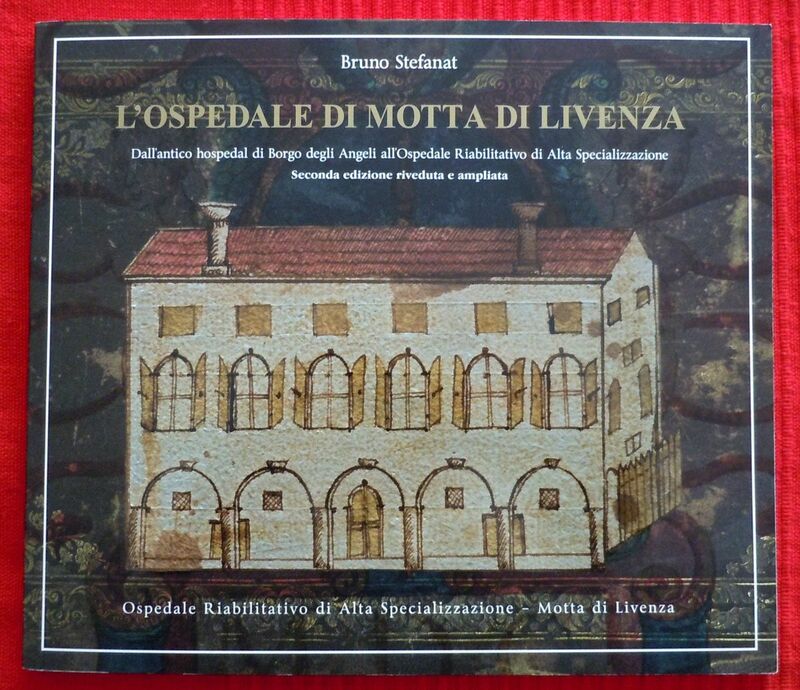 edited by George Bortoli, William Monti, Rodolfo Marcolin, Ileana Di the Puppa, Joseph Rallo, with the collaboration of Francis Candiz, Caesar Crova, Annaluisa De Martin, Fiorenzo Vanzo, Gianni Zanlorenzi, Luciano Zanibellato and Technical Assistants Museali. 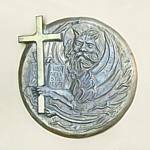 The prize in bronze is constituted by a pedestal done to head of lion they March, where from the mouth it escapes a puff that the World sustains Cut in two parts with the writing engraved of a passage of the Heaven of Dante Alighieri and above of all detaches the silver letter. 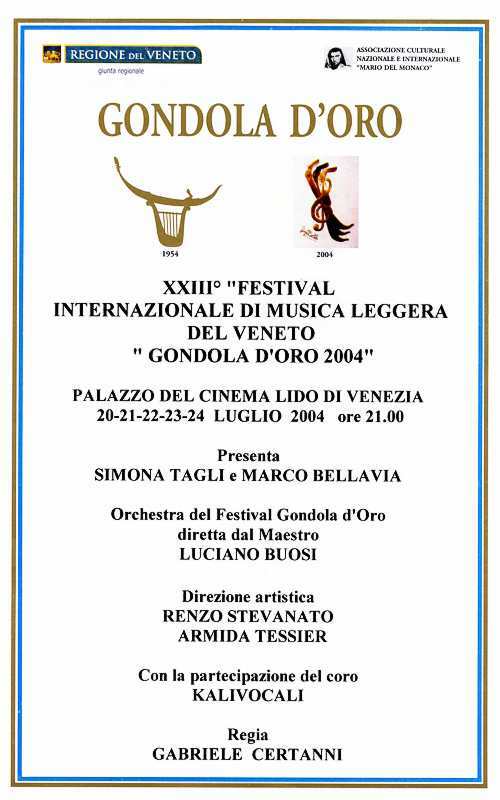 It was the Commune in Venice with his assessorato to the Tourism in collaboration with the firm of Stay, straight line then from Natalino Scarpa, to sustain the entrepreneur of shows Milanese Gianni Ravera in to launch the international Show of the light music to Venice and therefore to assign the gold Gondola prizes and of silver to the best singers and affirmed complexes, emergent and new. 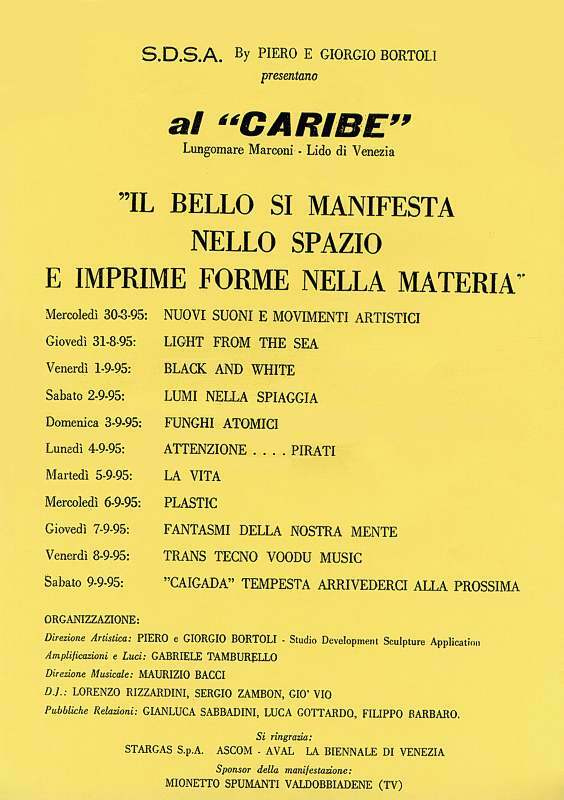 It was the 1954 four years after that Festivals of Sanremo that it gives as anchor artistic nobility and economic popular success to those people who participate you. 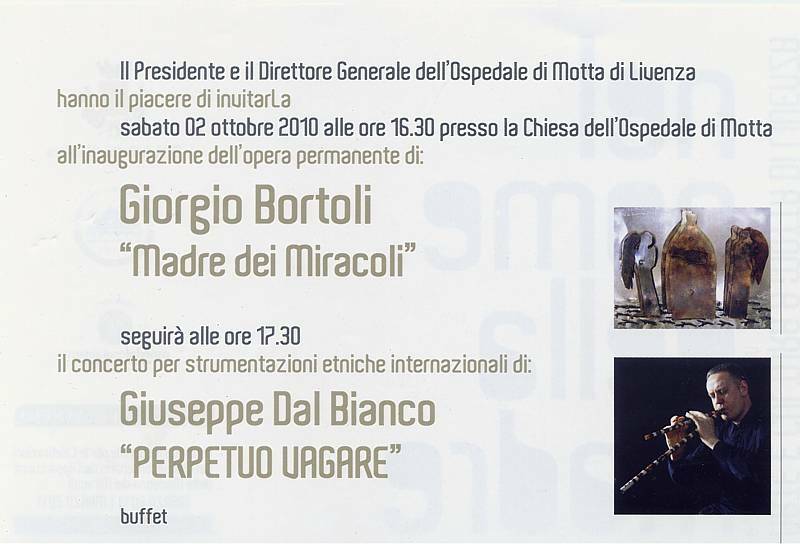 In that year, besides the Festival for antonomasia in Italy, in to proliferate of demonstrations devoted to the light music, other initiatives were successful, the Festival cafe of Vittorio Salvetti and the cantagiro of Radaelli, combined to that ciclistico of Italy. 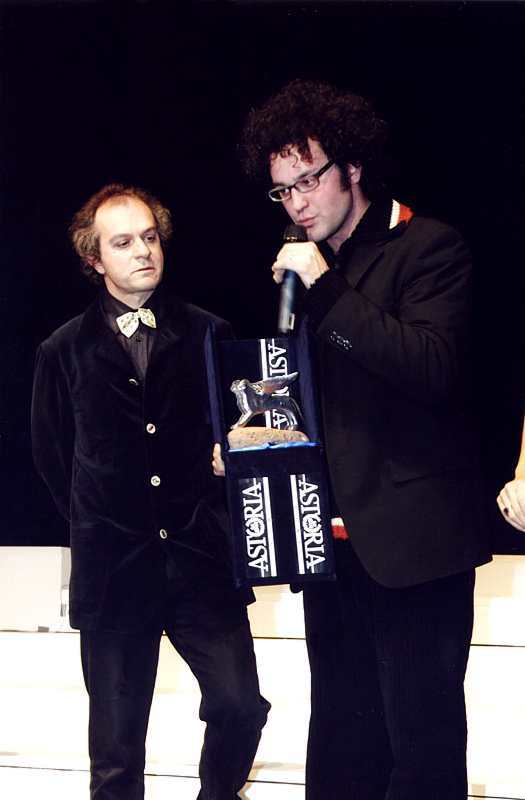 With to spend some years it was the name of the prize, in the double version of gold Gondola and silver Gondola, to prevail on that of international Show of the light music, autonomous review that went to integrate the placard of the Biennal exhibition in Venice, that today of this music doesn't occupy him yet really. 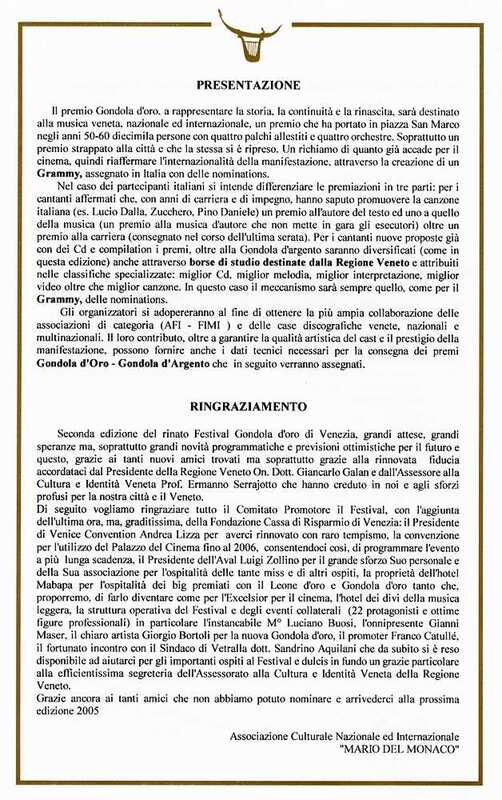 It was successful, both for the share and for the select period, that autumn toward the winter (Sanremo between winter and spring, Cantagiro among spring and summer and Festival cafe summer - autumn) with the intent to celebrate in Venice the year of the light music. They developed 9 editions, continuous from 1954 to 1963. 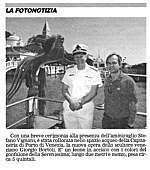 The top of the success of the public the gold Gondola had him/it in 1959, when the kermesse, that developed him in the dock of St. Mark, moved him in the adjacent great plaza: well 4 stages with as many orchestras and 10 thousand spectators sat in the third evening, that final. Then a break and resumption in 1971. They had other 5 editions, in 71, 72, 75, 81 and 82. In the periods of absence the demonstration moved him to the other centers, what Shore of the Garda, Champion and Saint Vincent, adjourning of time in time i1 name of the original prize (gold sail...). 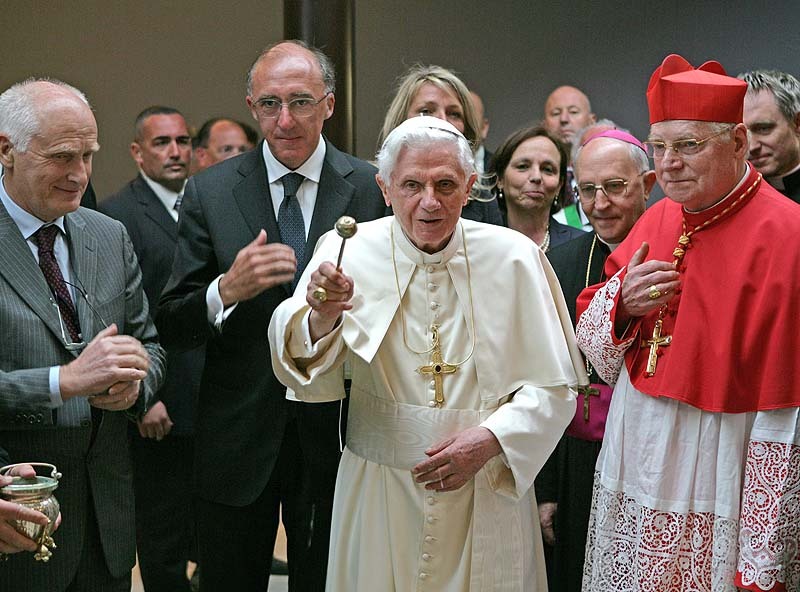 In the years '80 were inserted in the actual management the association International Mario Di the Monk respectively held up by Renzo Stevanato and Armida Tessier President and deputy president of the same one that induced the Commune (in truth with least share) to reassume the initiative. 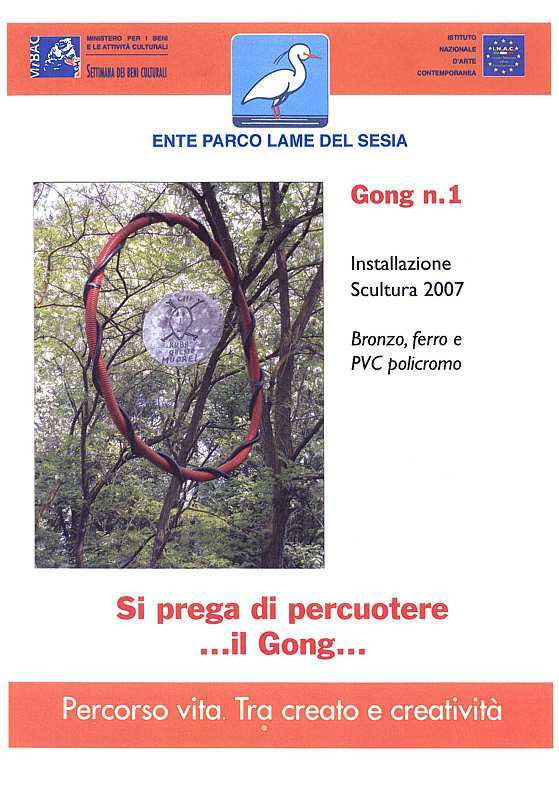 It was not able however to continue with the name of gold Gondola (the mark was still appanage of the Raveras) for which shift on that of gold Leo ex gold Gondola, formally hooking the (competed of light music to the Biennal exhibition. 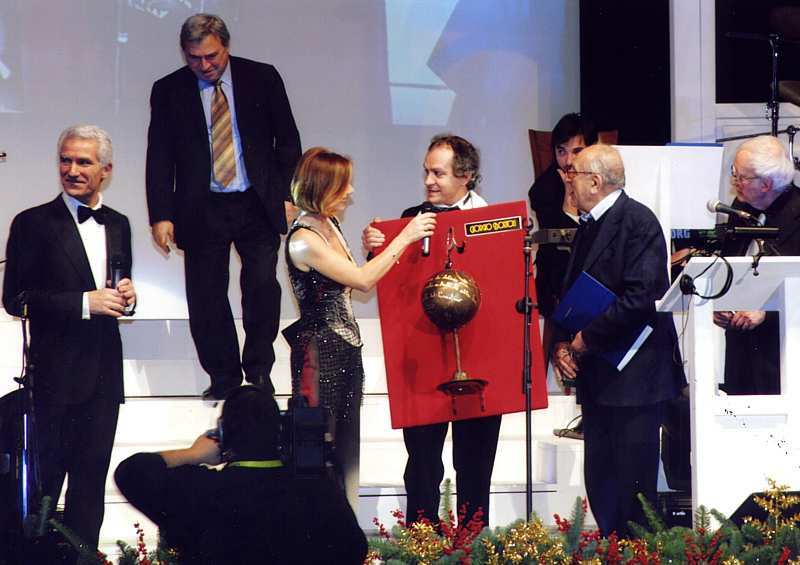 From to the time up to 1999, alternating the center among the dock of St. Mark, the piazzetta and the Theater Goldoni, the Building of the cinema and the Theater of the Casino the Pearl is kept with the mark gold Leo on giving continuity to the show and finally from 2000 after years of appeals and confrontations, the association Mario Di the Monk, together to other collaborations among which the society Venice In The World has succeeded in bringing the mark gold Gondola in lagoon. 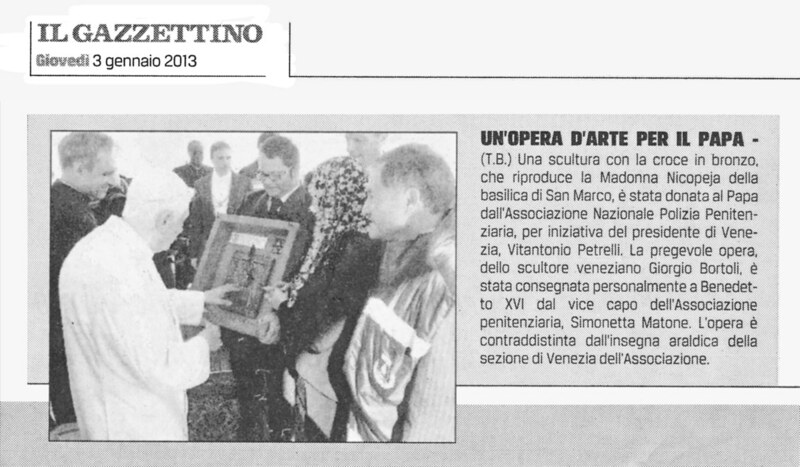 The year of the turn and the true support is 2003 and this, thanks to the entrance in "scene" of the Region Veneto that, with Your President Giancarlo Galan and particularly, the Assessorato to the Culture and Venetian Identity of the prof. Ermanno Serrajotto, has believed in the project. 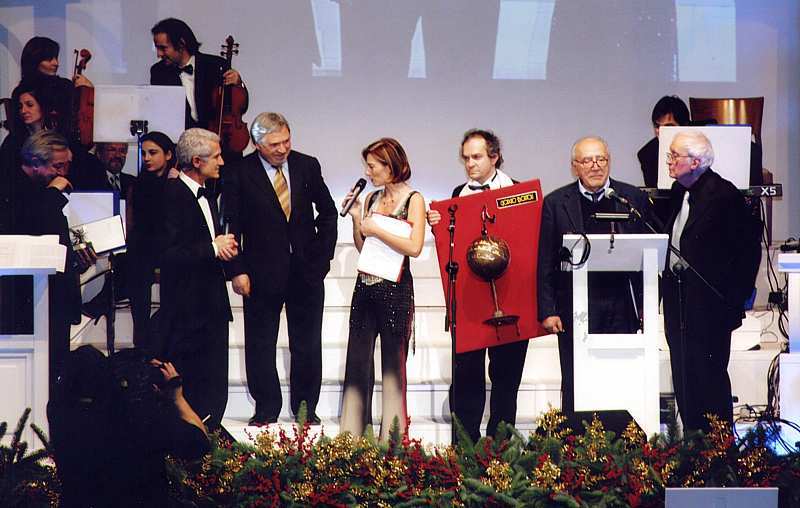 To such end in to introduce the gold bulletin-board of some winning ones of the editions of these 50anni: Mine, Nilla Pizzi, Gino Latilla, Carla Boni, Tonina Torielli, Claudio Villa, Julia De Palm, The Quartet Cither, Jo Sentieri, Patty Pravo, Renato Zero, Caterina Caselli, Franco Simone, Pupo and so many others, are convinced that to aim to high-levels is not impossible, it takes however that, is wanted him Really. 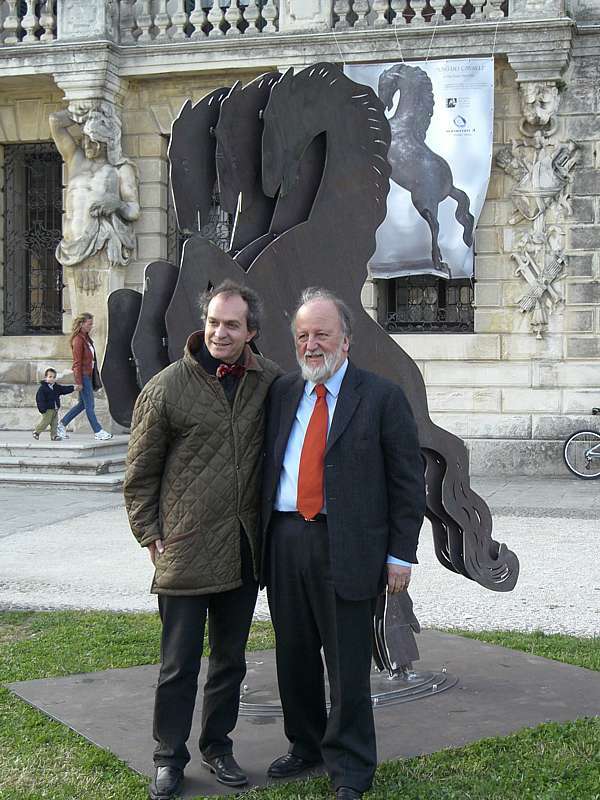 The sculptor Giorgio Bortoli, author of the New "silver Gondola"
E IMPRIME FORME NELLA MATERIA"